< Please leave this field empty. I offer wisdom based upon decades of experience, skill, and talent performing several trades. 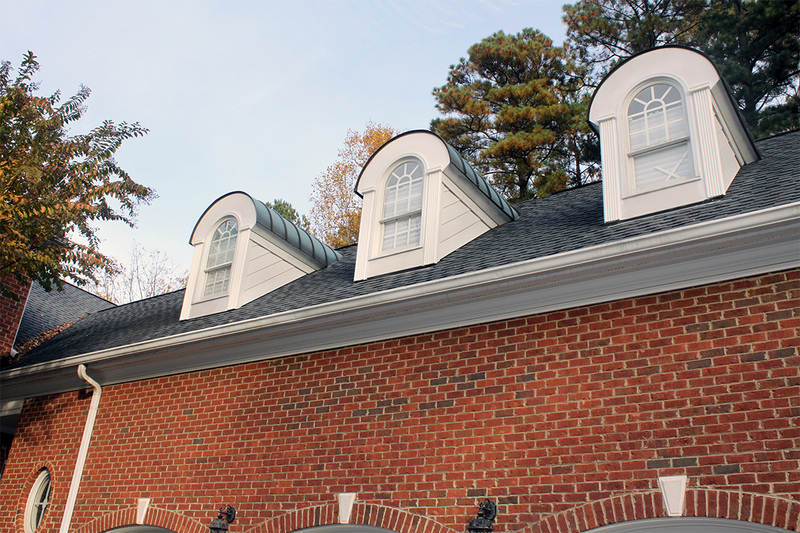 Quality home improvement projects, remodeling, repair, and restoration services are available cost-effectively. 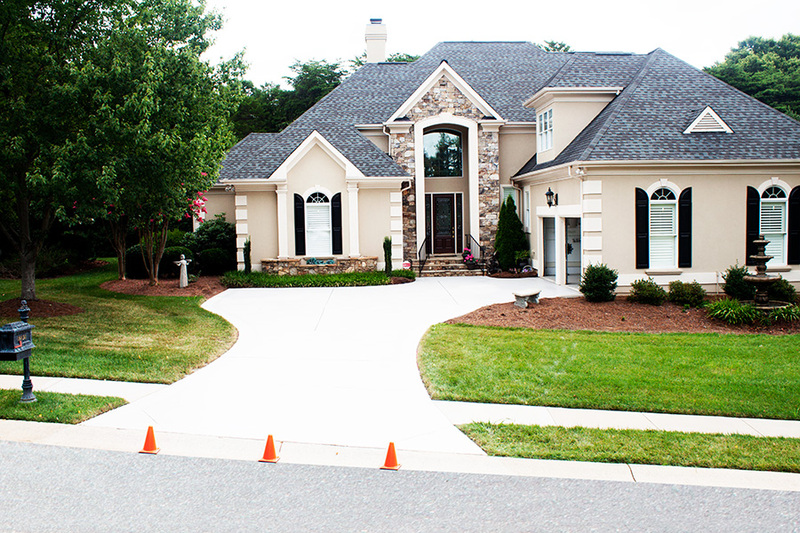 As a former nationally certified home inspector each project I perform meets or exceeds community standards. By visiting the TESTIMONIALS page you will find numerous written accolades by customers. 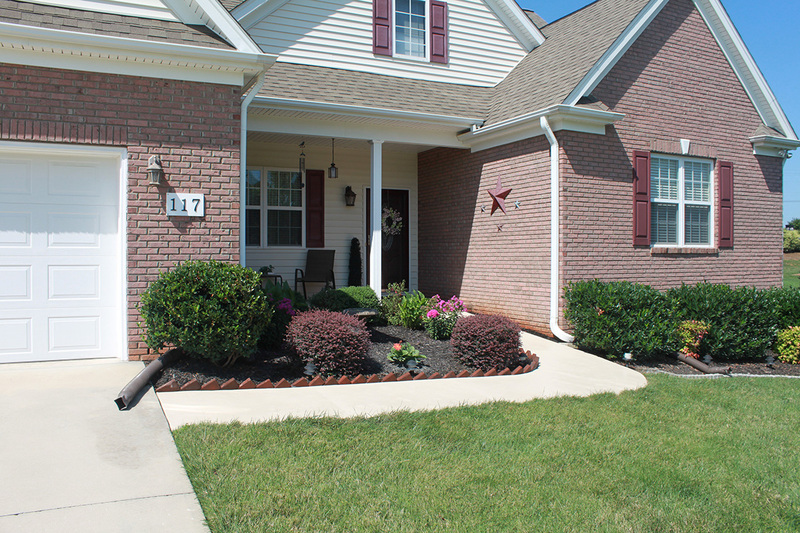 Many customers share a common experience because I offer prompt, professional, and cost-effective workmanship. The TESTIMONIALS page shows many references written by senior citizens. I enjoy assisting senior citizens because our senior citizens deserve to rely upon a local source of experience, skill, and talent to achieve cost-effective solutions. As you review the projects keep in mind many homeowners enjoy pitching in to save time and money. I offer a DIY service to teach senior citizens how to do some of the work themselves to save time and money. 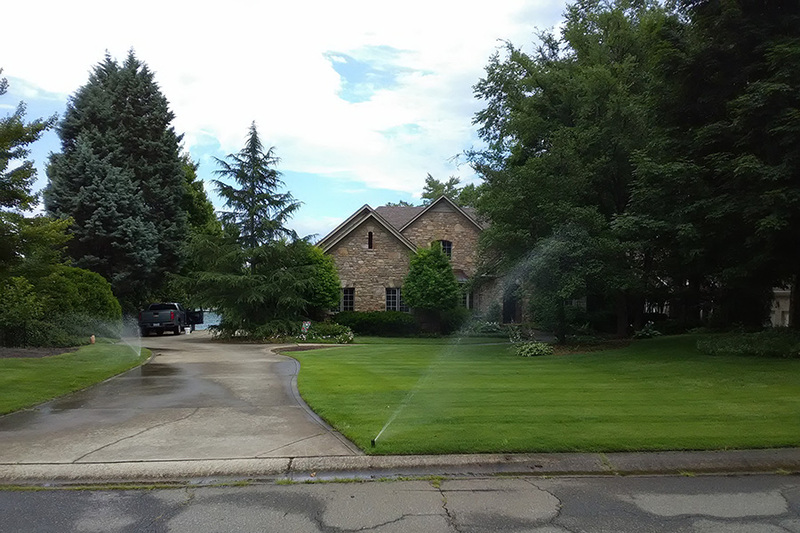 Several local homeowners have saved a substantial amount of time and money by pitching in and performing some of their own labor to reduce the cost of their projects. The property owners reside in The Point fronting on Lake Norman. 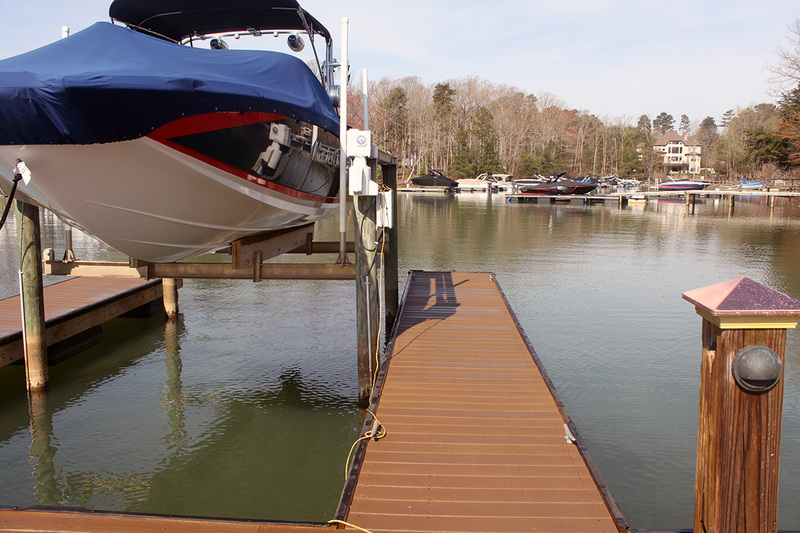 As the owner of a real estate development and commercial construction management firm the property owner could have selected and relied upon any number of local dock experts. Upon my initial onsite inspection the existing dock needed a spring cleaning and structural work. 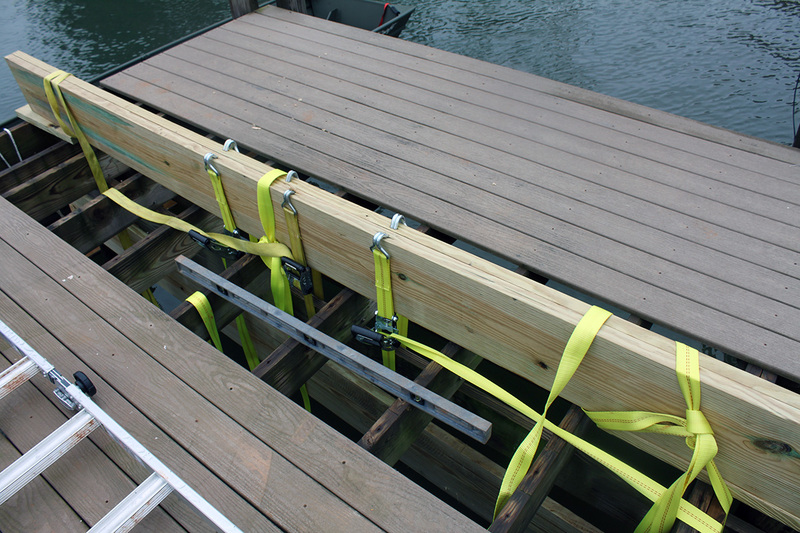 Three dock stringers were reinforced and ramp glides were removed and replaced. 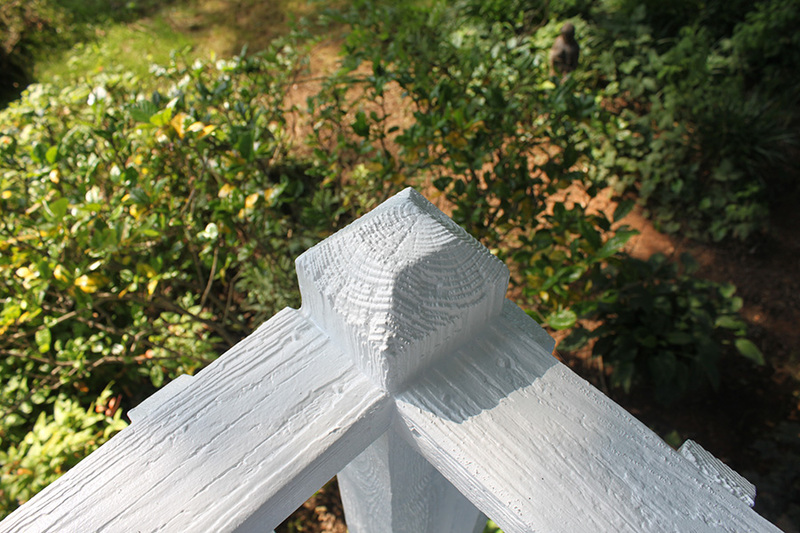 Rope rail post were tightened and rope replacd. Rail caps were replaced. 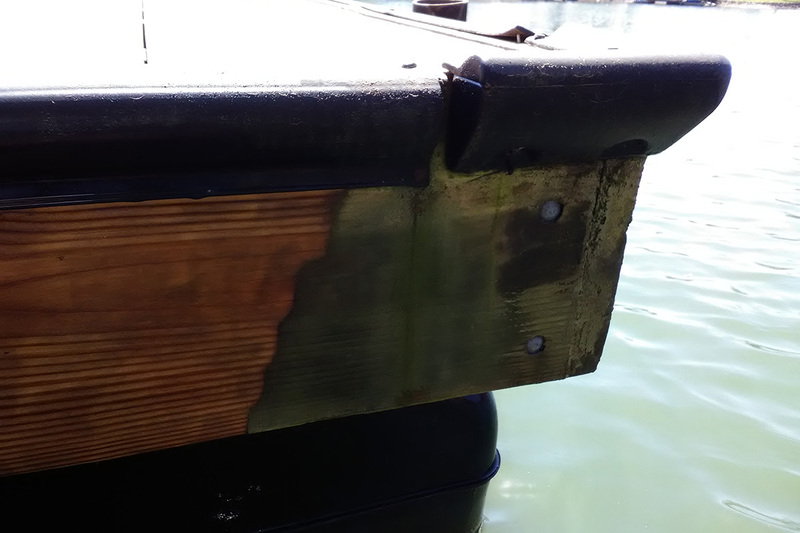 The resulting dock repair potentially extends the use and enjoyment of the existing dock structure many years. My wife and I hired Designtech Projects to repair our dock. The owner Kevin Stagl was great. From the beginning of the project until the end Kevin was informative, meticulous, and price conscious. A definite thumbs up. 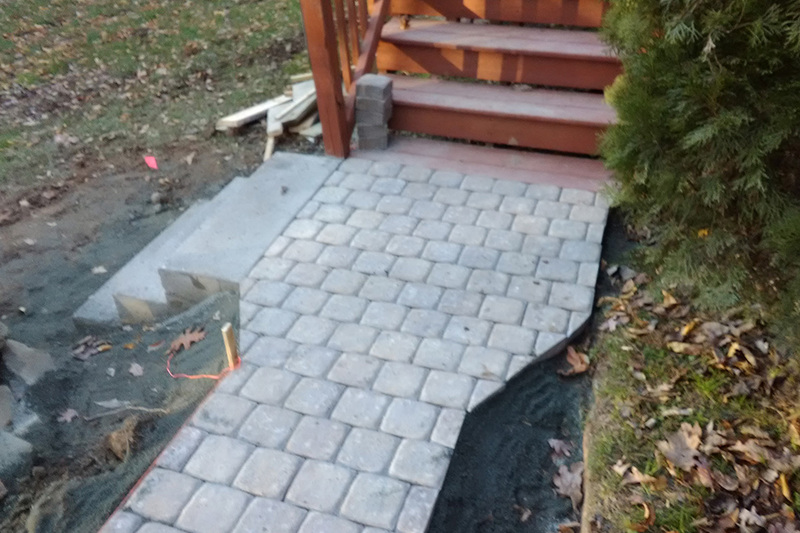 The property owners requested the removal of an existing wood deck in order to place and finish a spacious concrete patio. 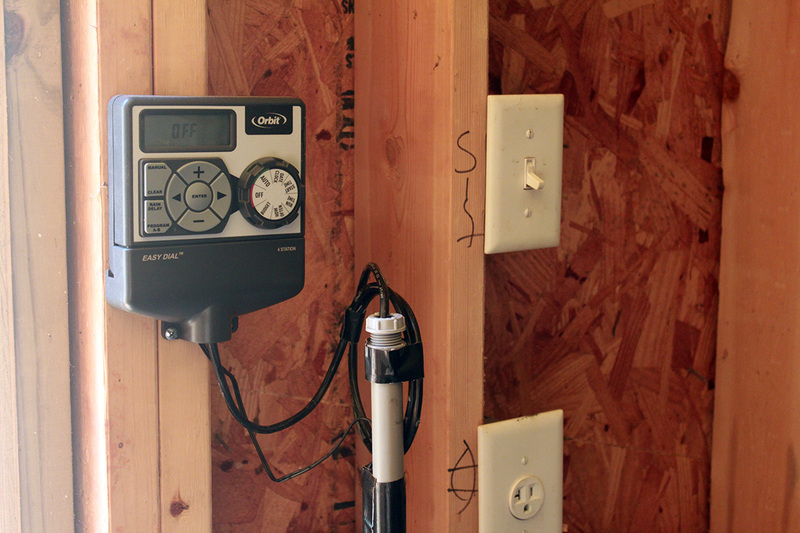 The irrigation controller was reinstalled. Four specimen trees receive stack block. 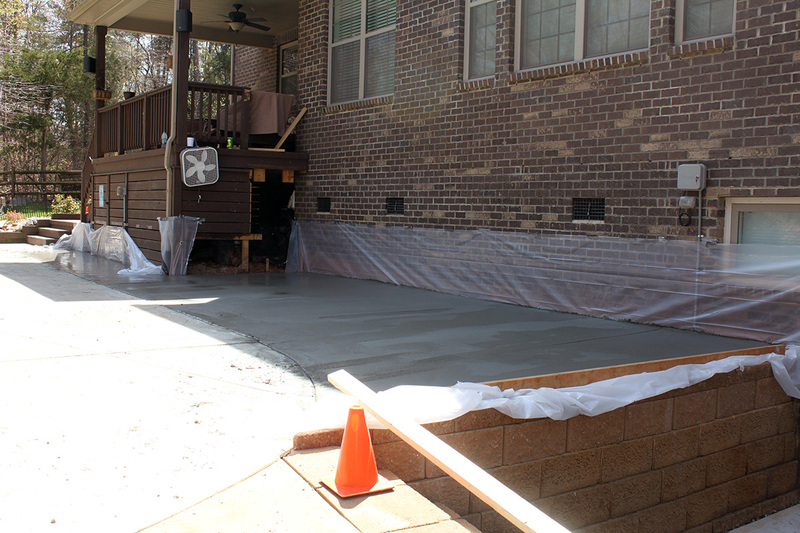 The existing concrete pool deck and the newly placed concrete patio will each be ground using an industrial diamond grinder to prepare both surfaces for the forthcoming concrete coating application. 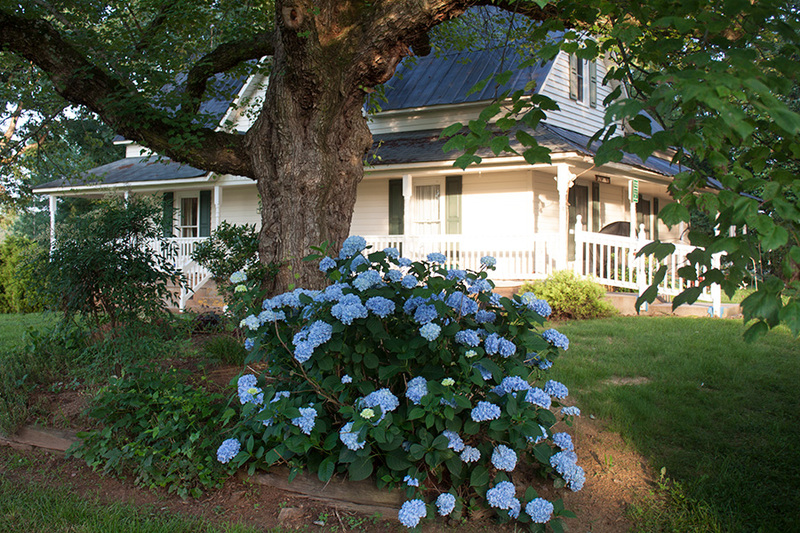 The property owner resides in a local Waterlynn residential home community in Mooresville. 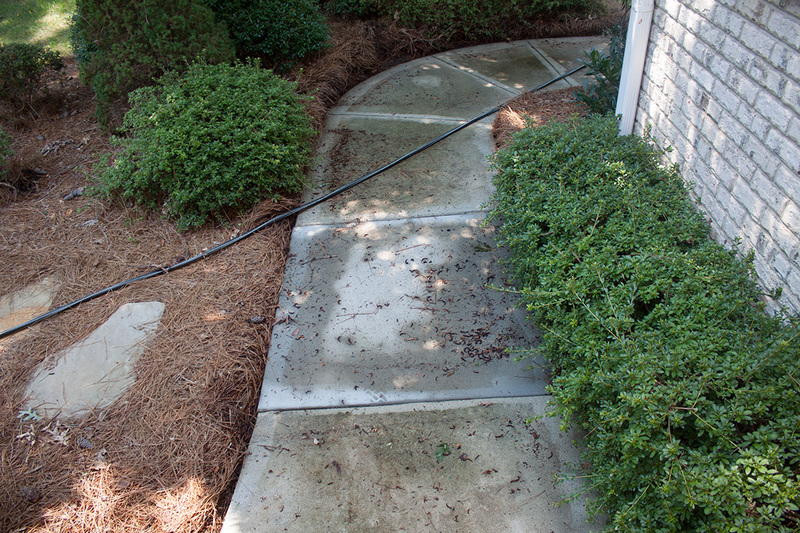 Upon initial inspection, the existing concrete surfaced were pitted, cracked, and the color was worn out. A double coating of acid wash and back to back pressure-washing removed substantial surface blemishes, mold, and other organic crud. The cracks were filled with a cementitous filler. 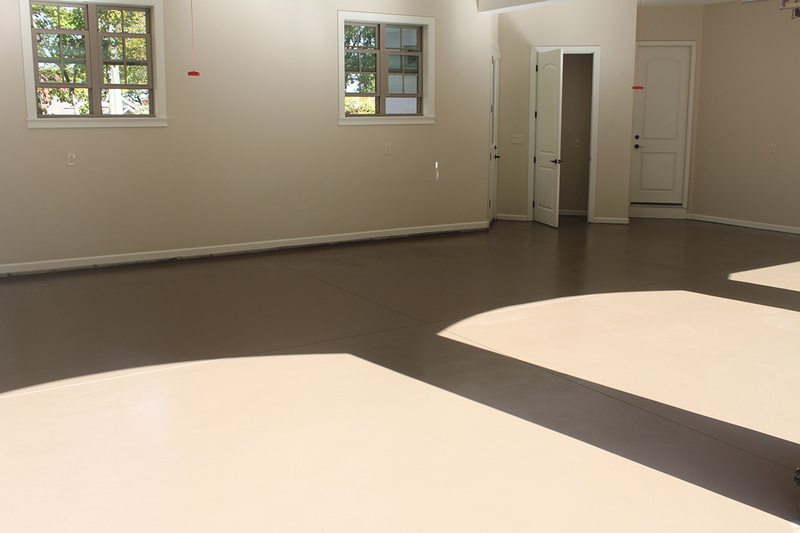 Two coats of custom color concrete coating gives a desirable appearance of a new concrete surface while avoiding a far more costly surface grinding. Kevin did a great job of repairing my concrete patio and porch which both had large cracks and some wearing from a prior stain. The job involved several processes in order to do the job right. No shortcuts were made. Actually the original color choice somehow didn’t quite match the sample, so Kevin got it replaced with a better color match without further charges. When the job was done, he put all the outside furniture back in place and now it all looks like new. 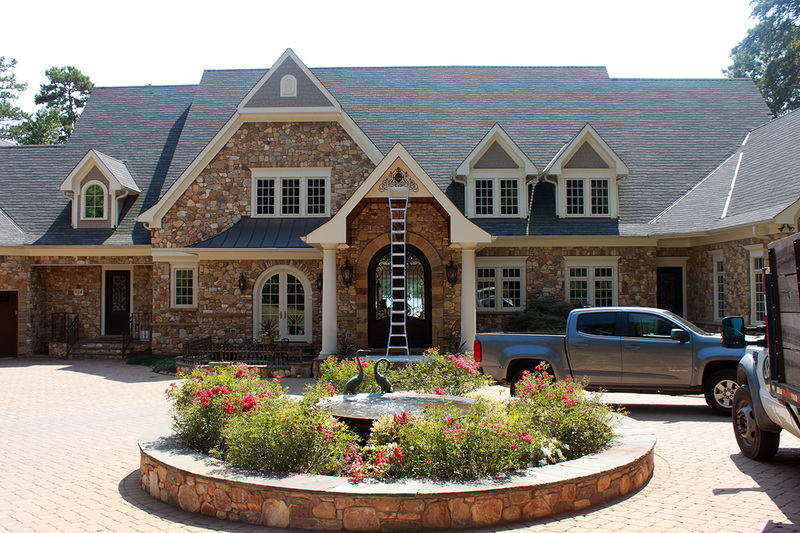 This luxury home fronts on Lake Norman. The property owners requested an outdoor kitchen. The design and appliance selection tasks were each decisions by the property owners. 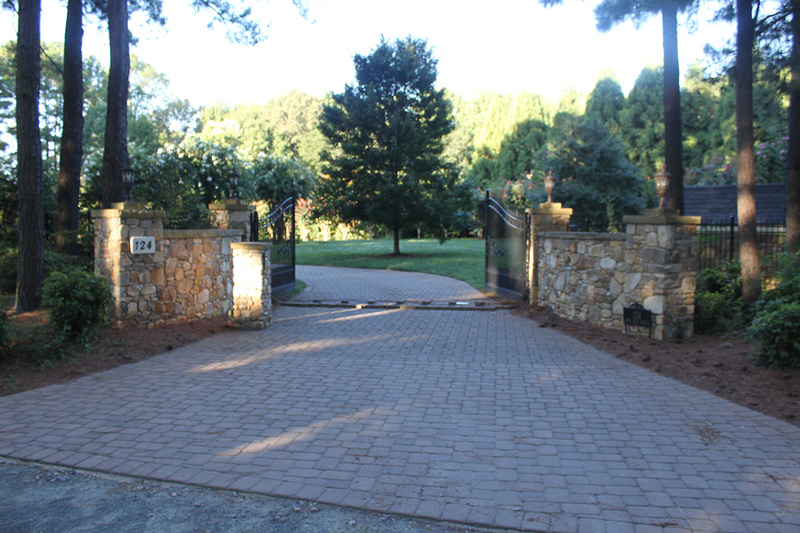 The cutting and grinding of granite was performed by another local contractor. 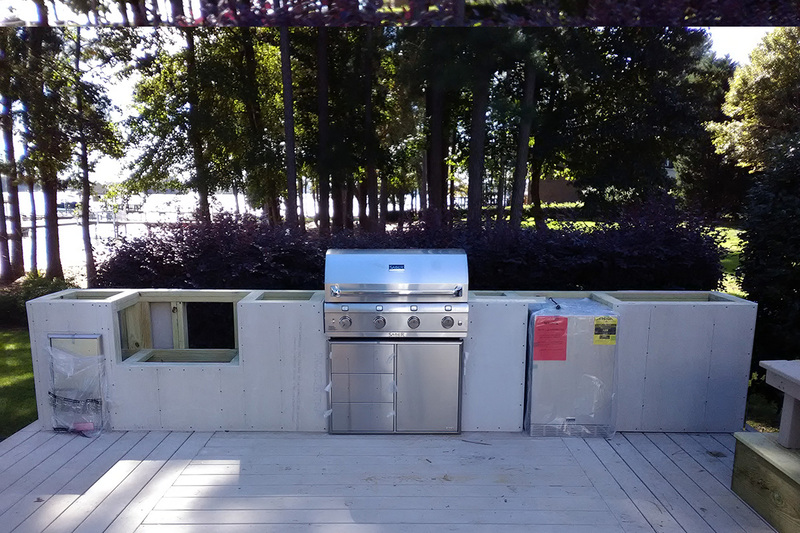 I reinforced the existing deck structure, framed the new kitchen, installed cement board, installed stack rock facade, and installed the stainless steel appliances. I never got around to formally thanking you for your work. 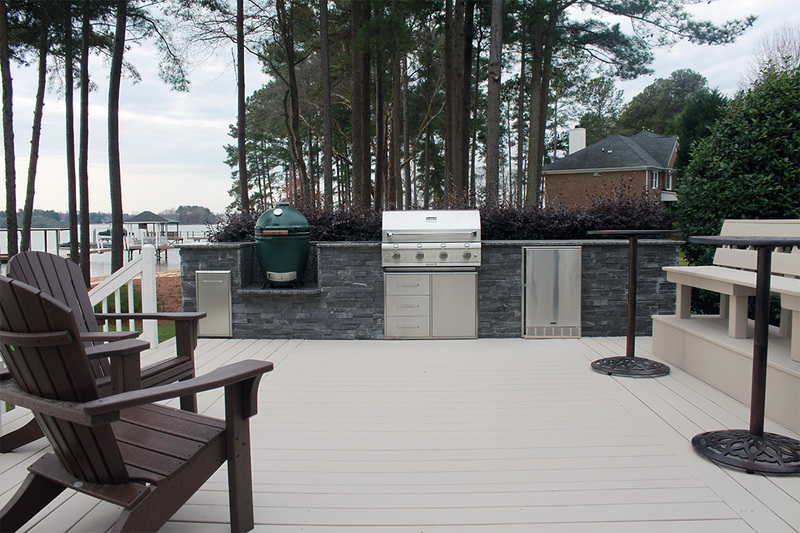 The work you performed on our outdoor kitchen is amazing! The deck is amazing!! Thank you!!! This luxury home fronts on Lake Norman. A second floor overlook contains a herring bone tile floor. This exterior exposure is subjected to frigid winter weather blowing off the lake, and direct sun in the hot summer months. The expansion and contraction caused cracking to occur between the tile. My role was to grind the cracked grout lines and repair that tile floor utilizing an application of a polymer-based grout to maintain maximum flexibility winter and summer. This luxury home fronts on Lake Norman. The property owners requested a clean and painted mailbox. 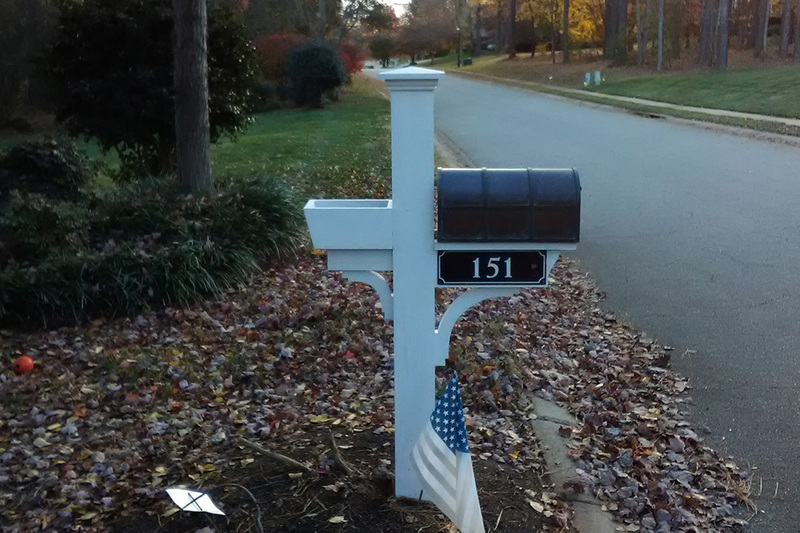 After a thorough cleaning, the mailbox was coated with a high-quality stainblocker and sealer. This luxury home fronts on Lake Norman. 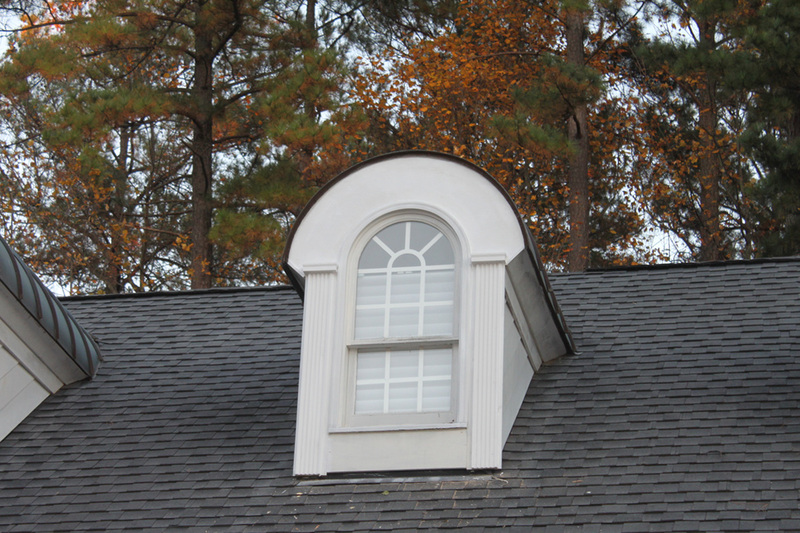 The property owners requested to remove and replace window trim on the exterior of three second-story dormers. The work is scheduled to be completed soon weather permitting. Working safely and securly is a crucial business practice, therefore I will be working on the second floor from within an arial lift. The property owners win-win, because as soon as the exterior trim project is completed the same arial lift will be utilized to trim crepe myrtle trees. This luxury home ofers an exceptional backyard surrounded by majestic trees and private green environment to relax. 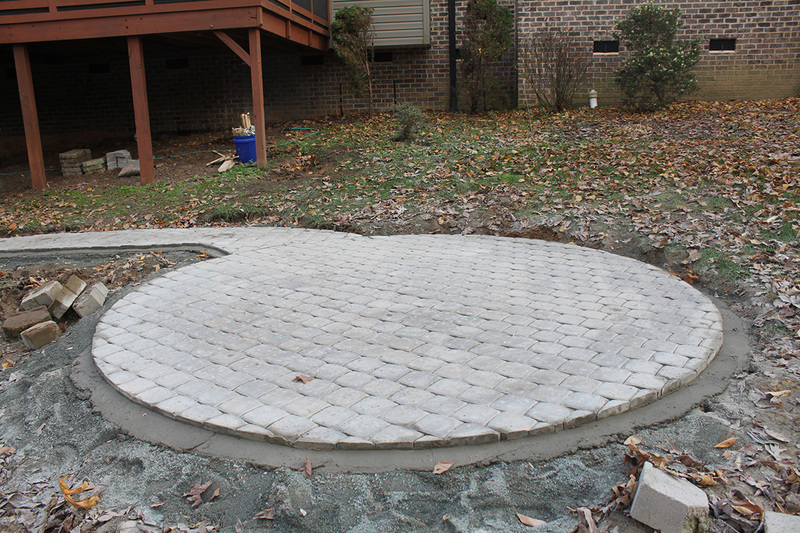 The property owners requested a paver sidewalk and fire pit project. You persevered despite the rain. The pavers and fire pit project is absolutely fantastic and so much better than I had anticipated. This project has really added to the whole landscape. 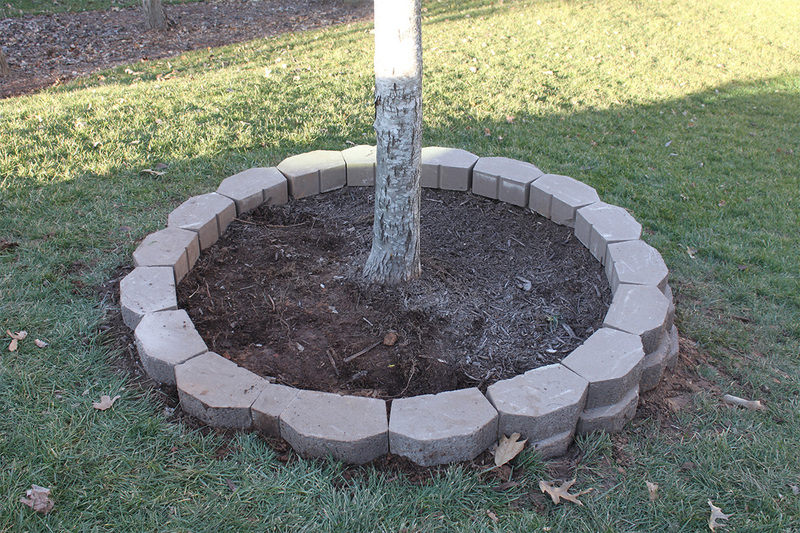 I can’t wait to plant my flowers in the planter area you integrated into the stack block wall design. This luxury home fronts on Lake Norman. 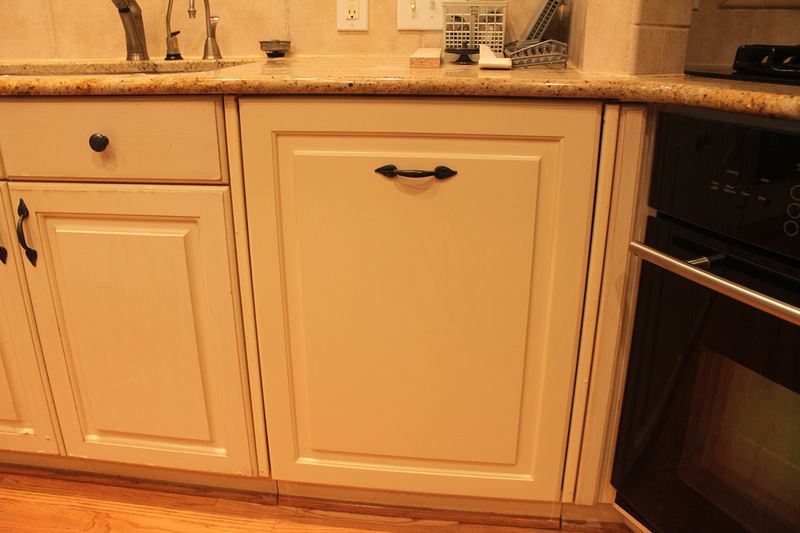 The property owners requested several home improvement projects including refinishing a kitchen cabinet door to eliminate surface imperfefctions. 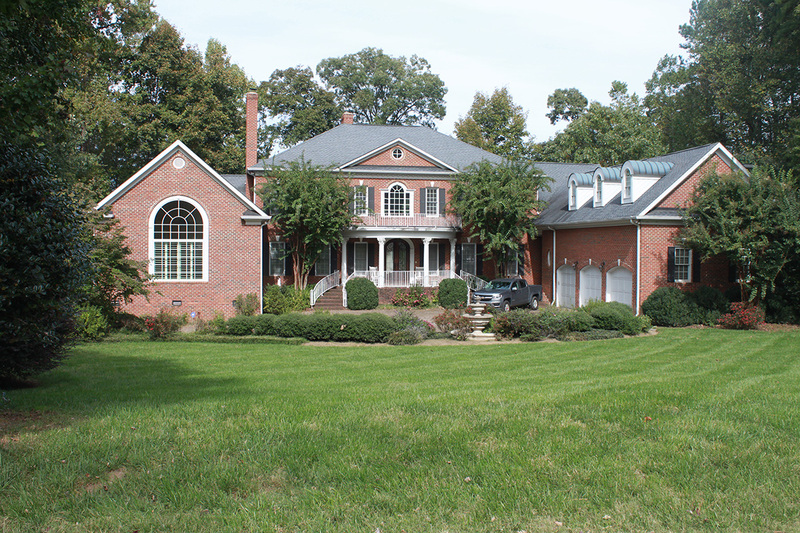 This luxury home fronts on Lake Norman. The property owners requested several home improvement projects including installtion of interior trim to distinguish the walls and ceilings. This luxury home fronts on Lake Norman. The property owners requested several home improvement projects including repairs within bathroom, bedroom, closet, and storage area. This luxury home fronts on Lake Norman. 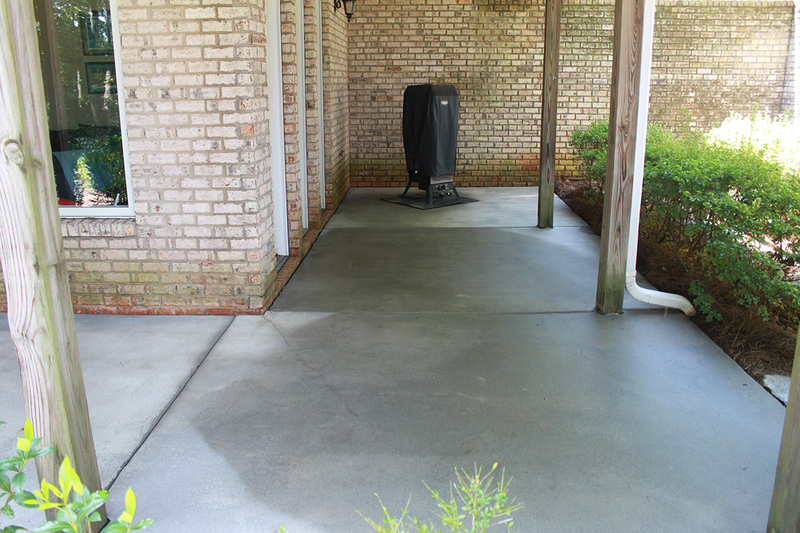 The property owners requested a garage floor coating and patio coating. The industrial clear-coat and clear coat are solvent-based applications. Unlike water-based paints, the high-end solvent-based applications typically wear better and last longer. This luxury home offers a second-story landing complete with two wall sconce fixtures as shown. 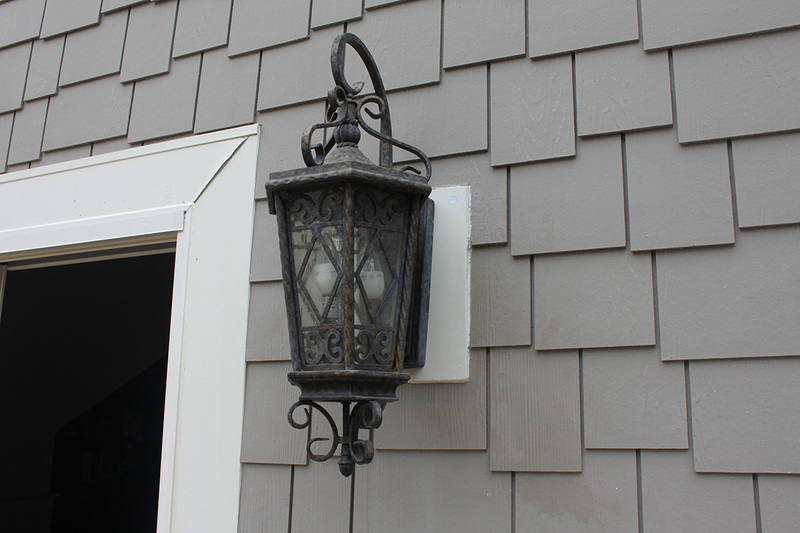 Each wall sconce backer board was loose due to aging, rusted nails. The backer boards behind each of the electrical fixtures were repaired by drilling, countersinking, and tightening coated screws to tighten and secure each of the electrical wall sconce fixtures. 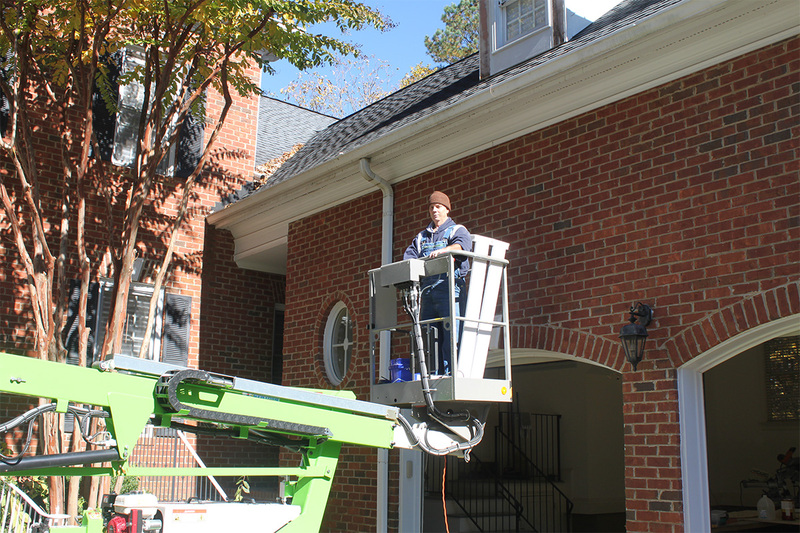 This landscape drain pipe repair project consisted of several tasks. The first task was to dig up the existing drain pipe and determine an appropriate pitch plus repair a small hole in the top of the drain pipe. 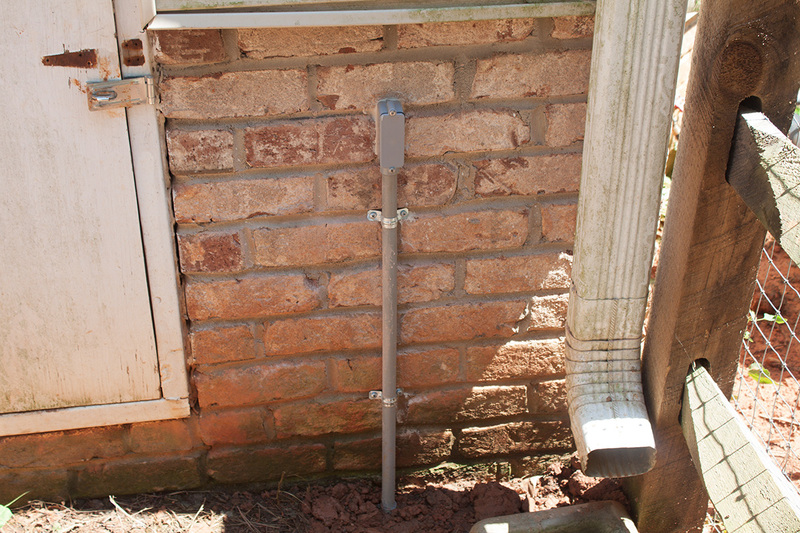 Next, the existing drain pipe was properly pitched to overcome the prior slow-drain. 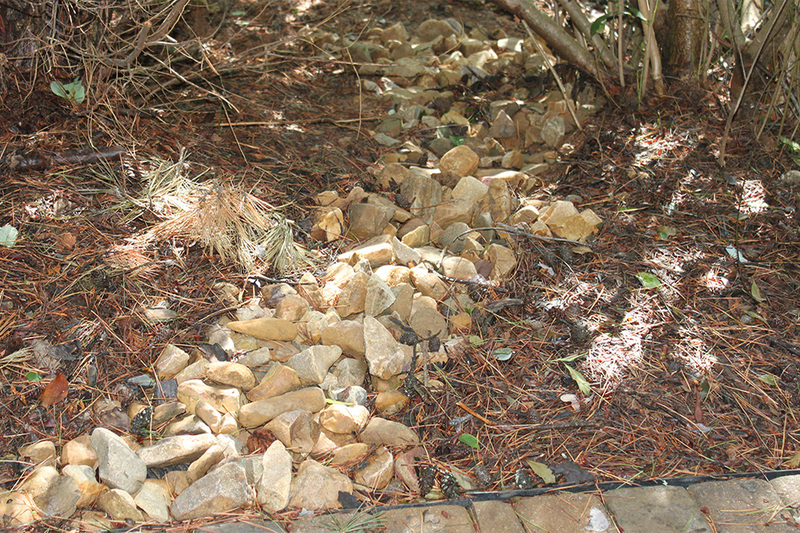 After proper pitch was achieved and water now running properly the river rock was added to prevent soil erosion. In a forthcoming second image the river rock is added on top of the pipe and the landscape island cleaned and raked. This luxury home offers a magnificent loggia structure overlooking the swimming pool and overlooking Lake Norman. 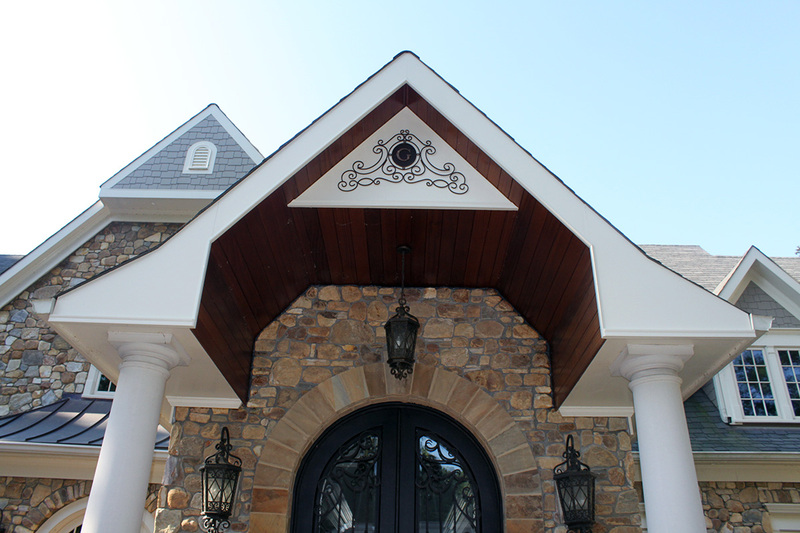 This project involves the repair of loggia facia trim. 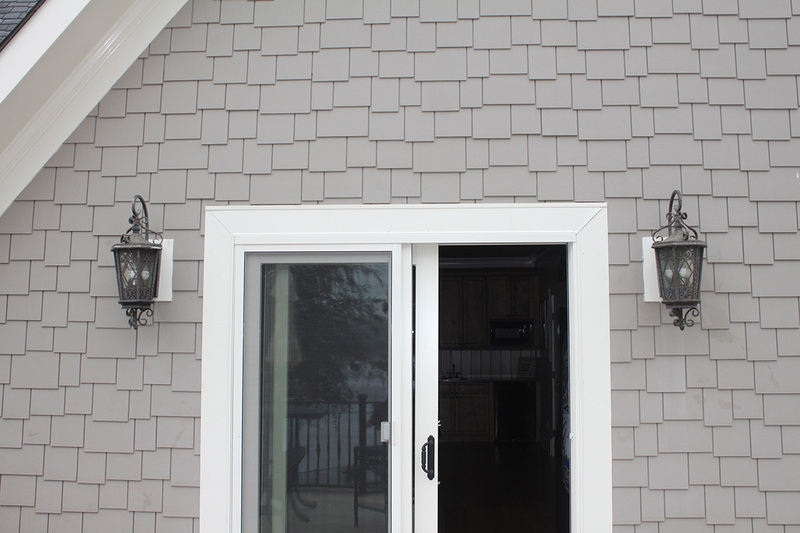 In addition to scraping, sanding and filling tasks that multi-layer facia trim needs caulking, stainblocker, and a fresh coat of exterior trim paint. 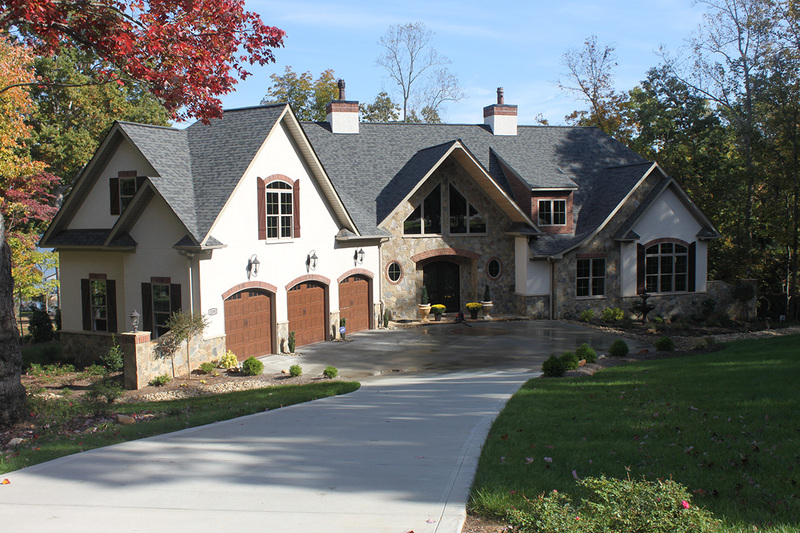 This luxury home fronts on Lake Norman. 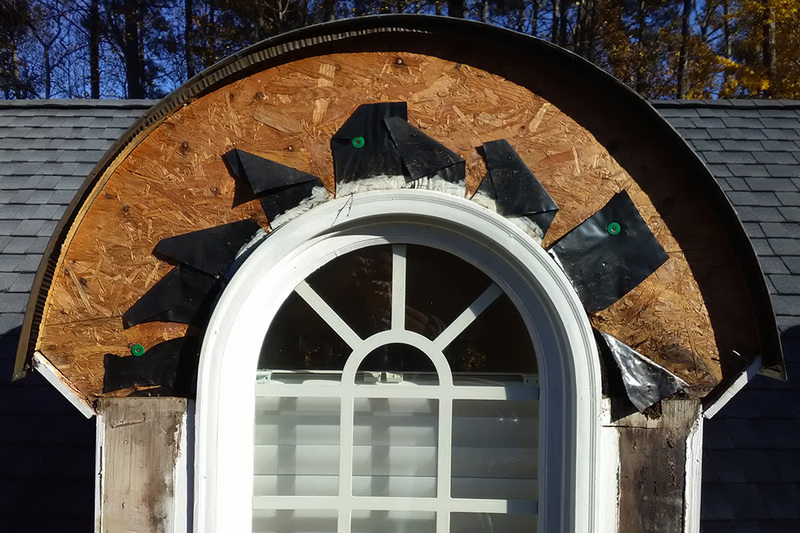 This project involves the exterior trim above the front entry. 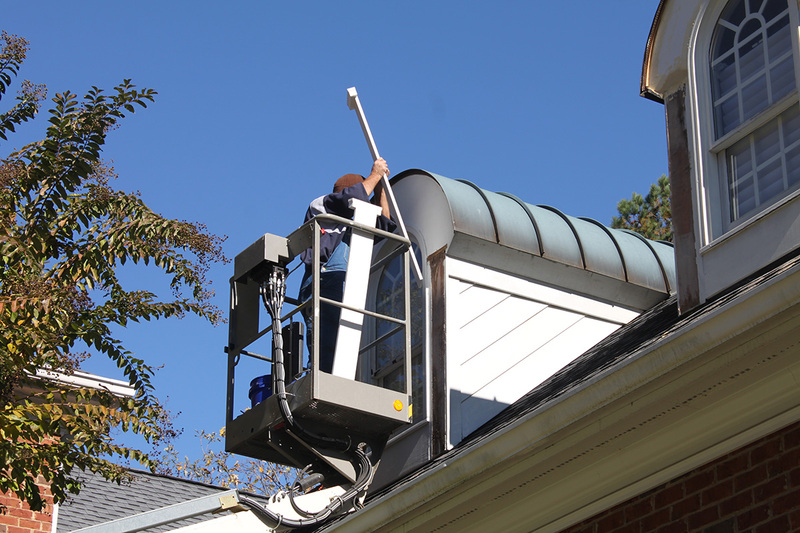 The initial work involved a 21′ ladder balanced on the front steps. That ladder work required extensive lean left and right, whereupon a boom lift was a safe solution eliminating ladder risk. 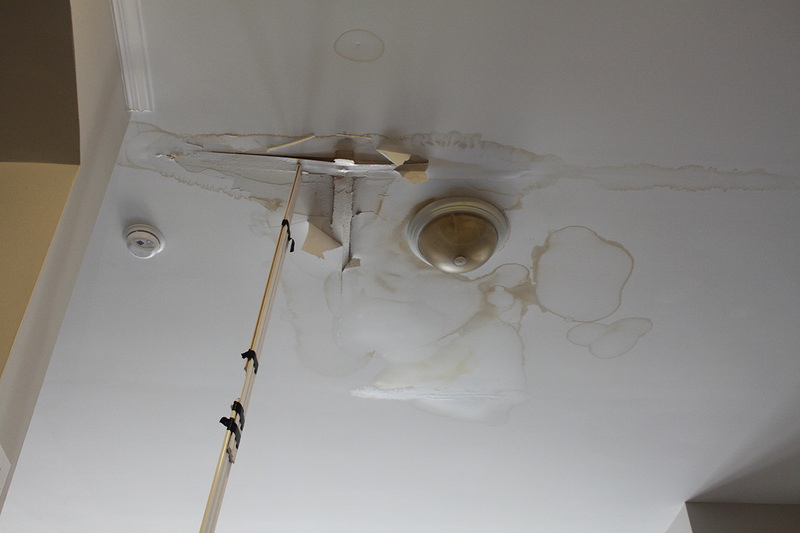 This rental home suffered an HVAC leak resulting in water dripping from the attic onto the second-floor ceiling. 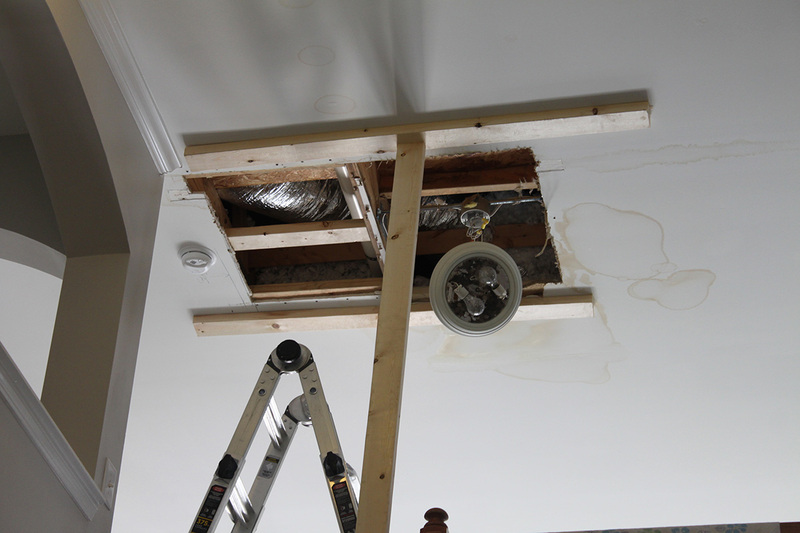 The resulting water stains and soaked drywall require a large ceiling patch with numerous coats of fresh compound and stain blocker prior to paint. 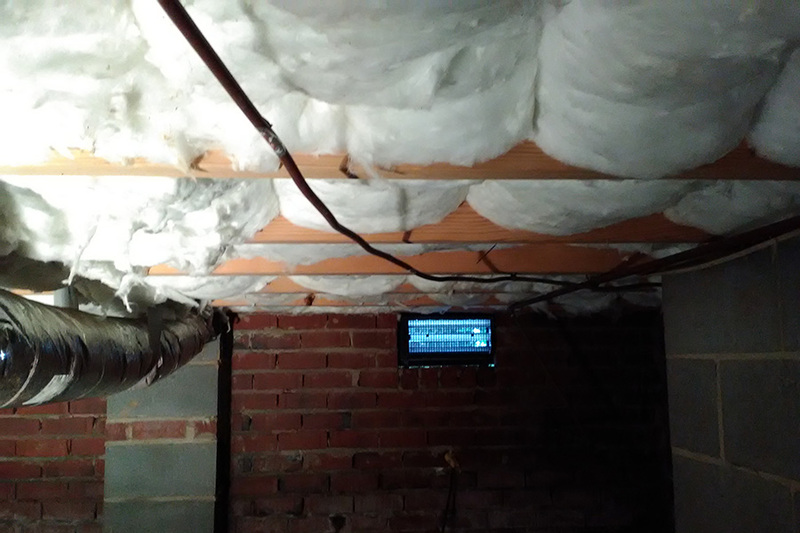 Designtech Projects offers rental property repair. This local property owner resides in The Point. 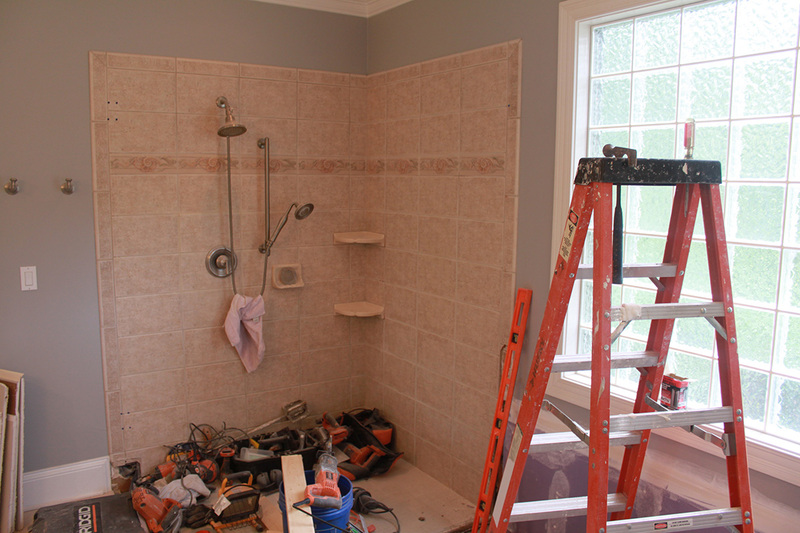 As a retiree, this property owner assisted during his DIY project to upgrade and remodel his master bath. 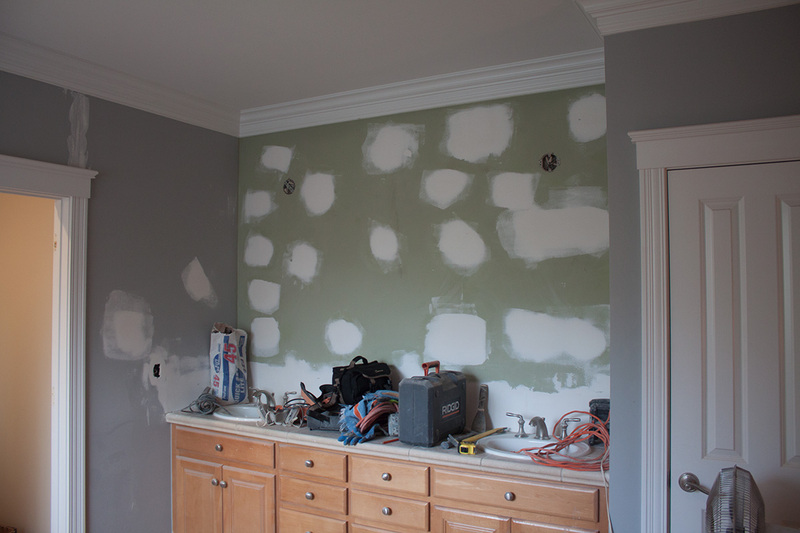 This DIY property owner worked long, hard hours for several days to perform portions of the demo of spa tub, removing drywall, removing a wall-to-wall mirror, plus tearing out wall tile and floor tile. 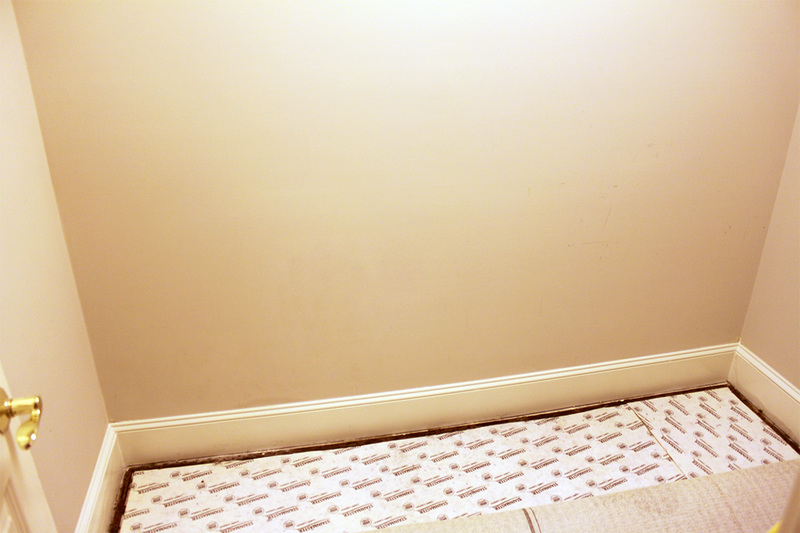 This project will wrap up by installing 2 layers of floor underlayment in order to prepare the floor height in anticipation of the arrival of new wall tile and floor tile. 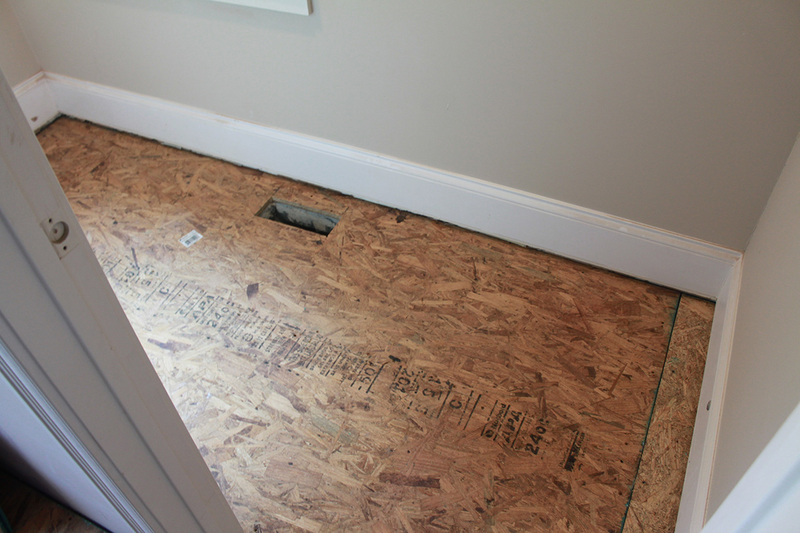 The property owner’s DIY services, including working side by side on flooring resulted in considerable discount equal to a savings of three days labor. Kevin did a complete master bath demolition which included removing a raised Jacuzzi tub, bathroom floor tile, shower tile and backer board, and a large 8’ x 5’ mirror. 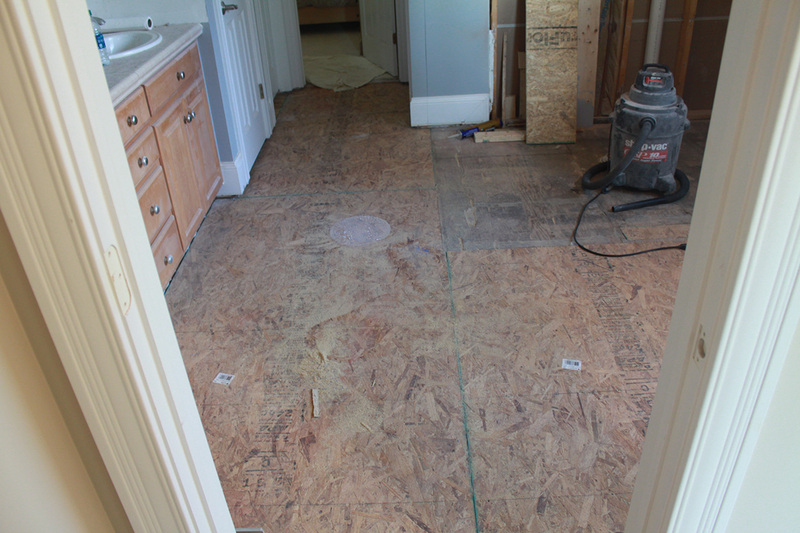 The project was made all the more difficult by a 2” concrete like material that had to be removed across the entire bathroom floor and then the area built back up with plywood to accommodate the new tile. Other projects included putting slats in a wall between 2 x 4 studs requiring intricate drywall cuts to make clean corners, fixing several cracks in the drywall throughout the house, smoothing an arch separating the kitchen and living room, and repairing about 10 feet of paver stone walkway that had become separated. Kevin did great work on all the projects. Kevin is a professional and extremely knowledgeable of all the building trades. I highly recommend Keven for any project (big or small) you may have around your home. Kevin is also dog friendly. 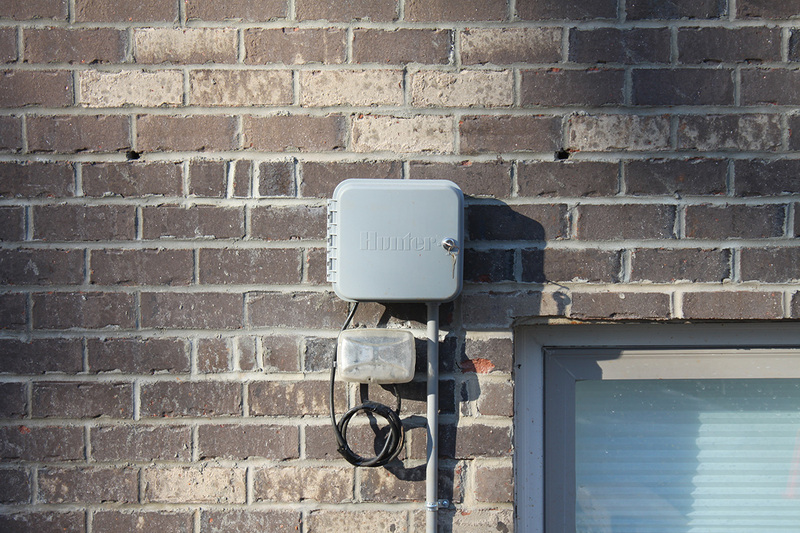 This local property owner suffered the loss of gate motors due to lightening strike. The property owner ordered and installed new gate motors. 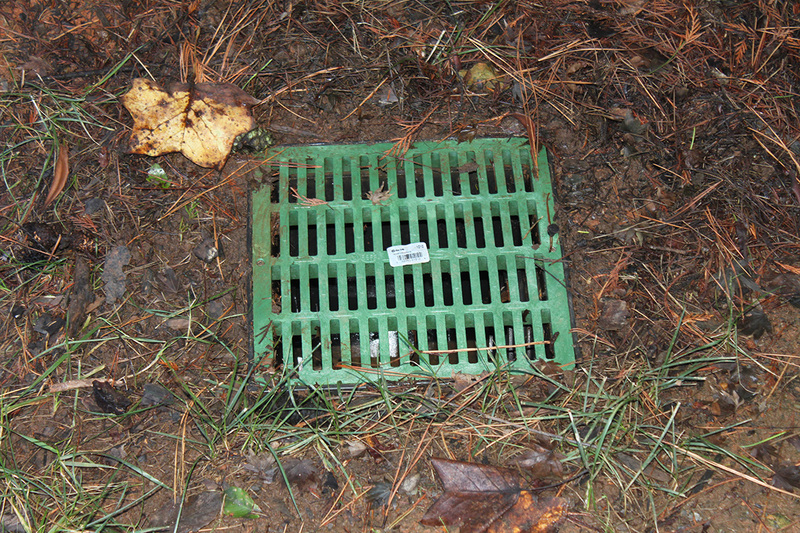 I was retained to remove driveway pavers, trench across driveway, and subsequently reset driveway pavers after the property owner installed his direct burial gate motor cable. 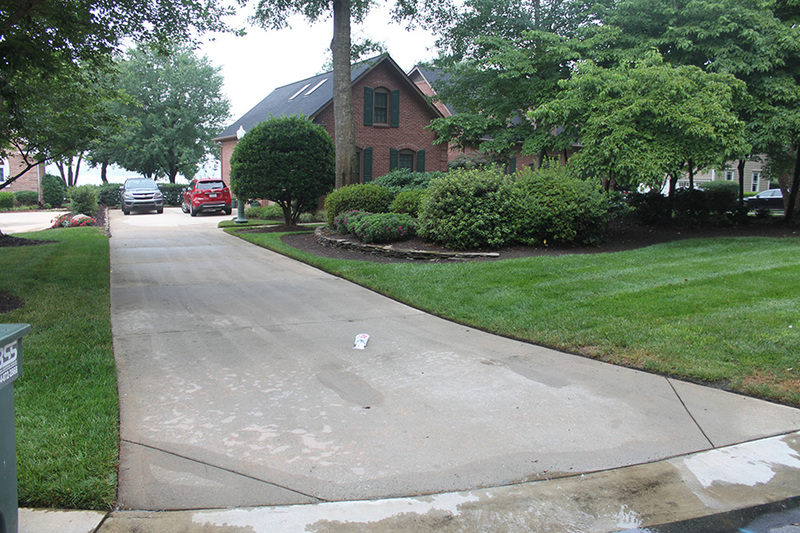 This driveway project included a deep cleaning alomg with substantial reduction of surface mold, mildew, pitch, algae, and other environmental growth. The mulch and grass to follow. The concrete looks good. Will keep you in mind for other jobs. 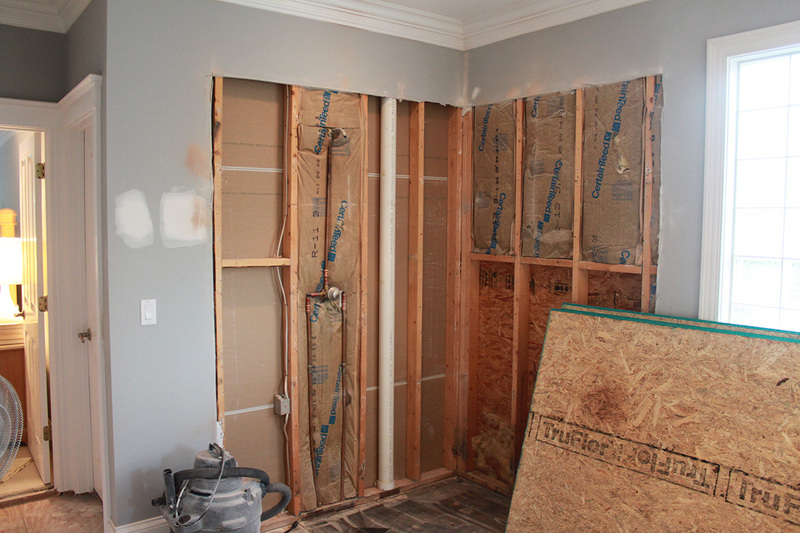 This project involves hanging and finishing drywall following a water leak. The drywall repair in garage looks good. Will keep you in mind for other jobs. 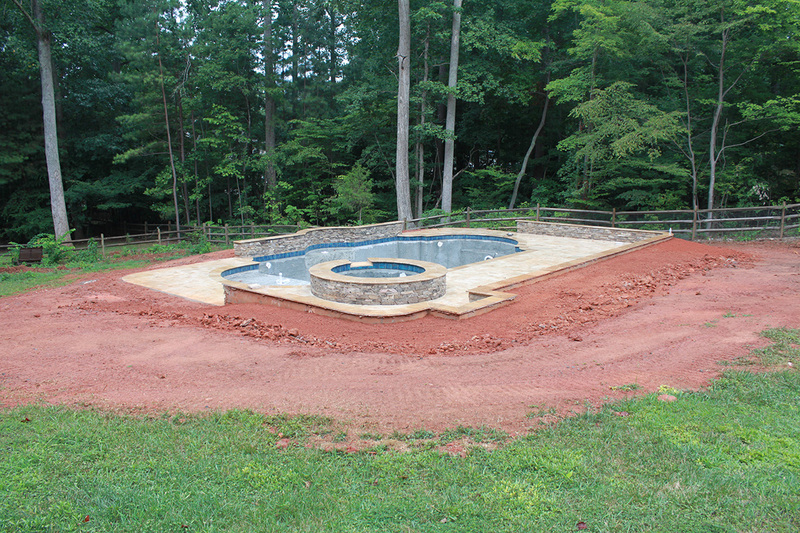 This landsdape project begins with grading of soils around the new swimming pool. With the soil in place the irrigation system is installed. 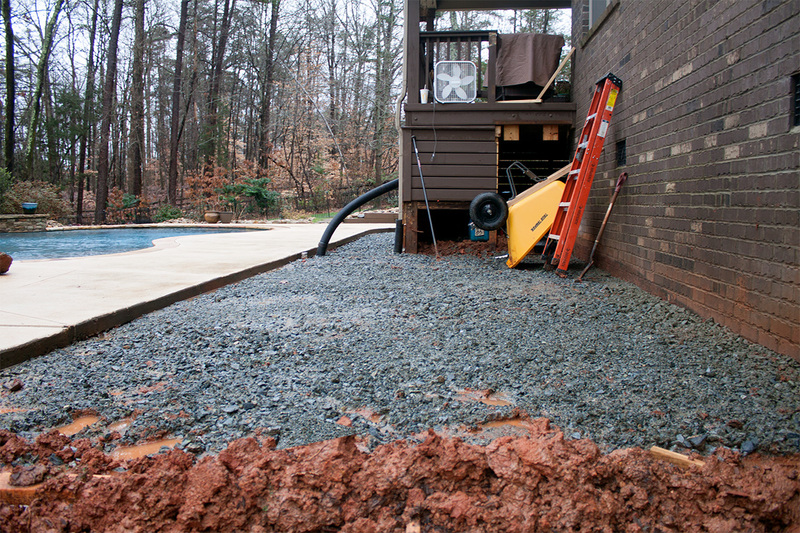 Additional soils will create a smooth transition in the backyard and behind the pool. 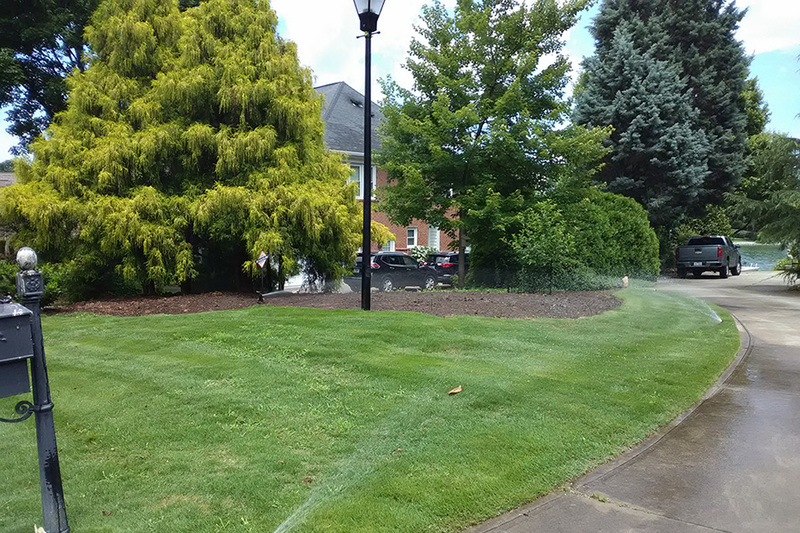 The plants, specimen trees, and privacy hedges coming soon. These property owners are local senior citizens. During a winter freeze salt was utilized to melt ice. The salt pitted the sidewalk surface. While grinding the sidewalk surface dozens of additional defect areas were exposed containing pockets of loose aggregate. To overcome deep ruts, I trowel-coated two coats of cementitious concrete coating followed by enamel stain. 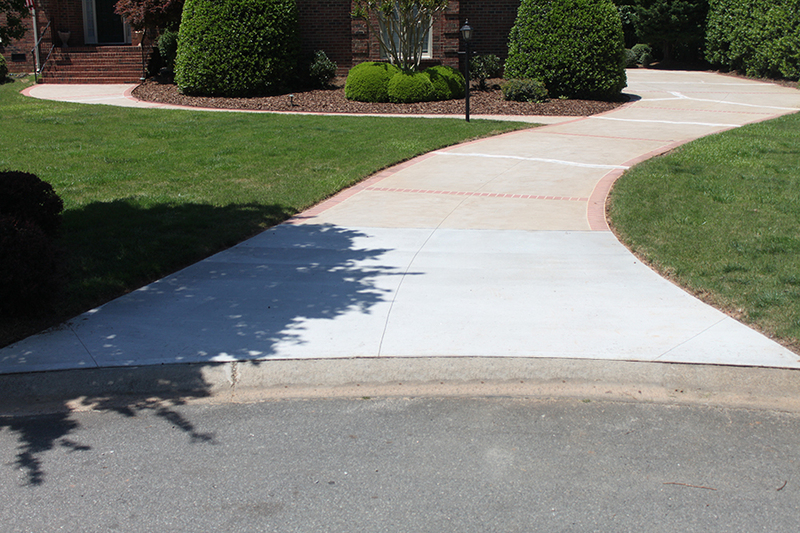 The sidewalk surface is now textrued to improve grip plus a non-slip additive was included during the stain application. 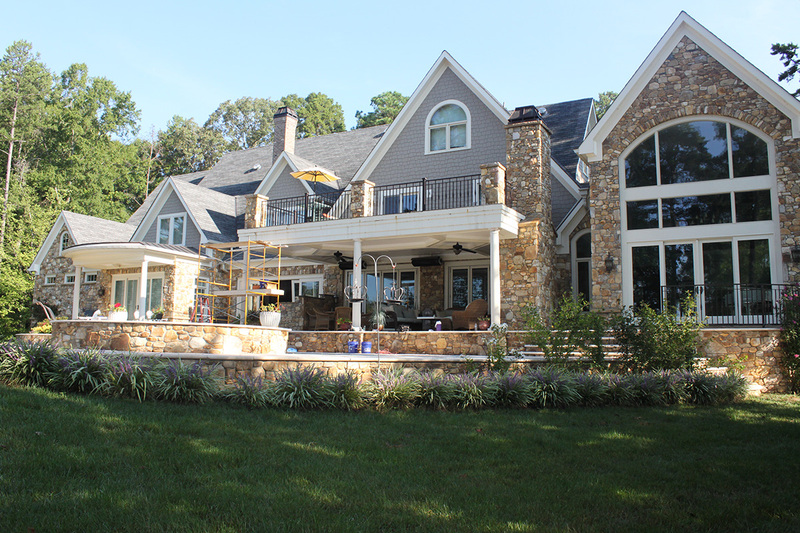 This project involves a residence located on Lake Norman. 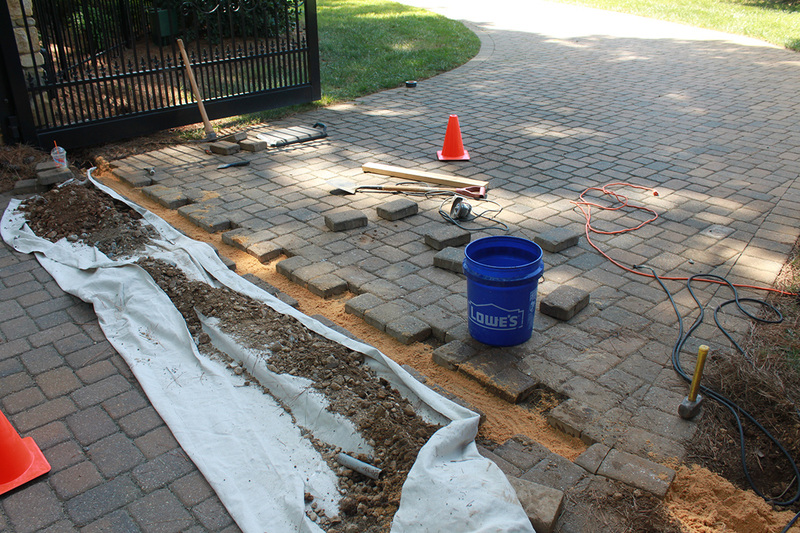 Prior to repair, the surface of the driveway was stained with muddy clay and dirty water due to a blocked drainage system. 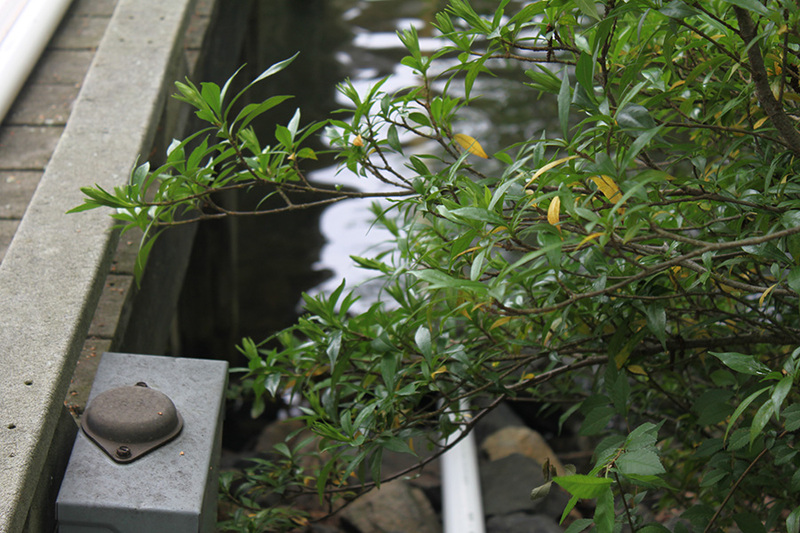 The drainage system was blocked with roots and cumulative collection of organic leaf-twig debris spanning several years. 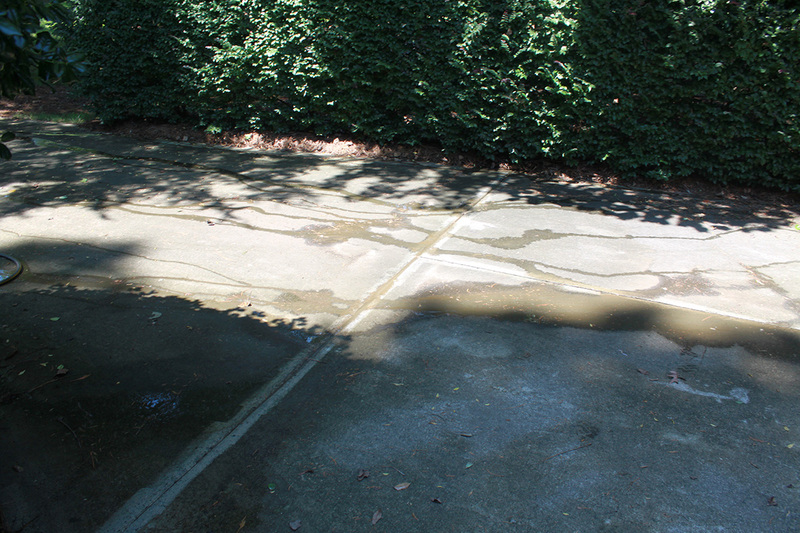 The pressure-wash task included acid-wash, cholrine treatment, and two-coats of concrete driveway sealer. 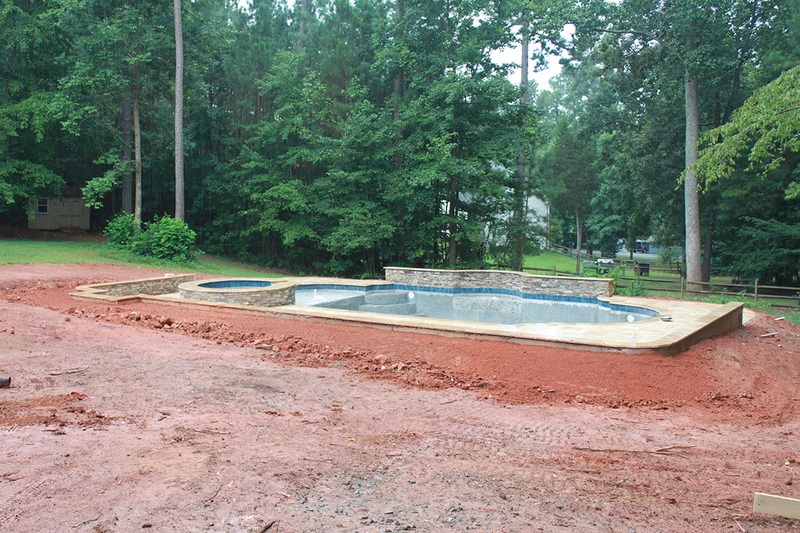 This project involves a residence on the Peninsula in Cornelius, North Carolina. The retired Colonel retained my home improvement services to shot blast several layers of paint. 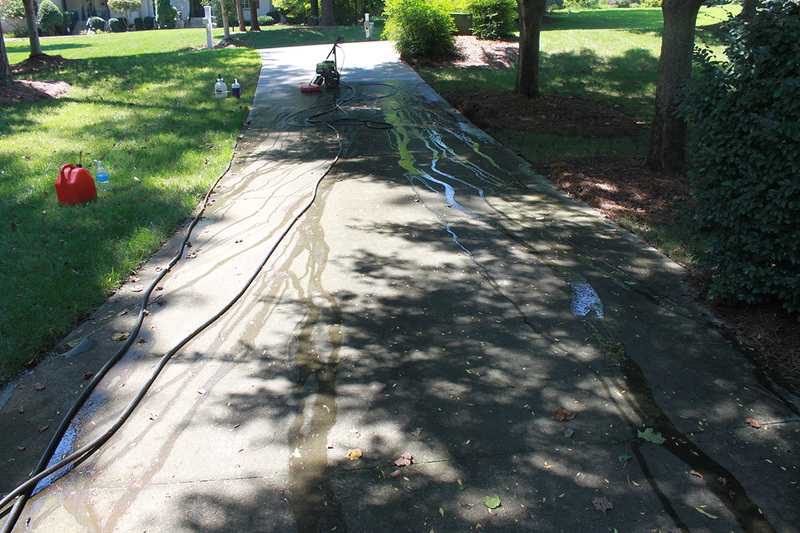 The shot blaster removes paint coatings from concrete driveway. 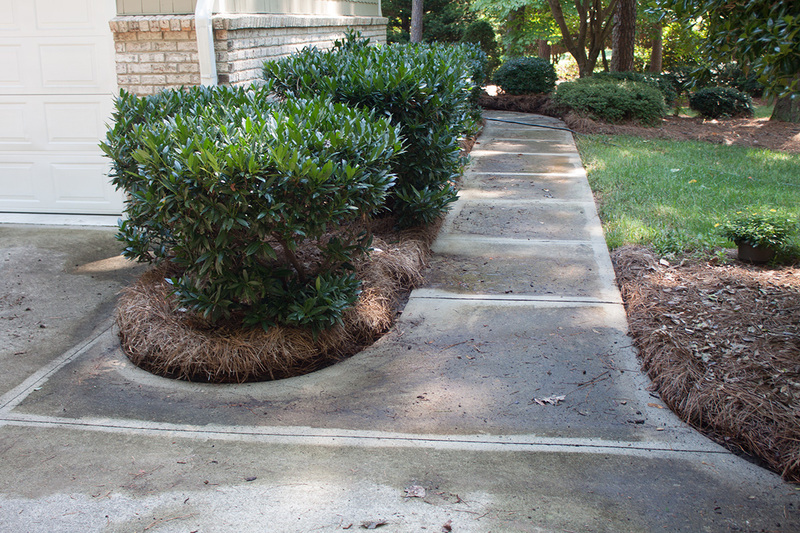 The removal of paint was followed by a treatment of muriatic acid, cholorine treatment, and pressure-wash. Several concrete driveway cracks were patched and the entire surface finished with Heavy Shield. 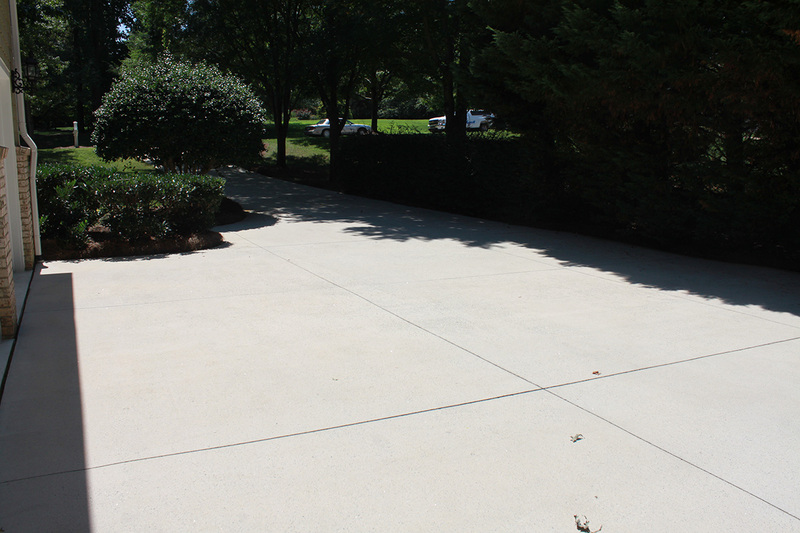 We recently hired Kevin Stagl to remove, repair and refinish our concrete driveway. Our driveway was installed 22 years ago when the house was built. Previous owners (4) painted the driveway numerous times which would peel especially on areas where our automobile tires would turn. In addition, there were numerous cracks in the surface. Kevin did an outstanding job removing the old paint, repairing cracks and repainting with commercial-grade enamel stain. This was a laborious job in a very hot July. Kevin was there everyday and always on time until job was finished. He has an outstanding work ethic and took this job when other contractors would not attempt. I consider his bill to be very reasonable. Honest and trust worthy. This project involves refinishing a hardwood maple table top. After years of use the family decided to refinish the maple top including repair, sanding, and hand-rubbed finish. I am a senior citizen. My dining room table was scratched in several areas. Other refinishers wanted a lot of money and they wanted to refinish the table at their remote work shop. Kevin offered to work at my home and promised to work for less money. He arrived onsite and draped a plastic tarp over the entire work area to seal airborne dust and then sanded the table surface in the dining room. 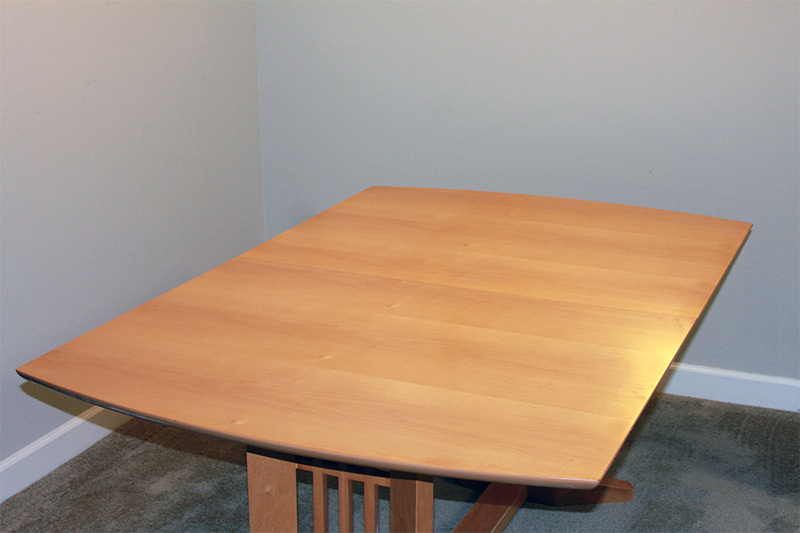 At the end of one day the table top was smooth as glass, several coats of hand-rubbed finish and he did the work for less money and finished sooner than other refinishers offered. These salt-of-the-earth homeowners are retired military. 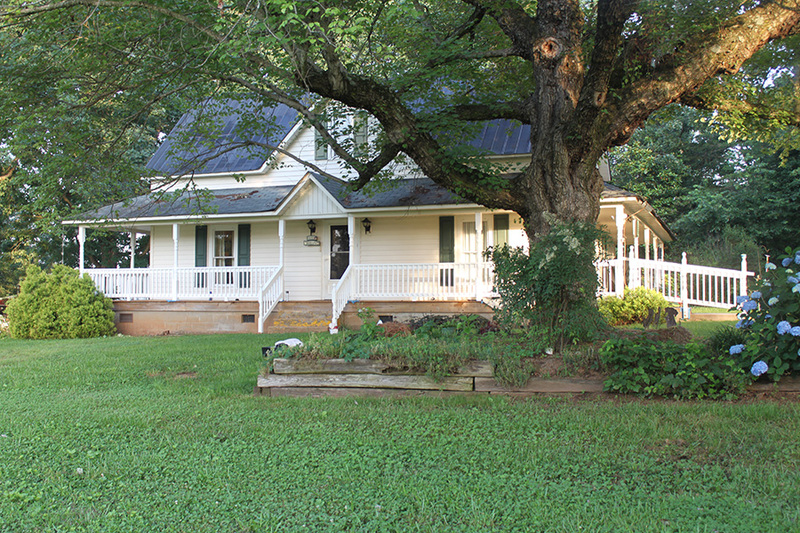 The retired Colonel retained me to improve their beautiful farm home deck north of Statesville, North Carolina. 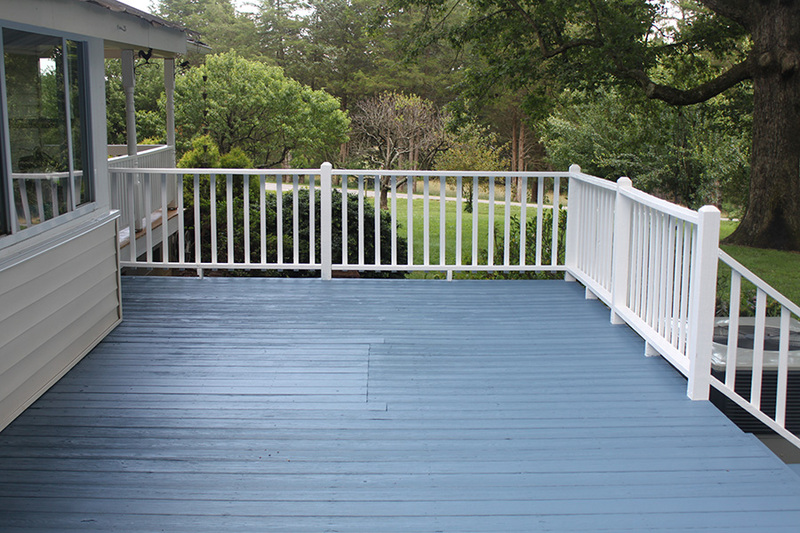 The aging deck was pressure-washed, treated with acid and chlorine prior to two coats of high-quality deck & rail paint. This project was fun and filled with positive regard by friendly local folks. These senior citizens are tetired military. They offered to share my name and contact information with their family and friends. At the conclusion of my work the retired Chief Petty Officer gratuitously added $400.00 above and beyond the final amount due. The retired Chief Petty Officer and spouse both thanked me for taking extra time to improve their deck project promising to provide neighbors and friends my contact information. 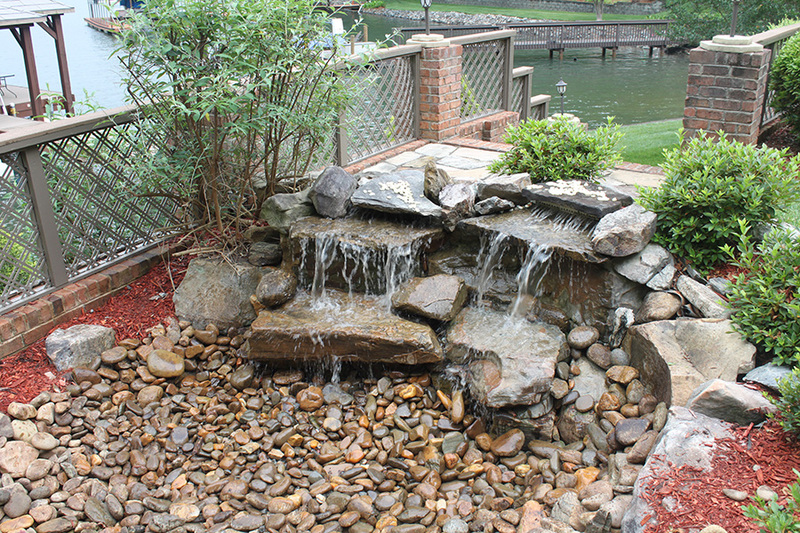 This homeowner is a retired professional residing on Lake Norman in Mooresville, North Carolina. 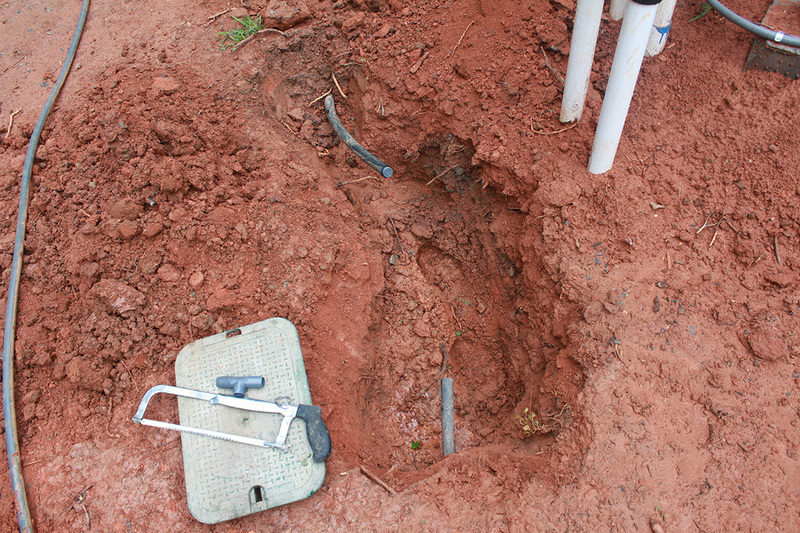 The irrigation system froze and fractured pvc lines during winter months. 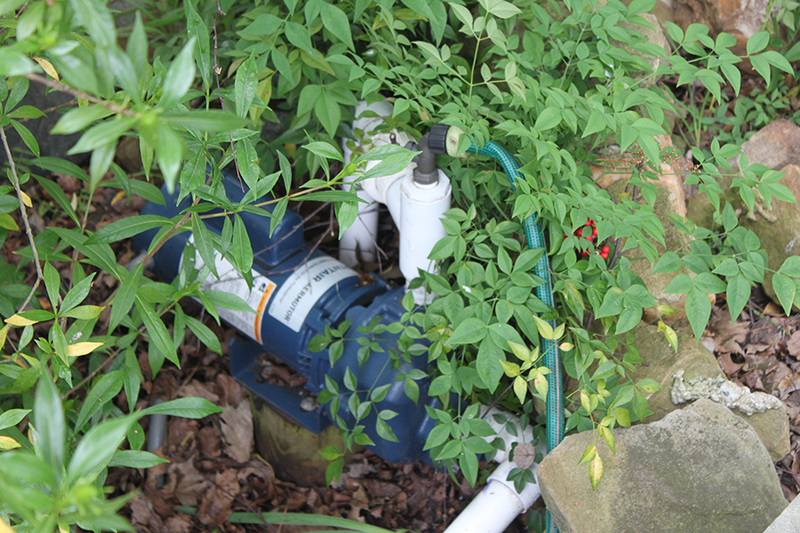 The suction line, boot valve, and fittings in the lake and connections to the pump were removed and replaced. The pump was serviced including tightening bolts, tightening drain fittings, and surging air from the lines. 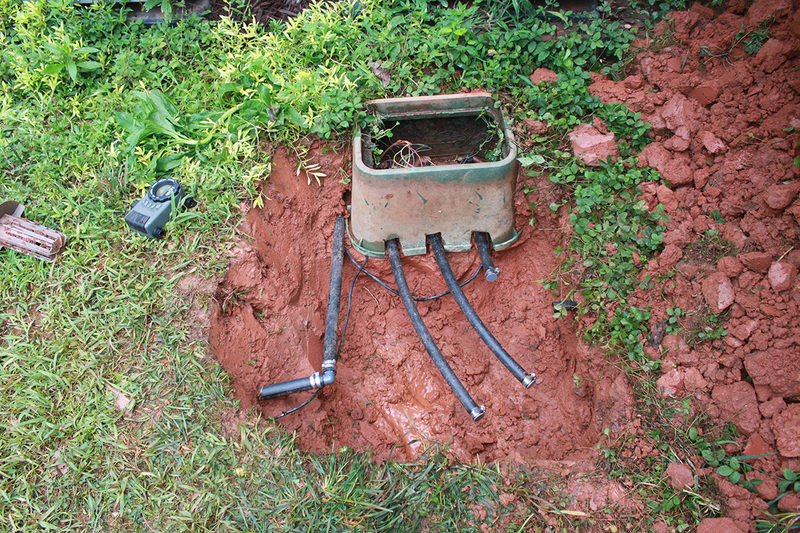 Kevin Stagl of Designtech Projects did a repair on my irrigation pipe and pump. I pump water from Lake Norman. My supply line froze and burst and the pump needed servicing. Even though I could not be here during the repair the process went smoothly, and I even got email photo updates. 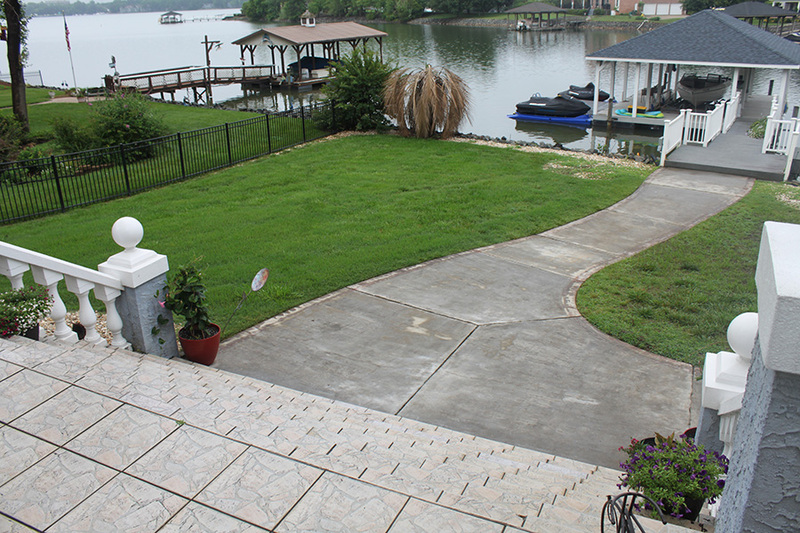 This homeowner’s backyard fronts on Lake Norman in The Point in Mooresville, NC. 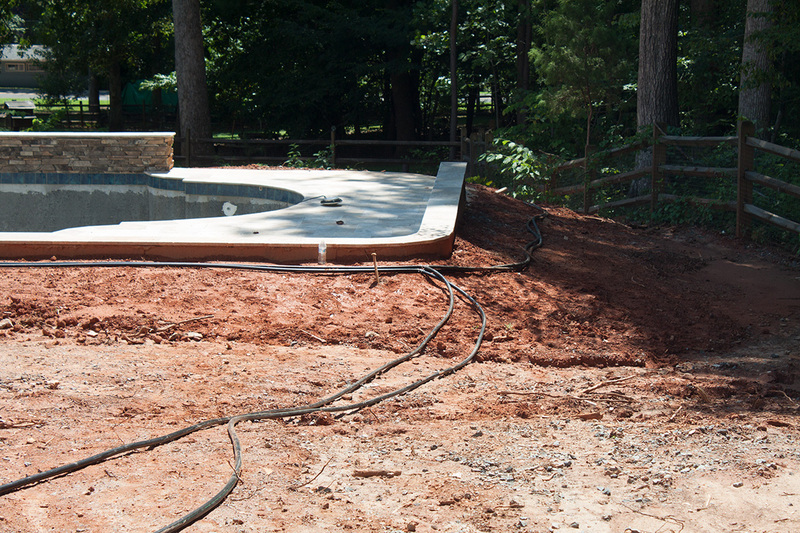 The initial task was to remove the aging jacuzzi and install new deck boards. 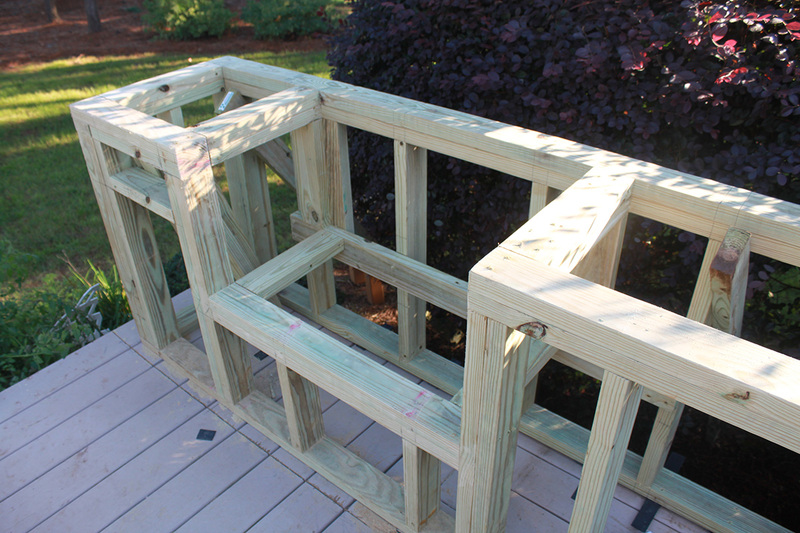 Following the deck repair a new deck planter box was constructed. 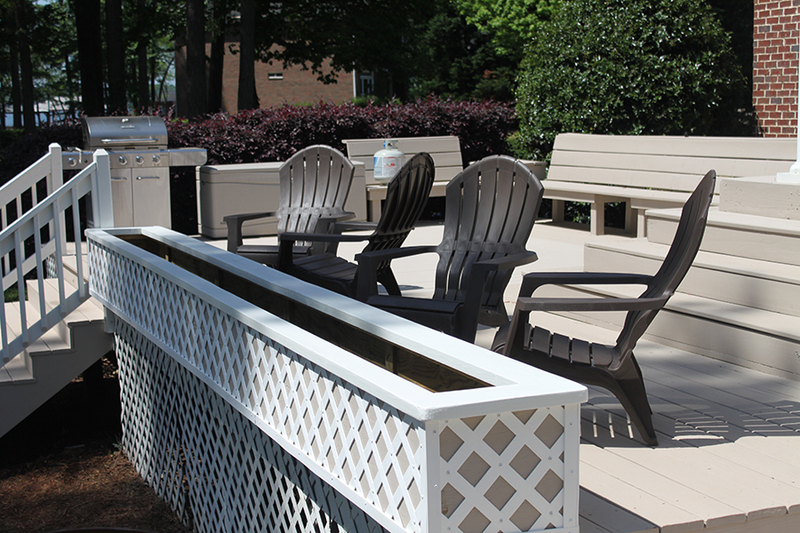 The deck planter consists of 3/4″ pressure-treated plywood with white vinyl lattice. We recommend Kevin. He is a pleasure to work with and has great design ideas. We went in with a good idea of what we wanted but needed help to bring our ideas to life. We brainstormed with Kevin and could not be happier. Clean, neat, professional work!!! 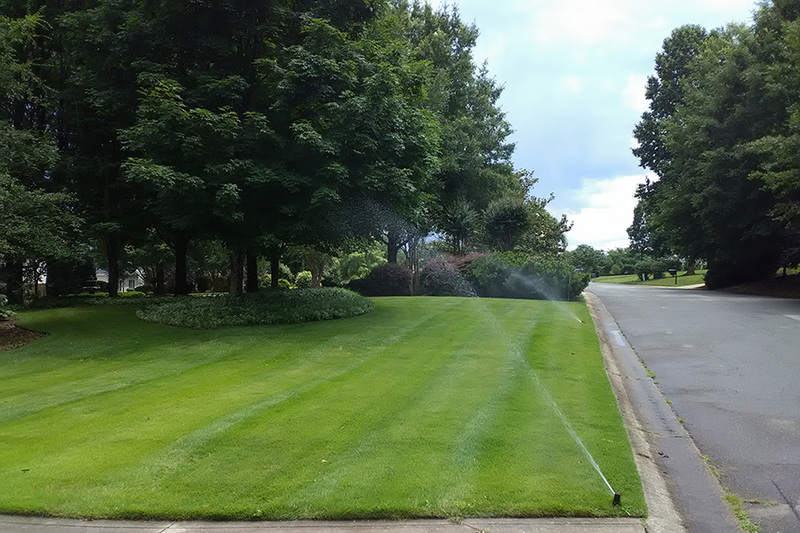 Submitted by a local family residing on Lake Norman in Mooresville, NC. 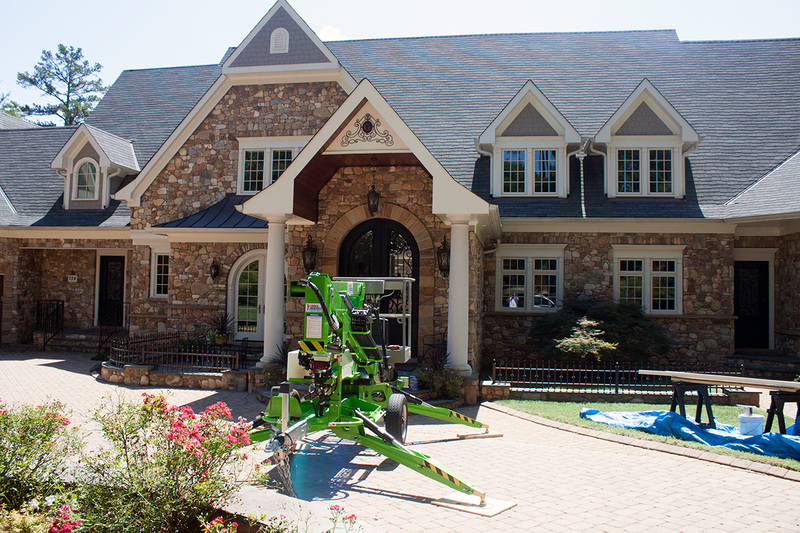 This homeowner is a local professional residing on Lake Norman in Mooresville, North Carolina. 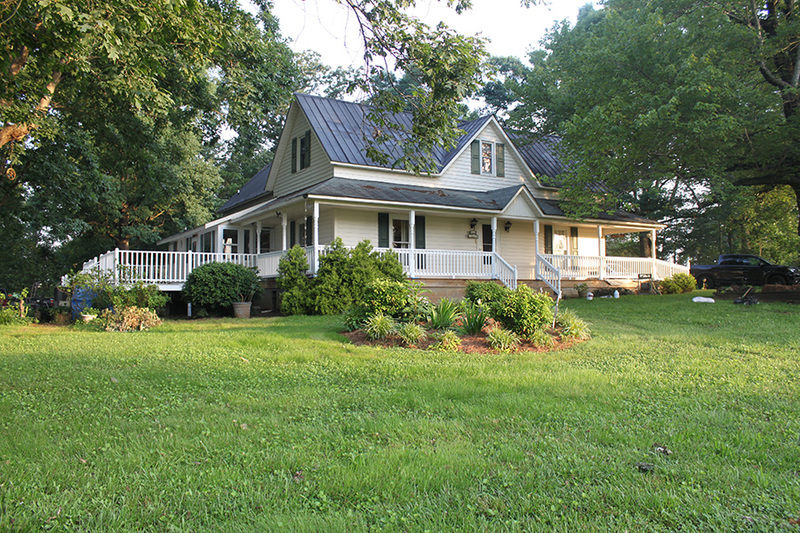 The majestic home transcends several unique property elevations. 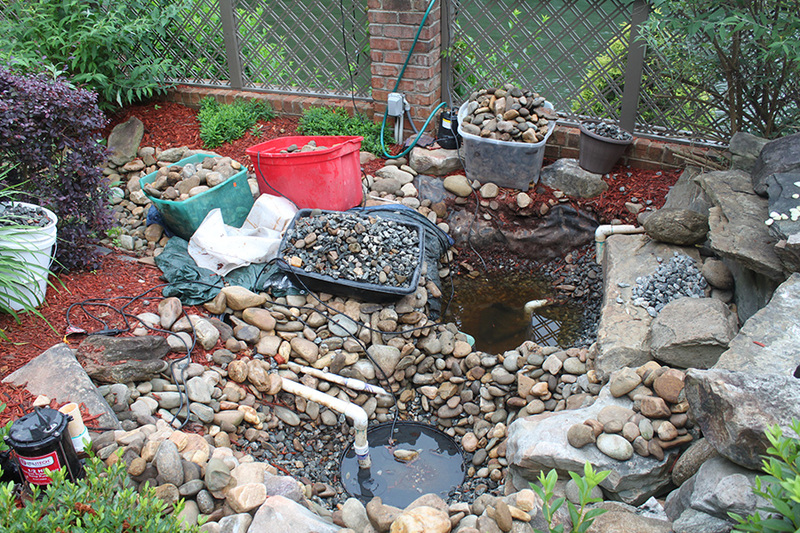 A series of three images captures the essence of this river rock pond project. 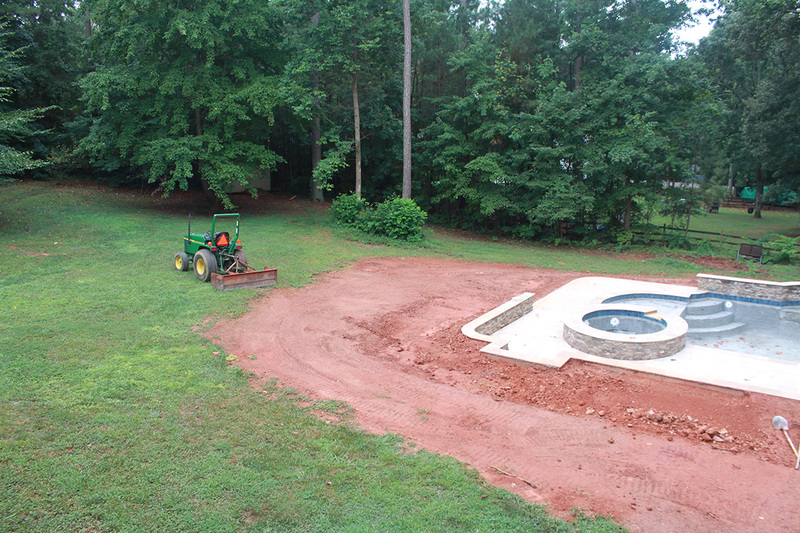 In the first image the homeowner has already removed river rock from the pond to expose two submerisble pumps. 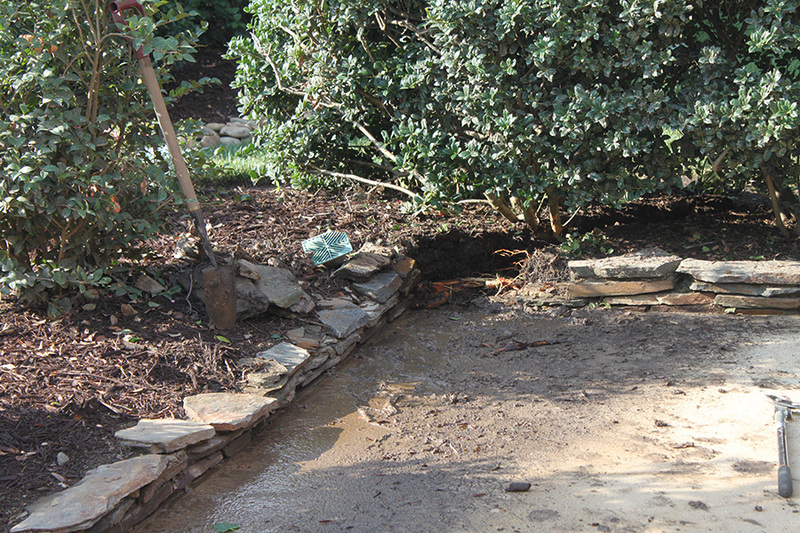 The next two images show the sprawling river rock creek and river rock pond area after replacing one submersible pump and restacking river rock around the designated pond area. 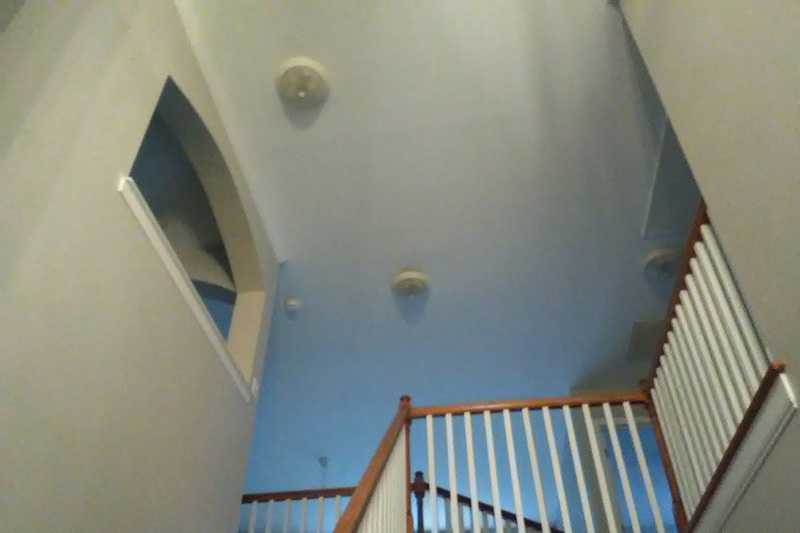 This DIY project (in main) was performed and directed by the homeowner. 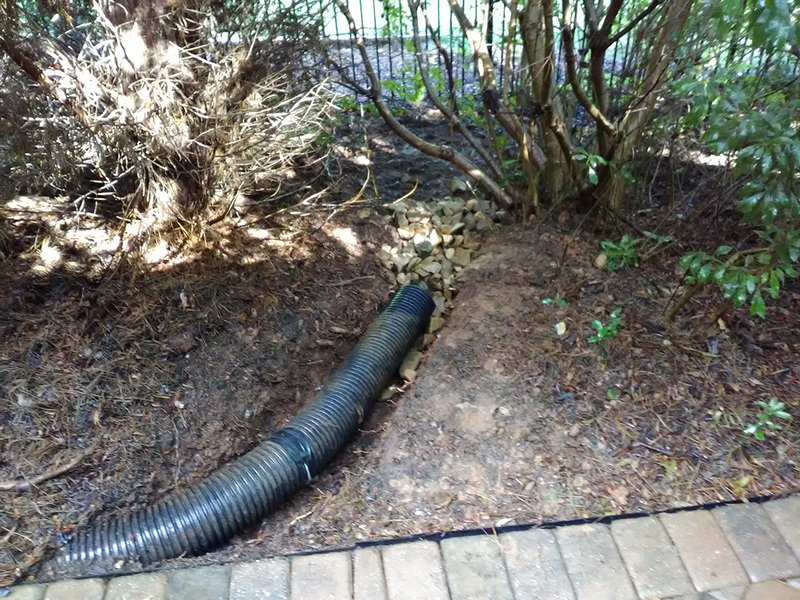 I was honored to assist for 2-hours to connect the discharge line to a new submersible pump and also assisting the homeowner restage the river rock within the pond area. 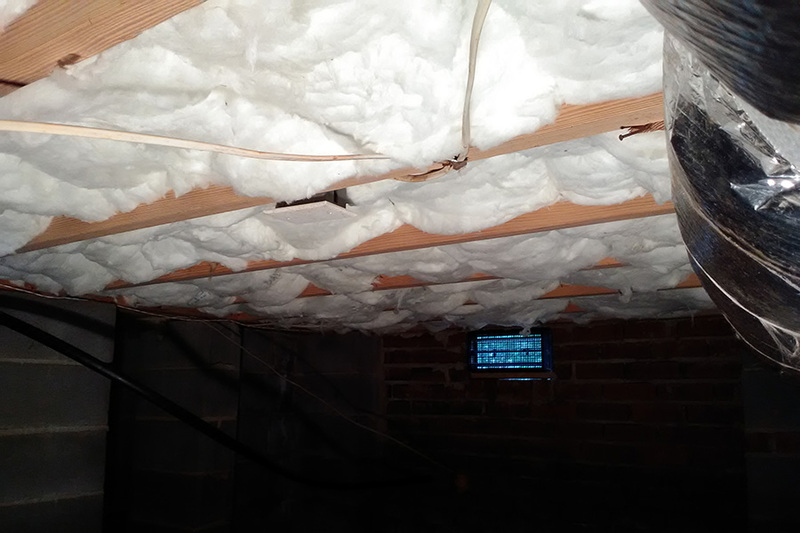 A crawl-space insulation project can reduce the homeowner’s monthly utility expense by adding additional r-value in the crawl-space. This project updates the r-value from R-19 to approximate R-34. An R-34 value retains heat during cold winter months and retians air-conditioning during warm summer months. 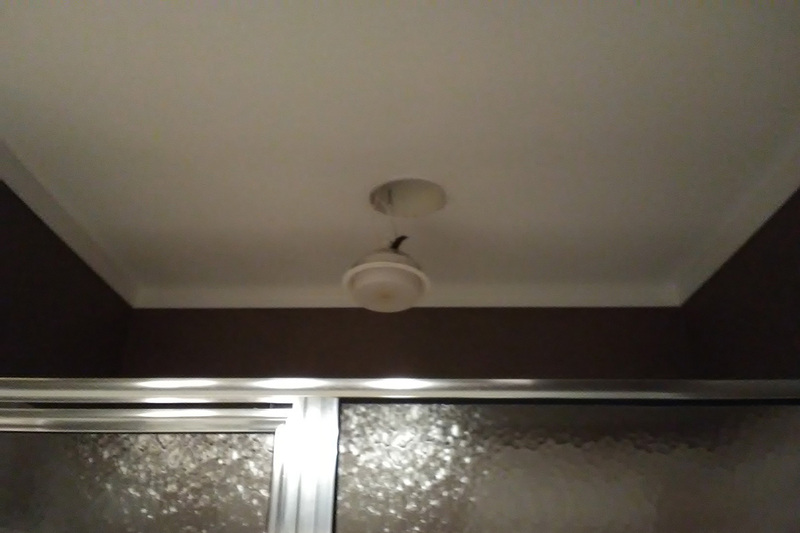 This residence is rental property. The owner resides out of state. The tile repair was performed promptly. 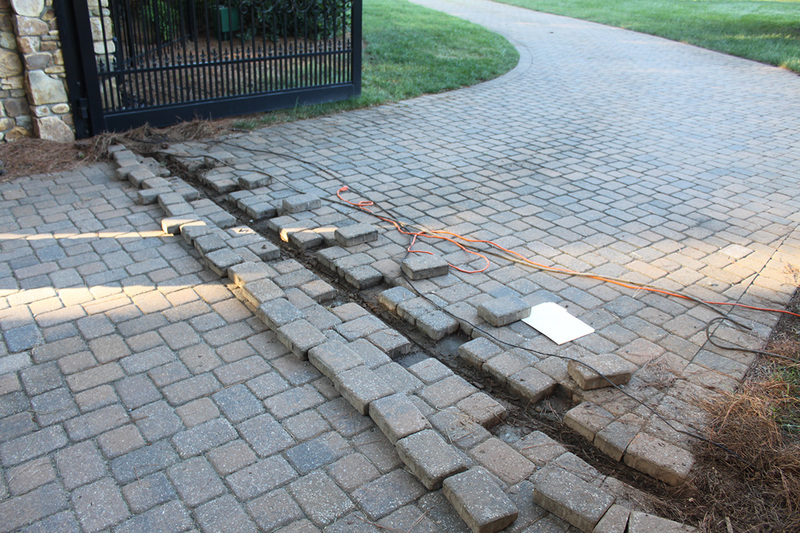 As depicted in the corresponding image, homeowner suffered a dozen lengthy cracks in the driveway. 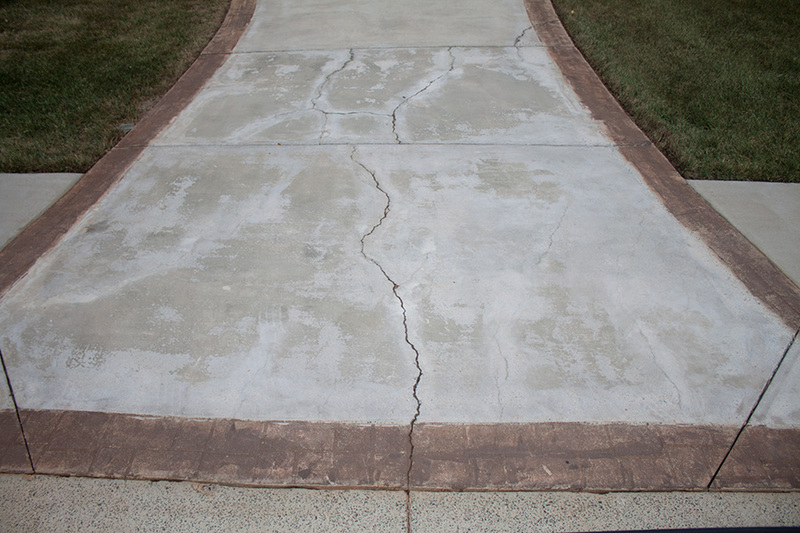 The cracks were caused by several issues such as insufficient expansion joints, differential settlement of soil, and freeze-thaw heave causing portions of the driveway to rise up 3/4 inch in the Winter. The work I performed included ready-mix concrete (3600 psi and fiber-reinforced) plus I added additional street saw expansion joints. The property owner is a retired painting contractor with 40+ years experience. 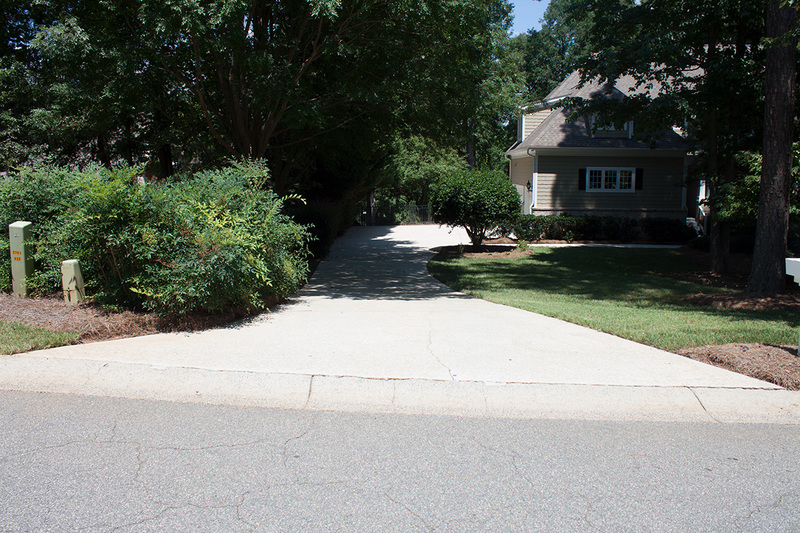 The property owner repainted the driveway with a commercial-grade enamel stain and is upgrading the stenciled brick design around the perimter of the driveway. Homeowner suffered numerous leaks inside the home from a foyer pool. Homeowner requested removal of the foyer pool. Foyer pool was solid concrete requiring jackhammer. Sub-floor was beefed up and new sheathing installed. A tile contractor was commissioned to create a new tile emblem design to fill the foyer pool area. Homeowner is a senior citizen purchasing a double-wide mobile-home to fix and flip. The dining room wall was substantially diminished so homeowner retained my services to hang and finish new drywall in the dining room. This project was successfully completed so homeowner will be scheduling a second project to repair, pressure-wash, and paint the back deck, plus interior painting of all rooms as well as other home improvements of the 2000 square foot mobile home. 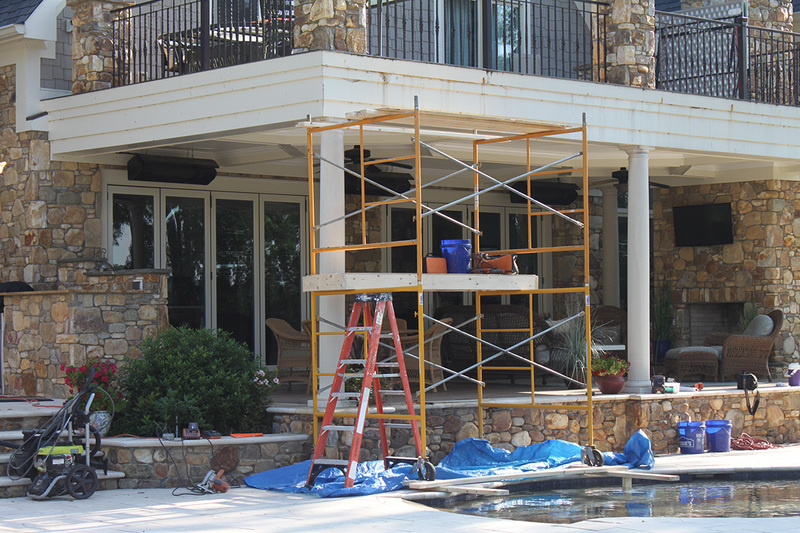 Homeowner suffered substantial leak in their three-story residence fronting on Lake Norman. 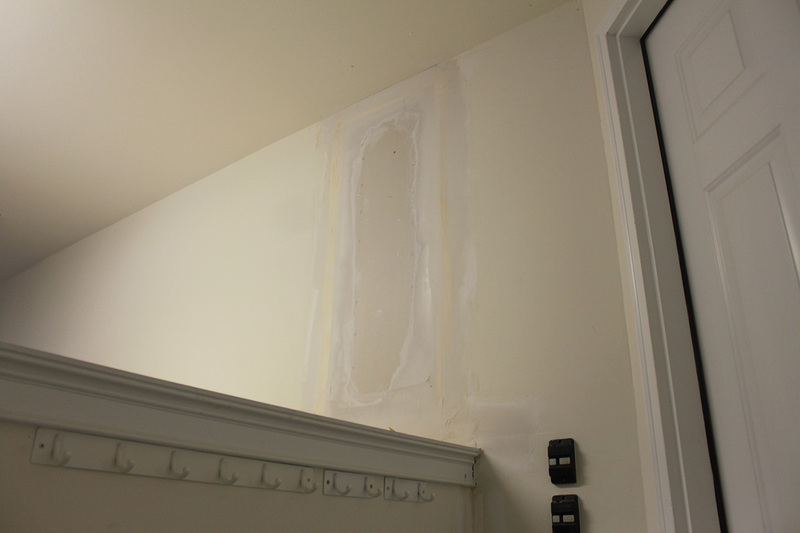 The leak was corrected by a stucco contractor working outside. Upon my arrival onsite, I was hired to reassemble the turret room. This project involved hang and finish of new drywall, installation of window sills, window shutters, crown moldings, and floor moldings. I began work in construction in the early 1970’s. This split-truss project included framing and sheathing the roof system plus framing the numerous classrooms church school project. I also performed several notable commercial projects in South Florida improving hospitality properties such as Marco Polo Hotel, Hawaiian Isles Motel, Riviera Beach Resort, Castaways, and Casanova’s Hideaway nightclub. I managed major remodeling projects for three Holiday Inn properties plus built a seafood restaurant, remodeled retail spaces, and upgraded several professional offices. Designtech Projects offers custom wood fence for homeowners who place emphasis on achieving a custom designed fence structure. 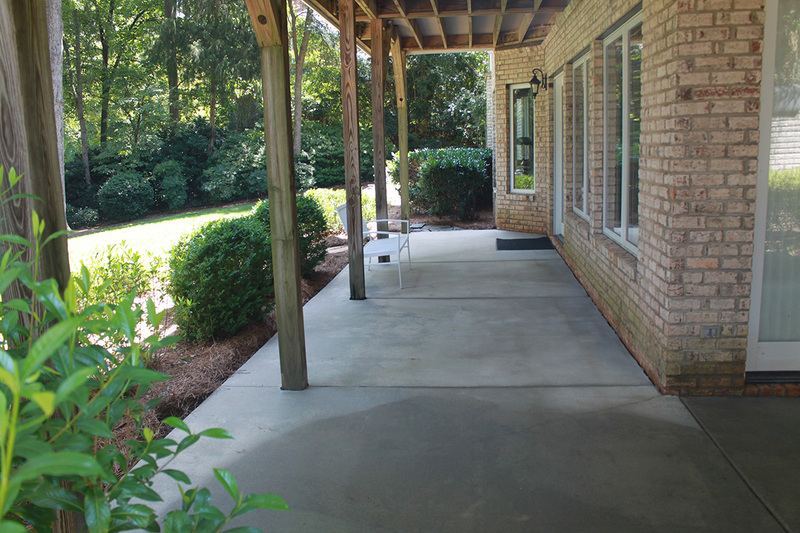 This image depicts a concrete patio at the residential home of a civil engineer. 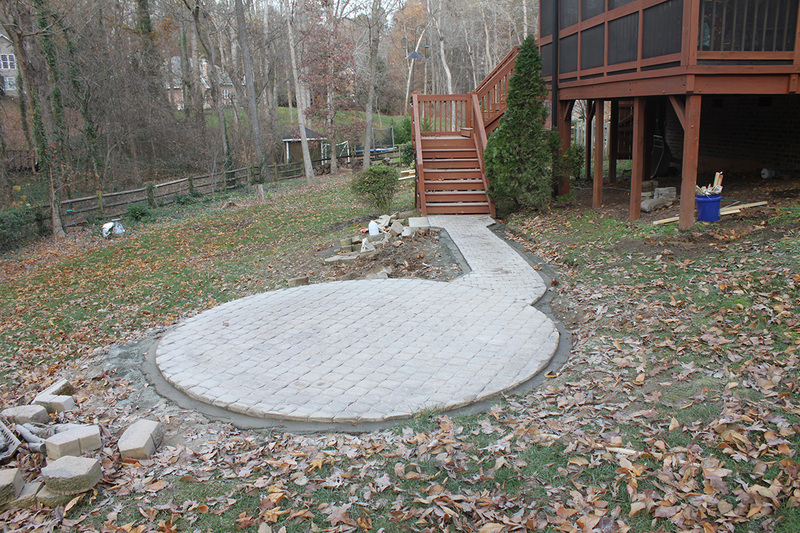 This project also included a large continuous landscape island surrounding the concrete patio. 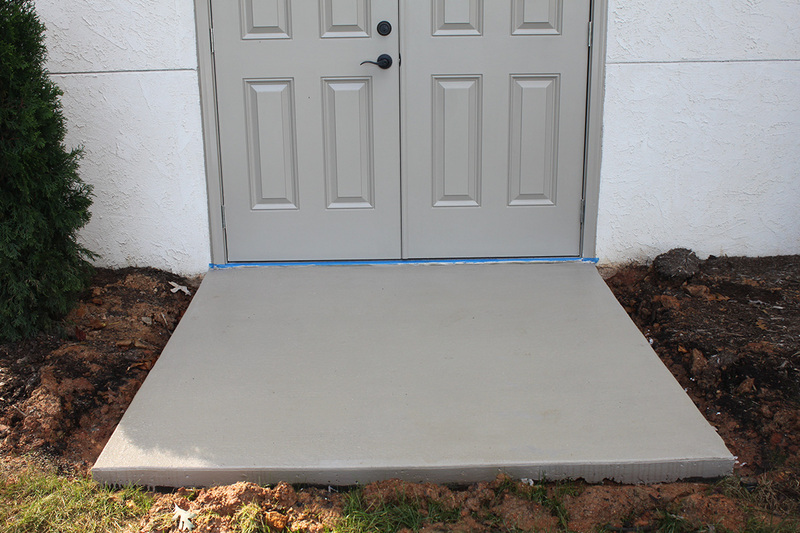 I coated the concrete patior with non-slip, polymer coating to perform a synthetic knockdown finish. This patio was covered by screen room cage. The technical requirements from the civil engineer came via a CAD design drawing requiring a contractual 3/16 inch tolerance for each of the angled elevations. Dock and Boathouse projects can create an exceptional lifestyle residing on the water. 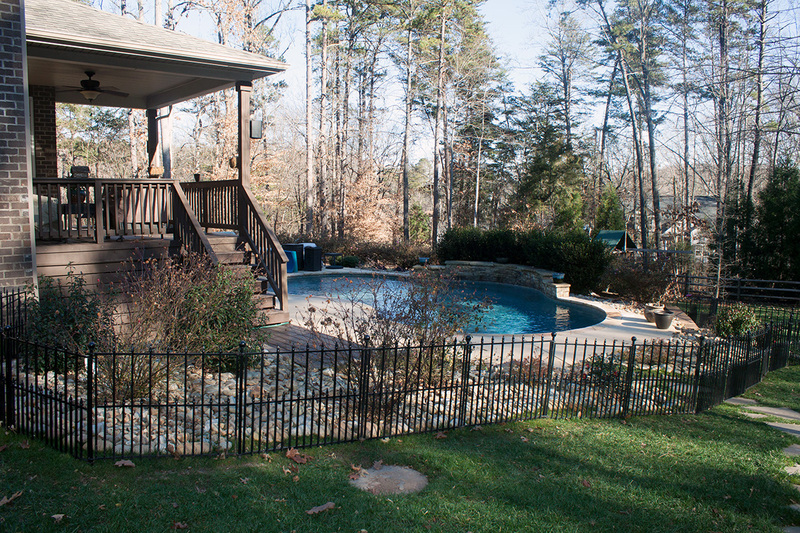 A quality deck, dock, and boathouse offers years of safe fun for every member of your family. 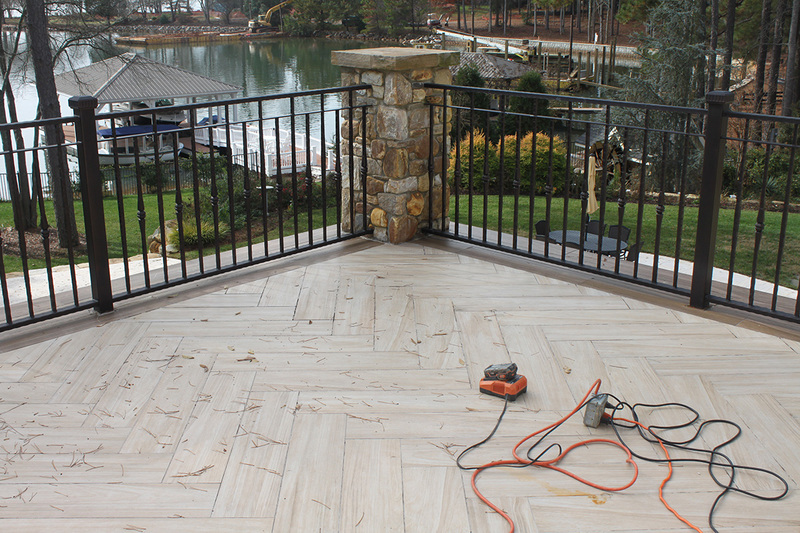 All work is performed by constructing over-sized structural members, routered deck and rail boards, sanded and sealed plus stainless steel screws (no nails) and stainless hardware. The deck, dock, and boathouse project will be outstanding quality and will glisten upon completion. 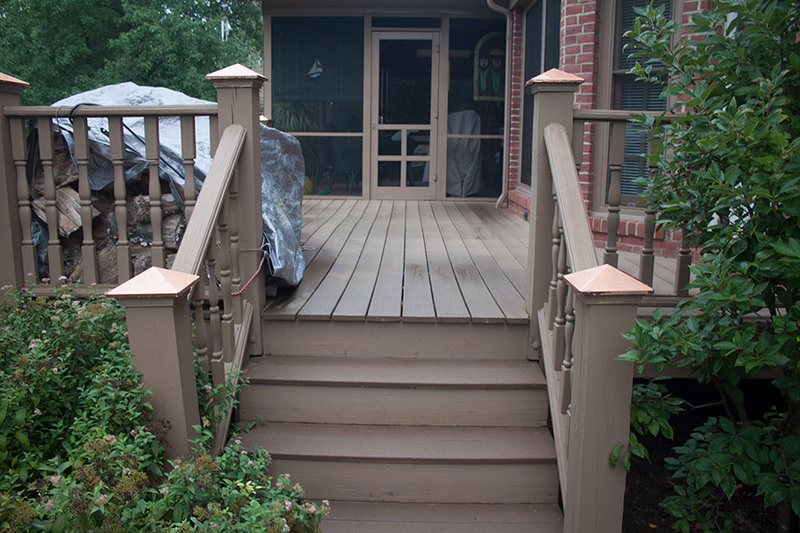 Designtech Projects offers a transition deck. 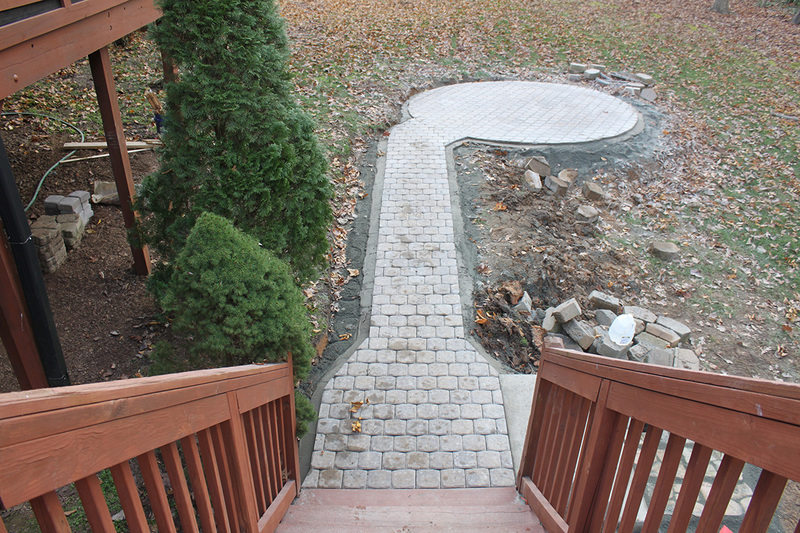 A transition deck is utilized to travel from one area of the property to another area spanning various topographies. A transition deck is a perfect structure for use to step down from second-floor exits, moving from the pool deck to entertainment areas below. 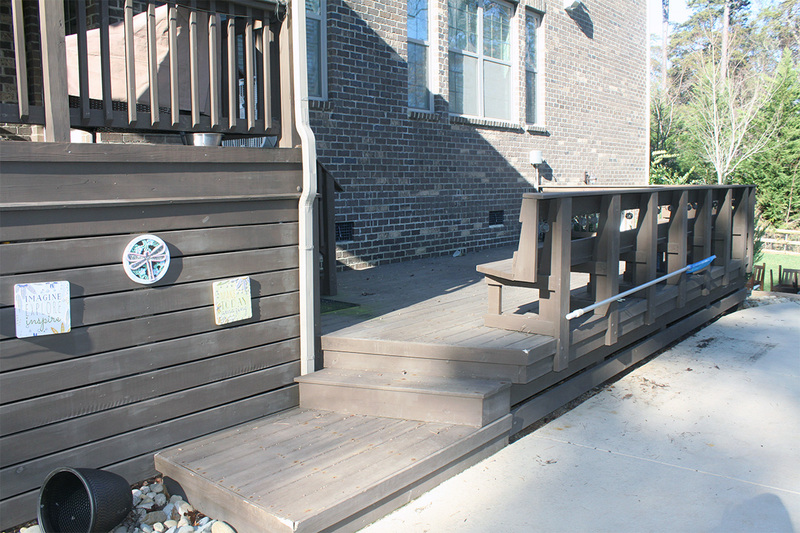 A transition deck is available in many sizes and shapes including sufficient room for walking plus a plant stand and chair or two. 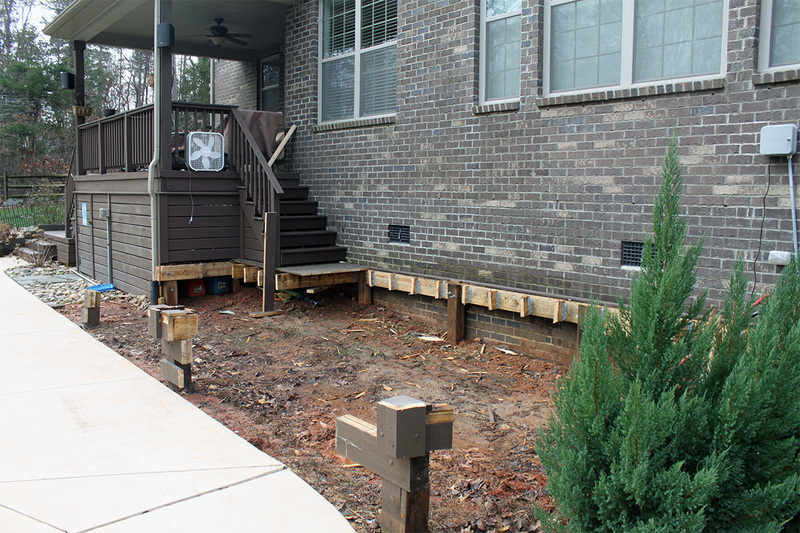 The transition deck shown was constructed at the private residence of a senior manager of code enforcement. Designtech Projects offers drywall hang and finish. Each customer gets to select their preferred finish such as textured, orange peel. knock down, splatter coat, or slick finish. The only way to learn concrete coatings is by working on hands and knees performing a trowel finish. 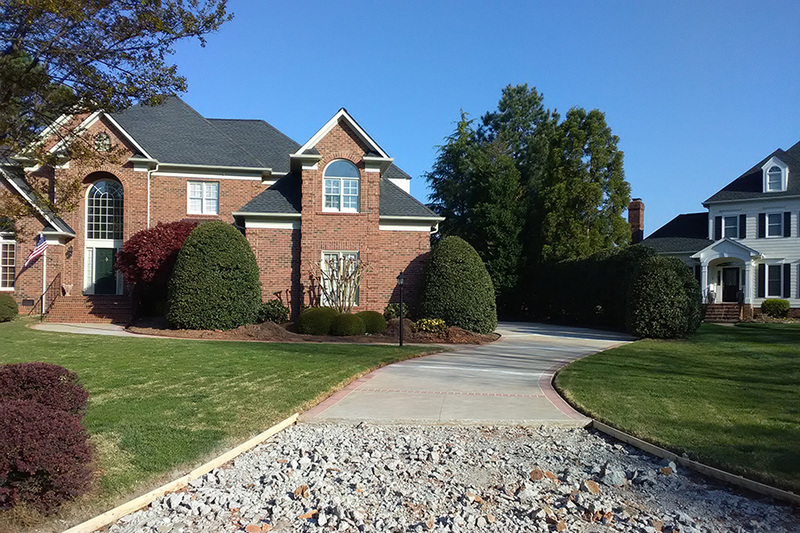 I performed various types of Chattahoochee stone finishes, resin-spray coatings, and various non-slip, trowel-textured coatings, including several variations of resin-based brick, stone, and other organic pattern finishes. 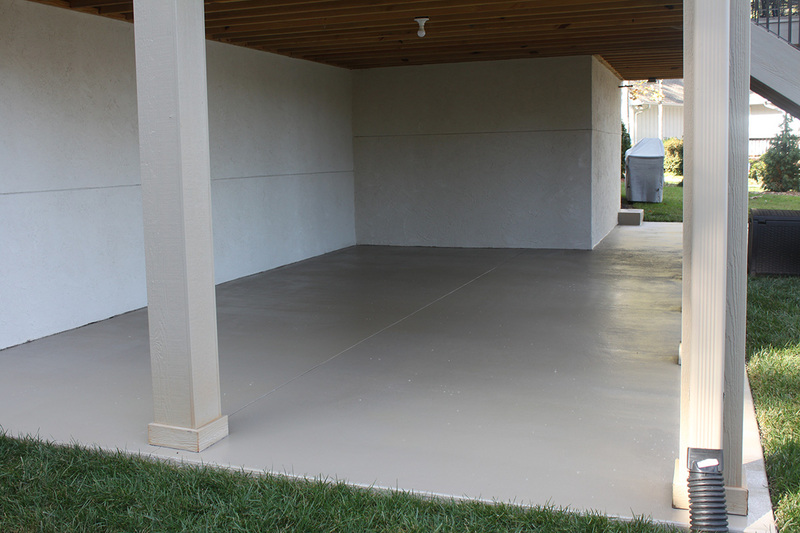 These concrete coating skills are exceptional for pool decks, patios, lanai, sidewalk, driveway, and garage floor. The industrial use includes showrooms, dealerships, and other large retail spaces. 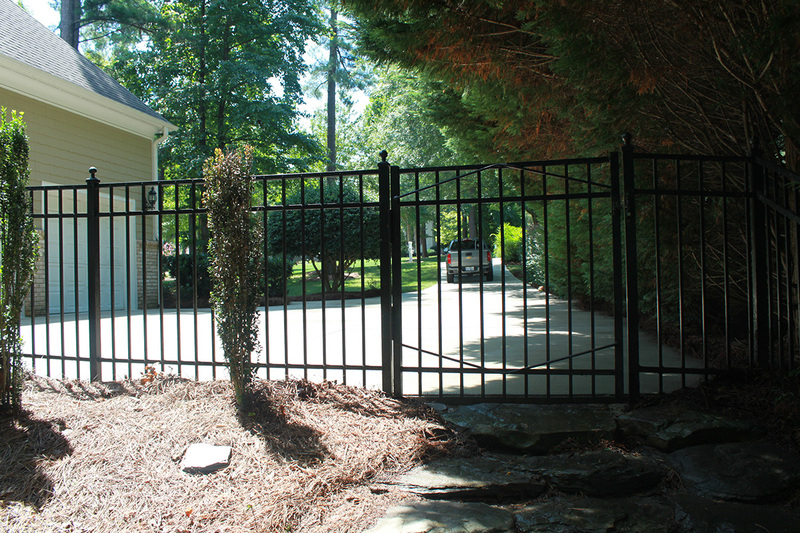 Designtech Projects offers standard wood fence for homeowners who place emphasis on achieving standard fence structure. 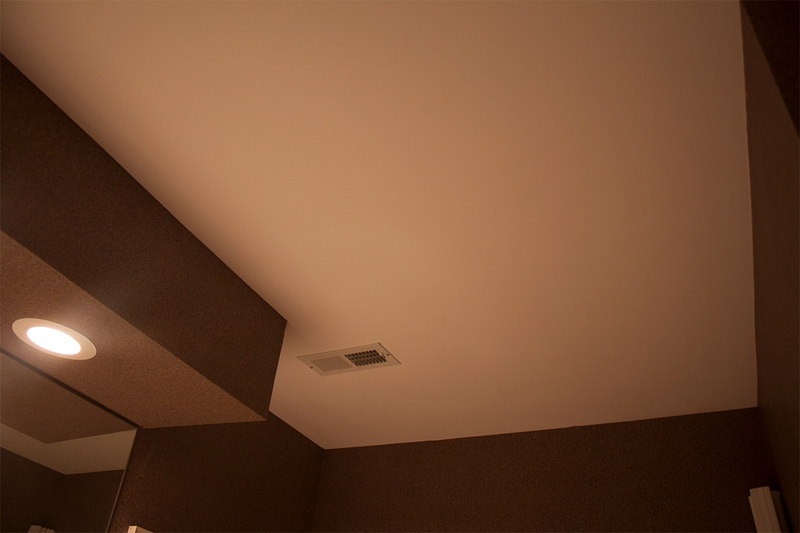 Designtech Projects offers interior painting including ceilings, walls, trim, windows and doors. 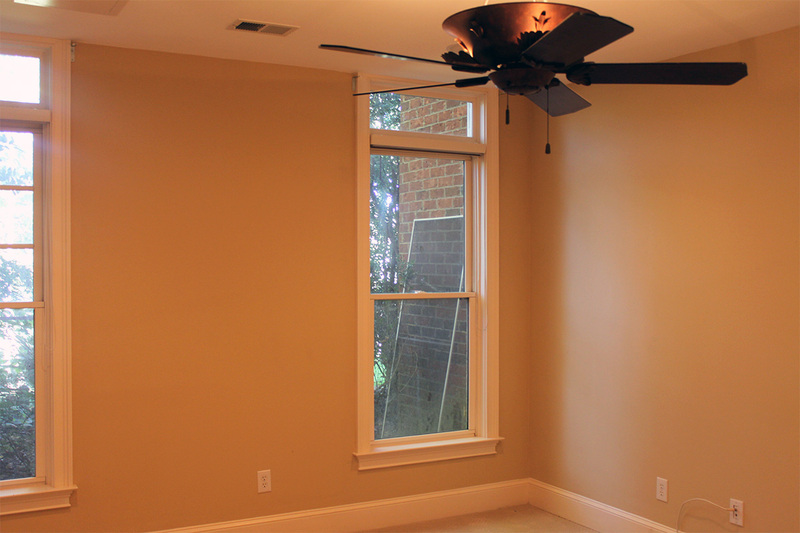 Interior painting may require prep not limited to fill and finish imperfections in drywall surfaces, cleaning and caulking of moldings, windows, and doors as needed. 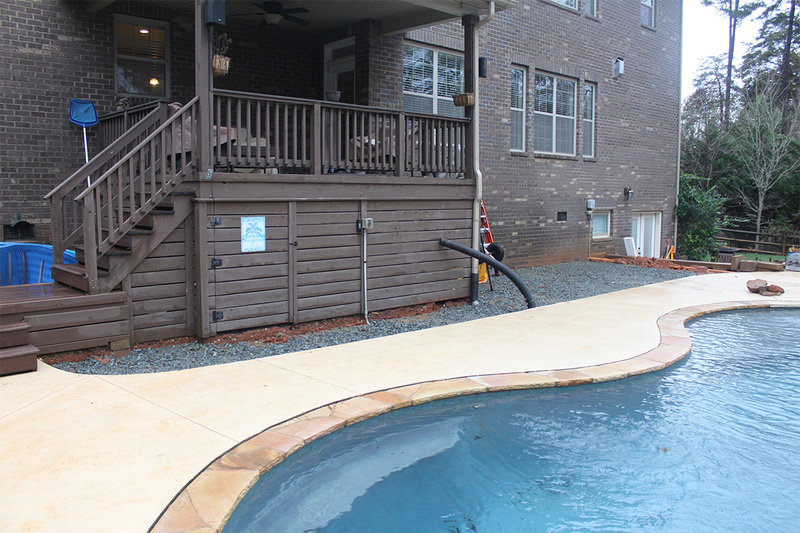 Designtech Projects offers driveway coatings for various concrete structures including pool decks, lanai, driveways, sidewalks, landings, and patios. Driveway coatings are available in hundreds of colors, available in dozens of design choices, and each deck coating is strong, durable, and non-slip. Designtech Projects offers deck coatings for various concrete structures including pools, lanai, driveways, sidewalks, landings, and patios. 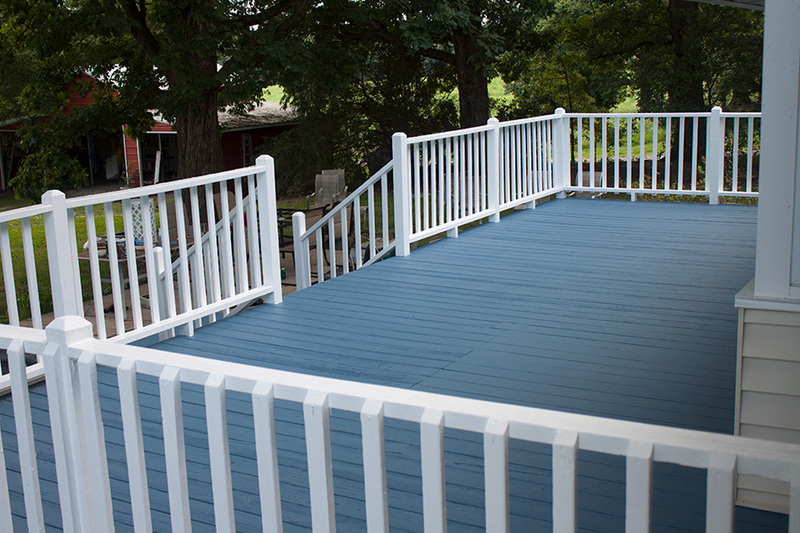 Deck coatings are available in hundreds of colors, dozens of design choices, and each deck coating is strong, durable, and non-slip. Designtech Projects offers floor tile projects including ceramic tile, porecelin tile, and varfious decorative, designer emblems within the floor tile layout. 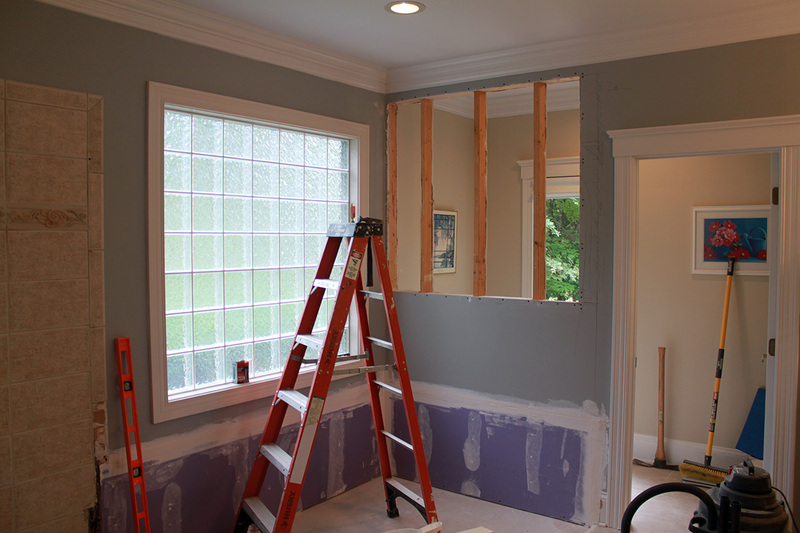 Hang and finish drywall is crucial for remodeling, upgrades, and repairs of existing spaces. My drywall finish skills are outstanding. 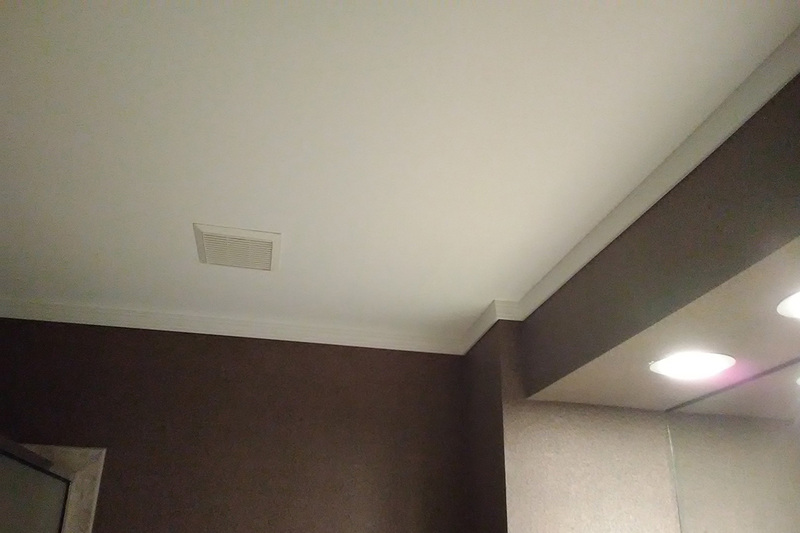 I also offer drywall texturing by splatter coat, troweled finishes, various knockdown solutions including new walls or repairs of existing walls including popcorn, skip-trowel, knockdown, lace, rosebud, Santa Fe, and good old slick finish. Residential deck projects are enjoyable structures. 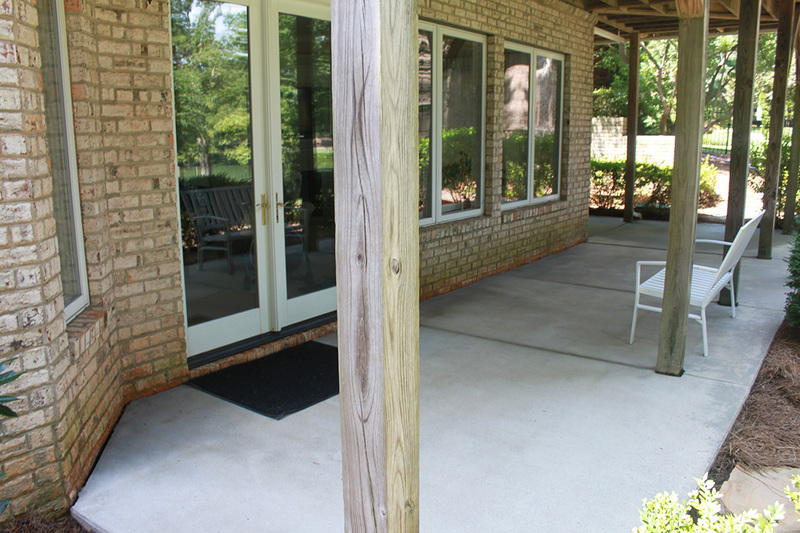 I utilize oversize concrete footers, oversize support posts, oversize structural framing and achieve a safe and enduring deck board finish. You get a stronger deck and I keep material costs very reasonable. Deck rails are rock-solid. No nails anywhere. Deck boards and rail boards are secure by using stainless steel screws and all structural members are joined by stainless steel hardware. No rust to worry about. All exposed surfaces rounded by router and sanded and all stainless steel screws are countersunk to avoid torn toes. 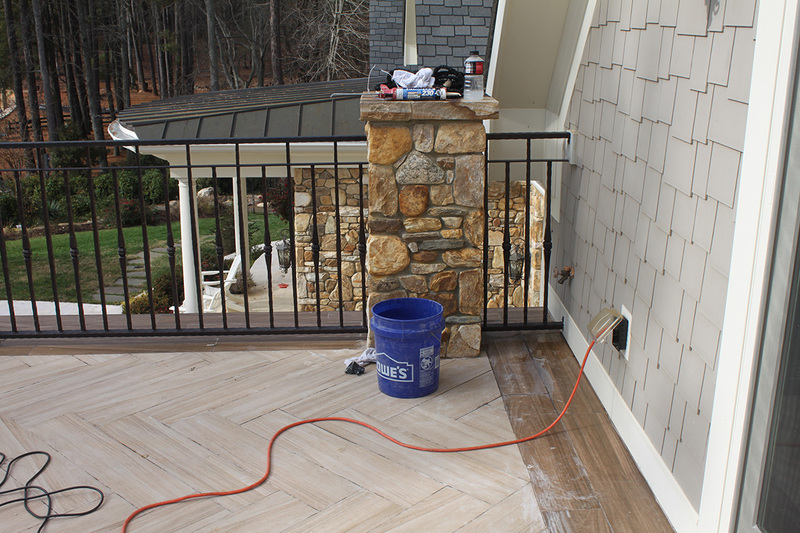 All exposed deck and rail surfaces are sanded and sealed with three coats of high-quality, slip-resistant, wood sealer. Extraordinary docks, boathouses, and marine-related structures. See one of the boathouse, dock, and fish table projects performed at the private residence of a custom home builder. No nails for my marine projects. All structural boards, deck boards, and rail boards utilize stainless steel screws, stainless steel bolts, and assorted stainless steel hardware to avoid the consequence of rust. Pilings are oversized and embedded deeper. Boathouse, dock, and marine projects include a custom fishing table also assembled with stainless steel sink for cleanup after a long day on the water. 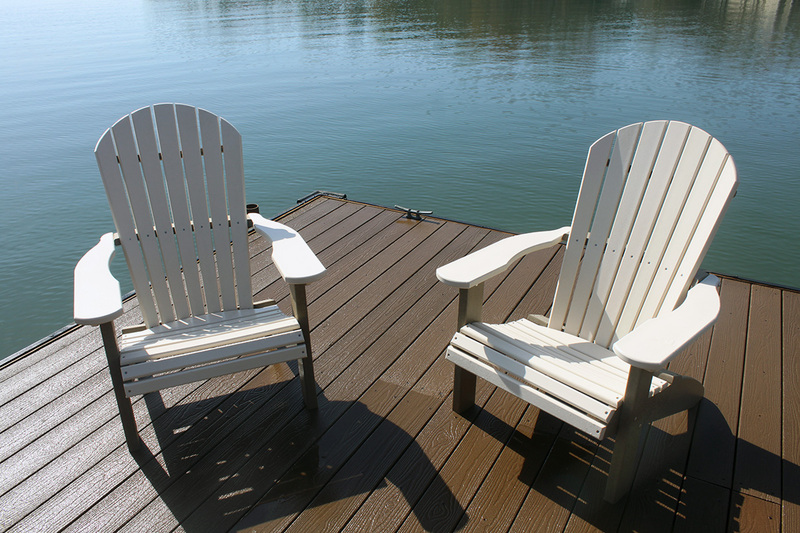 Each boathouse and dock project includes a complimentary fishing table at no additional cost. The fishing table is crucial upon arriving back form a long day fishing and water sports. The fishing table is constructed with pressure-treated lumber, rounded edges, sanded surfaces and sealed with non-toxic, environmentally-safe sealer. The stainless steel sink can be improved by connected to running water and hose reel to clean fish and surface structures. Landscape themes for residential and commercial properties. 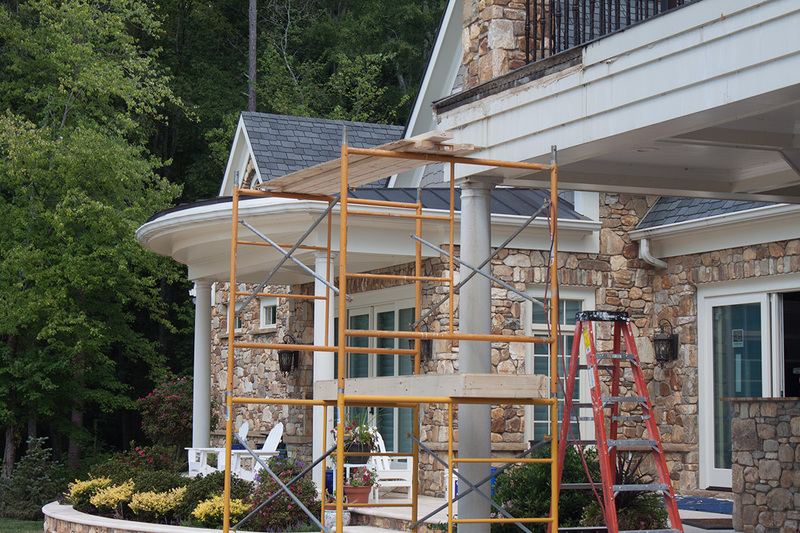 This particular project occurred at the private residence of a retired insurance executive. The landscape design was based upon a theme I selected while playing a round of golf at Desert Mountain Golf Course in Scottsdale, AZ. Undulating mounds along the front elevation of the residential home plus multi-color stones similar to the various shades of red rocks in Scottsdale, Arizona. The project was expanded to include concrete sidewalks, dock, and backyard patio with large concrete planters. 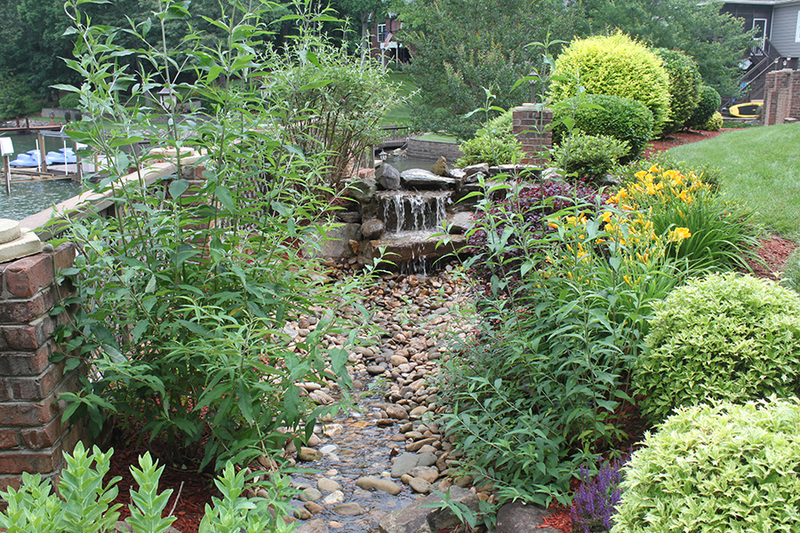 Landscape projects can include a variety of hardscape projects. 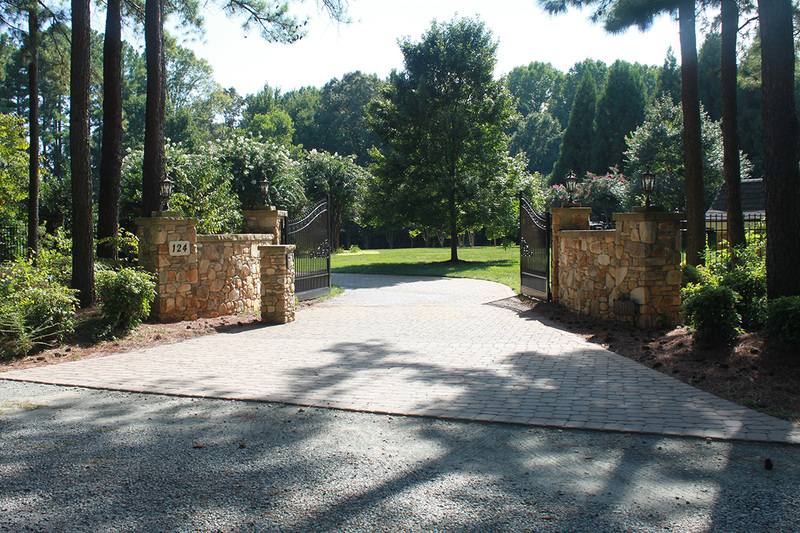 Over the decades, I produced custom trellis, gazebo, stack block, patio, walkways, paths, concrete steps and other related hardscape design features. This particular project was performed at the private residence of a retired attorney. 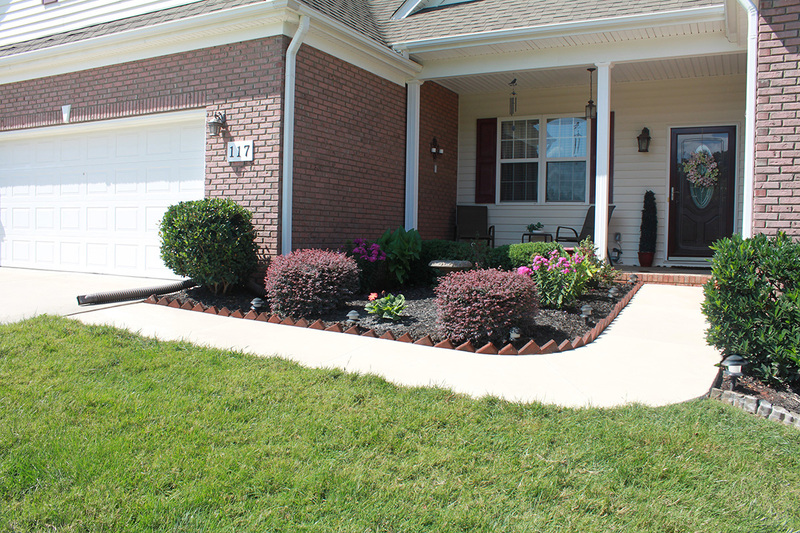 That property owner not only wanted me to install a new landscape theme, but also incorporate a predominant large patio on the back of the home plus a walkway, concrete steps, new sod, and a beautifully installed stack block planter detail. Custom cedar surrounds for private spaces on pool decks. The cedar is secured to studded walls to create a safe and secure design element while achieving partial or complete privacy. The Jacuzzi surround can be equipped with sound system, low-voltage lighting, and other additions to personalize your Jacuzzi surround. Designtech Projects offers concrete driveway. 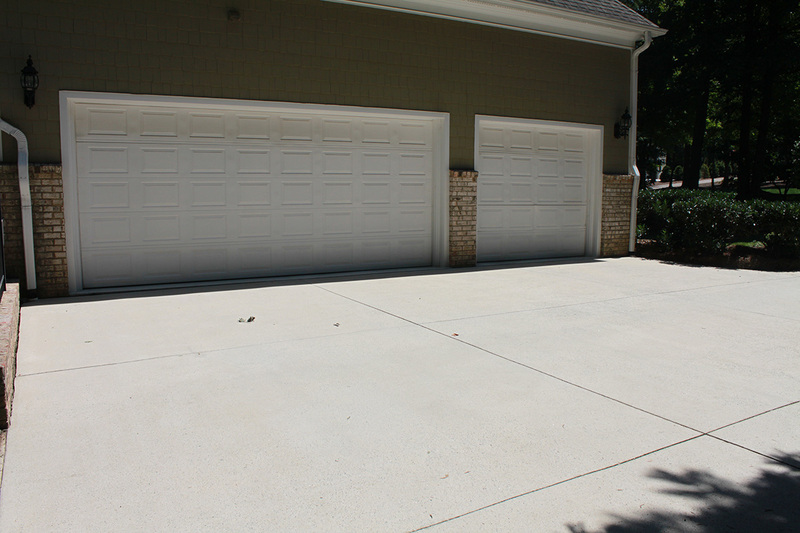 The concrete driveway can achieve solutions for parking additional vehicles, RV storage, and other ingress and egress goals. 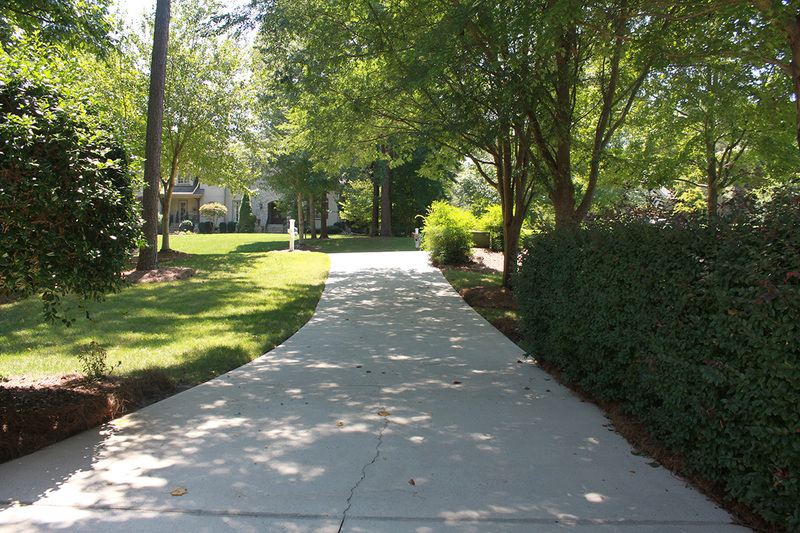 The concrete driveway is typically fiber-reinforced, re-bar-reinforced and scored with expansion joints to minimize surface cracking. 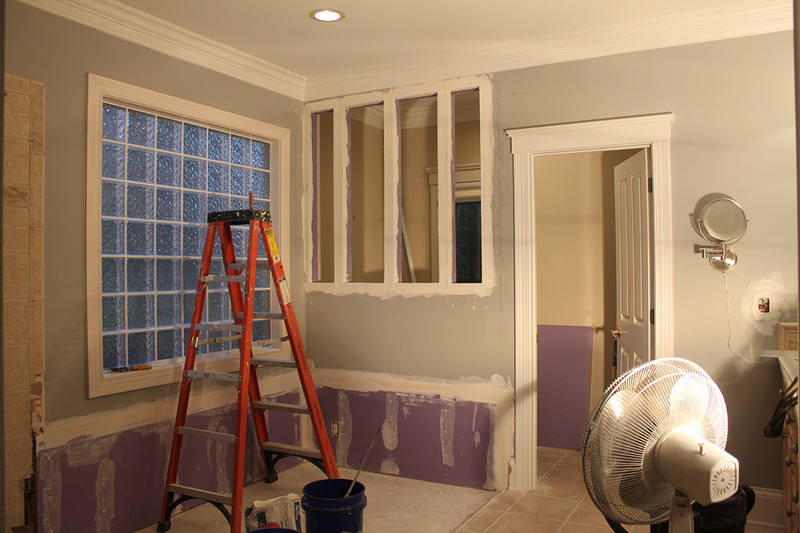 Designtech Projects offers drywall repair. 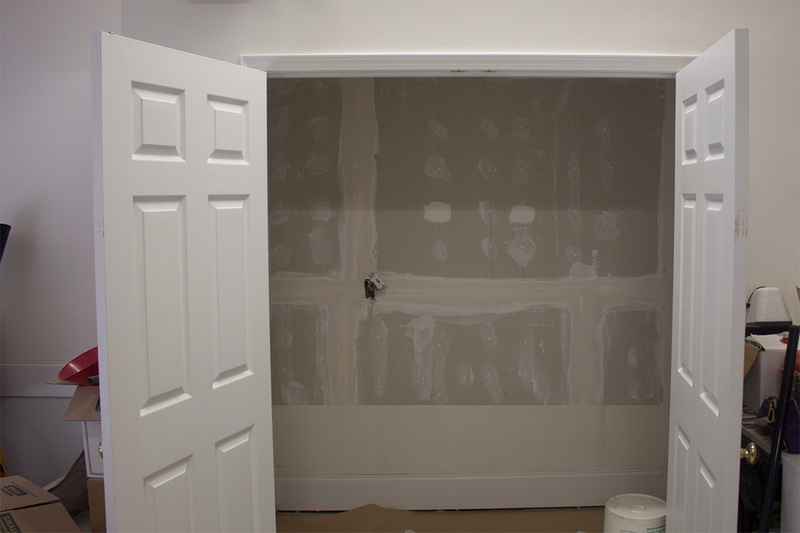 Drywall repair includes drywall hang and drywall finish. Drywall finish gives the homeowner choices whether to use texture, orange peel, knock-down, splatter-coat, or slick trowel finish. 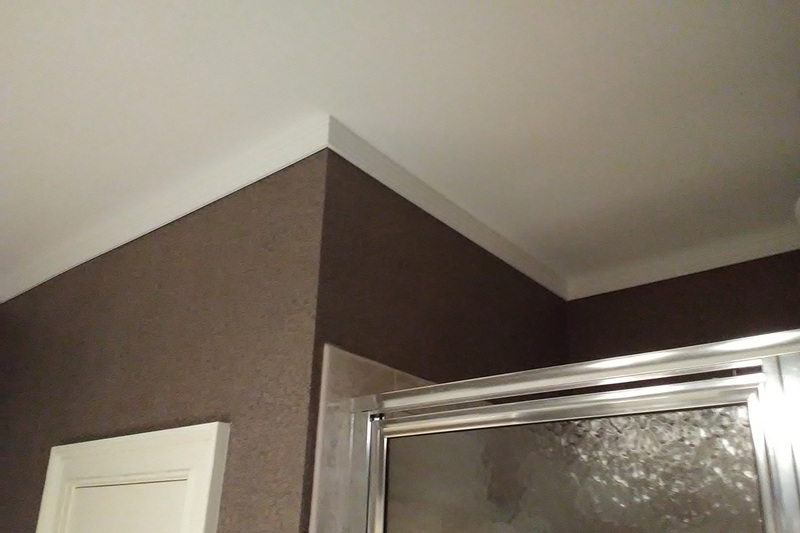 Drywall can be crafted to create many unique designs, arches, shelves, and tray ceilings. 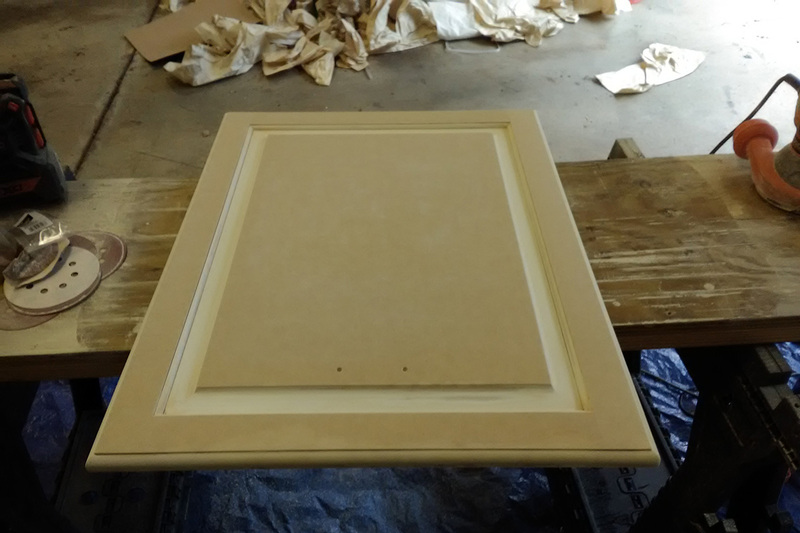 Custom woodworking projects for homeowners are cost-effective. Homeowners enjoy a durable, wall-to-wall work bench with lower-level tool shelf. Notice the work bench and tool shelf are each suspended from the wall with no floor support. 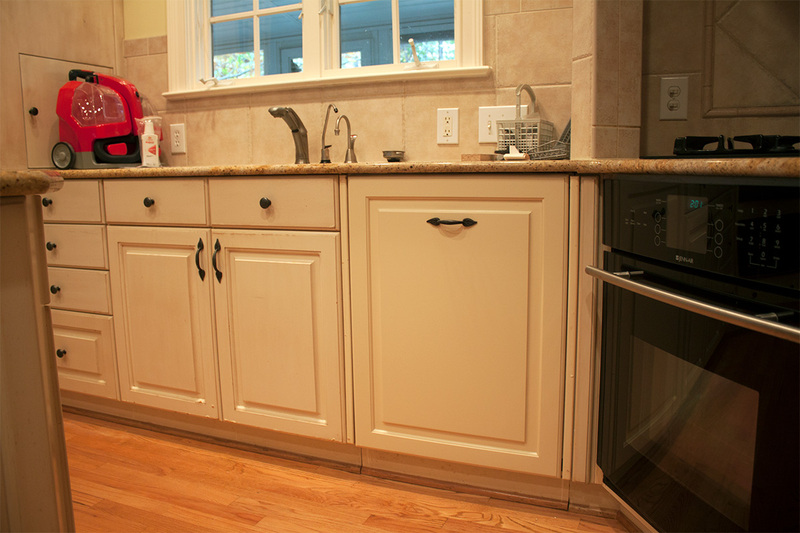 This type of work area gives the homeowner choices, because the lower-level tool shelf can be swapped for cabinets and drawer space as needed. Nothing touches the floor so blowing away saw dust and garage floor cleaning is fast and easy. 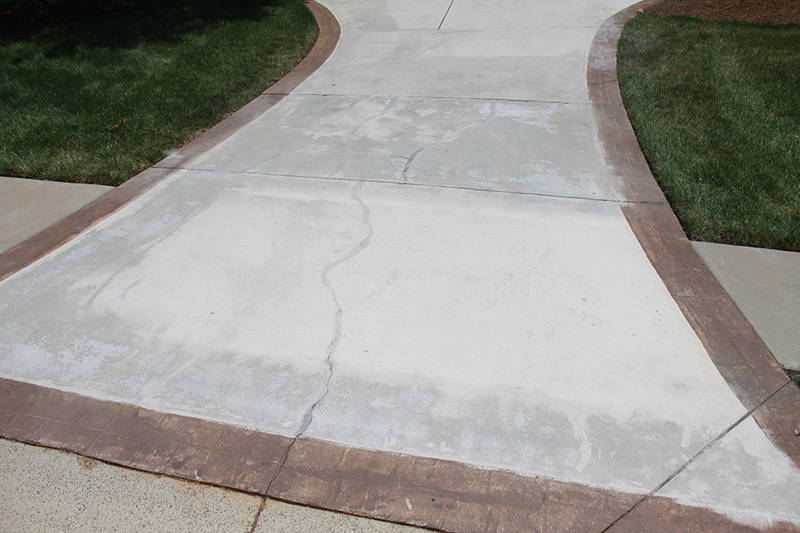 A polymer concrete coating can save thousands of dollars to resurface blemished concrete sidewalks, patios, driveways, showrooms, and dealerships. Achieve peace of mind with a safe, non-slip finish available in virtually any color you choose. You select the surface of your choice such as trowel finish, knockdown, various popular splatter patterns, plus stenciling for creating simulated brick, paver, and stone for just about every concrete surface. Non-slip, resin-based, concrete coatings utilizing a myriad of patterns, styles, and colors. 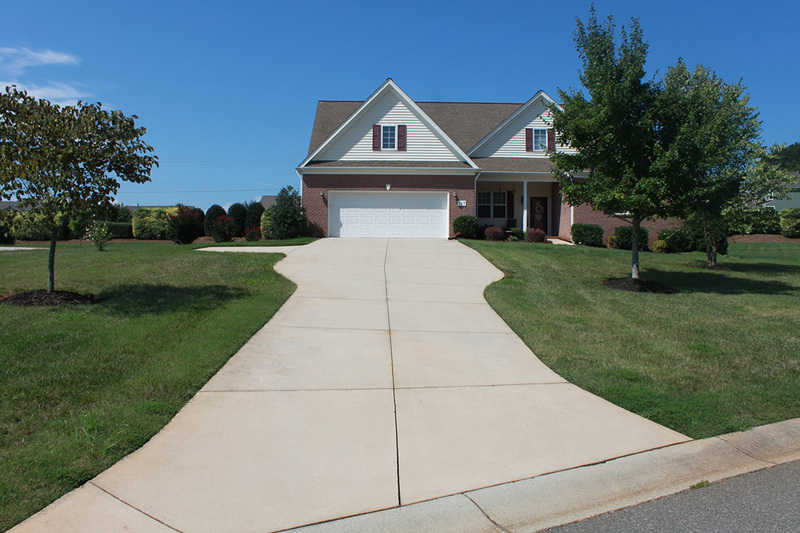 As depicted in this image, the concrete walkway and front door pad is stoned, acid-washed, pressure-washed, and stenciled with high-impact, non-slip, resin-based concrete coatings to create excellent curb appeal for older homes. 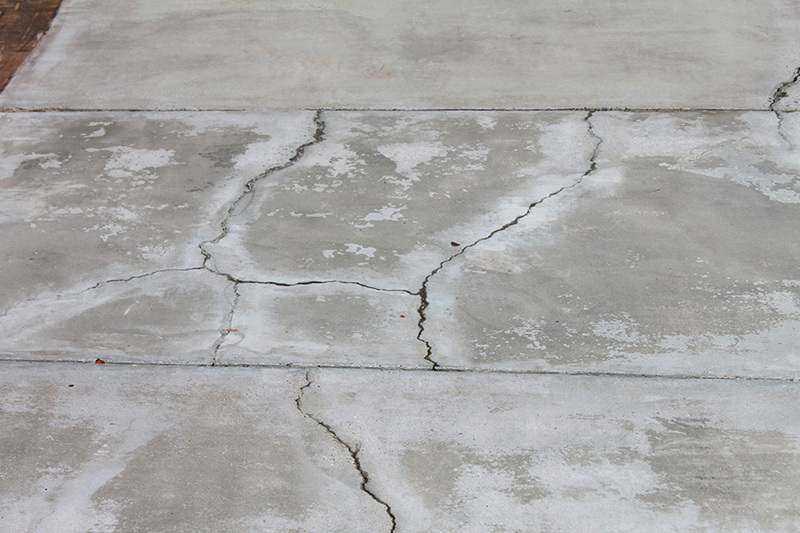 All concrete cracks along the concrete surface are ground and beveled, pre-filled with high-strength epoxy or high-strength coating patch prior to completing the decorative resin-coating. 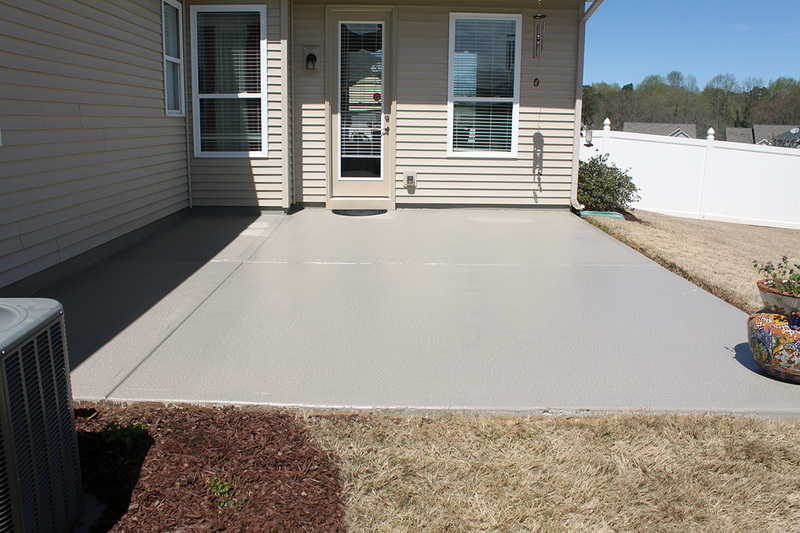 This type of polymer-cement based concrete coatings can endure for years. Concrete patio, lanai, and multi-level pool decks containing many varieties of negatively-formed islands for use as landscape bed, planter, cascading fountain, rock waterfall, and like-kind areas for placement of flowering specimen trees and plant clusters. 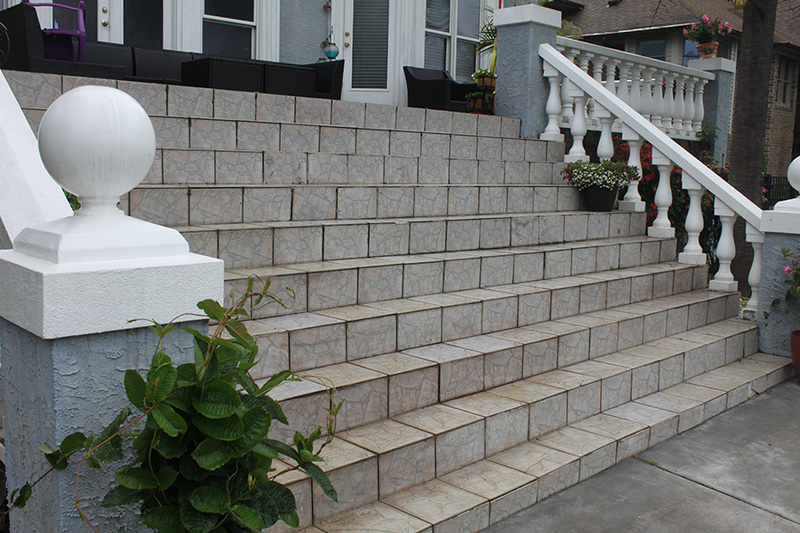 Concrete structures for landings, steps, ramps, and entertainment spaces. These projects can be left natural or customized with synthetic, non-slip, concrete finishes, knock-down, or resin-based stone finishes. 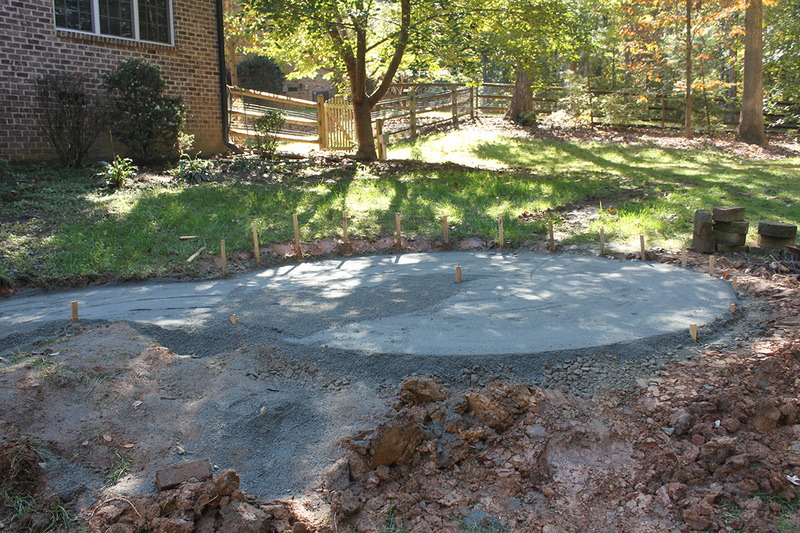 My concrete forming skills include structures for use as fire pits, grilling, and ponds. Designtech Projects offers kithcen remodeling. 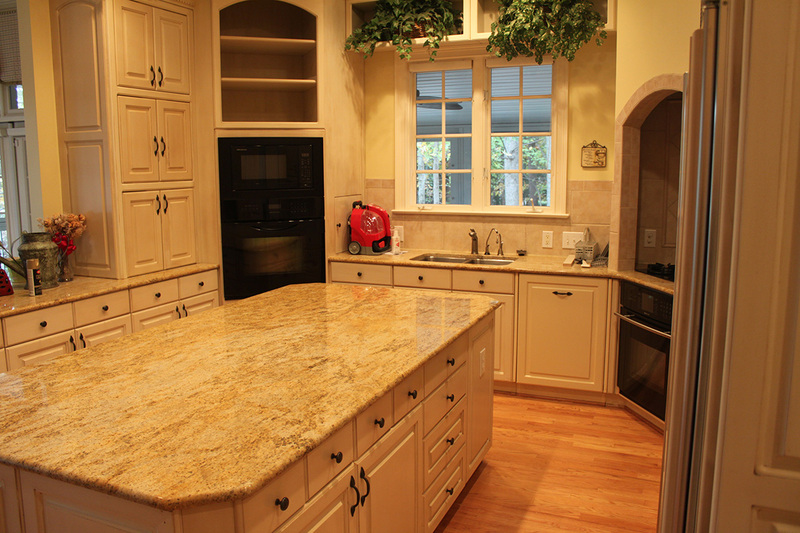 Select your cabinets, countertops, and appliances. Select your flooring, paint samples, and design decor and your kitchen remodeling project is completed on time within budget. Designtech Projects offers floor tile projects including ceramic tile, porcelin tile, and custom designed floor tile emblems. Designtech Projects has done whole home tiling projects or limited to one room such as floor tile for a dining room, kitchen, living room, or bedroom. Designtech Projects offers kitchen tile projects at cost-effective price points. The kitchen depicted in the applicable image shows a kitchen tile backsplash. Designtech Projets offers tile countertops, tile backsplash, tile surround for kitchen preparation areas, and tile emblems for decorative tile designs. Non-slip concrete coating projects. 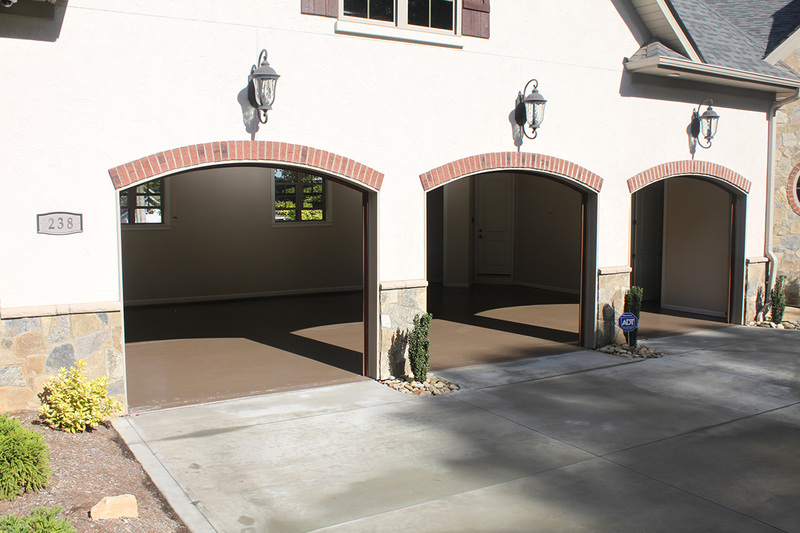 Many concrete coatings are popular in residential garages, commercial warehouses, dealerships, and retail showrooms. 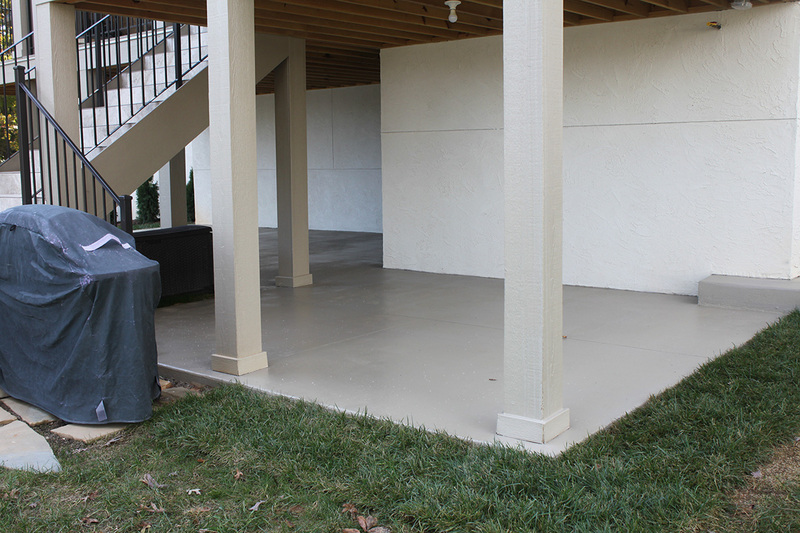 As depicted in this image, the concrete coating is applied directly over sanded concrete slabs. The concrete surface is pre-filled, rotary-sanded, acid-washed, pressure-washed, patched, and slick-floated to correct apparent surface imperfections. The multi-task application results in a hard and durable non-slip concrete coating finish which stands up to heavy equipment and vehicle traffic. Perfect to diminish concrete dust for use in warehouses, dealerships, and retail showrooms. I spent years building various furnishings in my woodworking shop. Most often I utilized my own rough-cut wood materials. A felled tree would be rough cut by the sawmill and stacked and stored for drying. I enjoy building furniture, cabinets, and wishing wells for family and friends. In the image, all of that oak cabinet came from my oak tree except the rail detail along the top perimeter. All cutting, gluing, clamping, sanding, and finishing occurred in my workshop. The glass panels were crafted by a local Artisan using sand blasting. The finish was a blend of stain and several applications of a high-quality 20% sheen finish. Designtech Projects offers concrete coatings for use on pool decks, patios, lania, sidewalks, driveways, and garage floors. 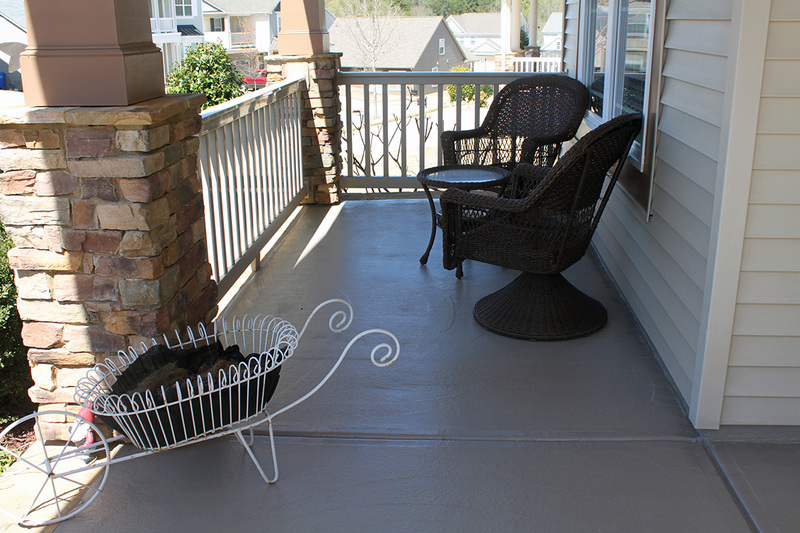 Any residential concrete surface can be improved by application of decorative concrete coatings. 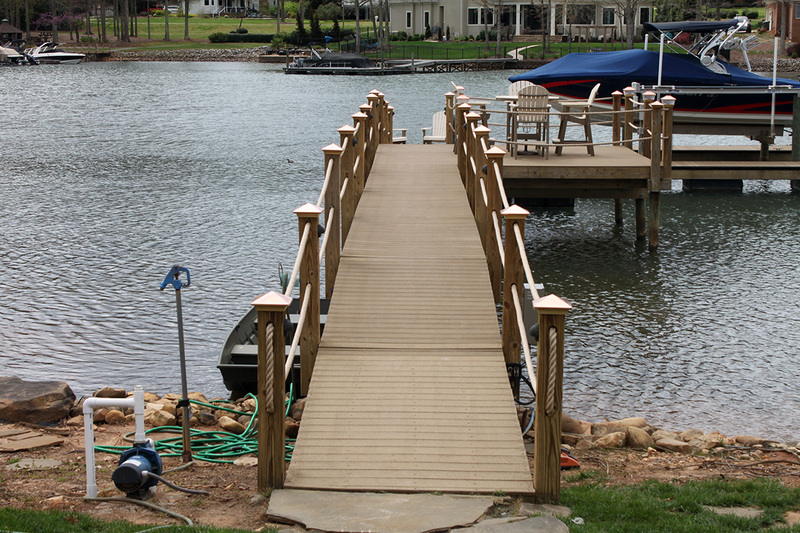 Many homeowners find useful a solid walking surface while transitioning from their homes to various entertainment areas including dock and boathouse. A concrete form project can include ramping, steps, and landing platforms to conform to your specific needs based upon your particular topography. Each concrete project is durable by increasing the strength of the mix, by adding wire mesh or fiber reinforcement and by utilizing continuous rebar along perimeters. 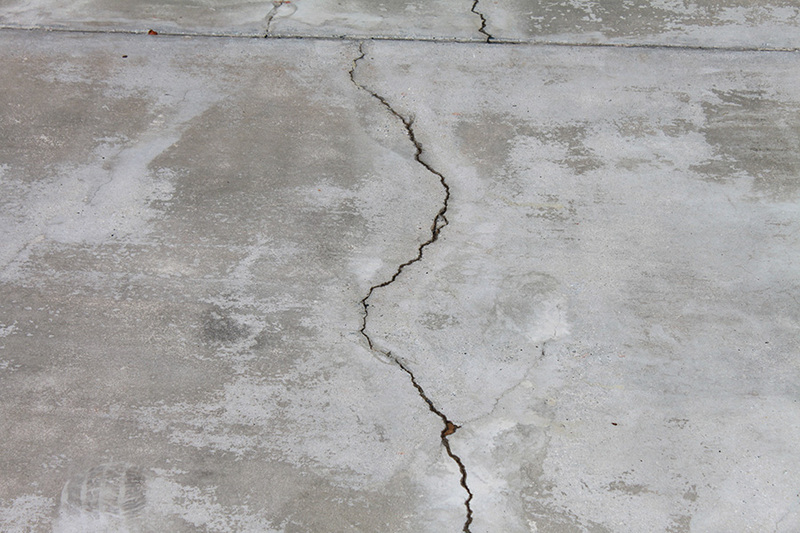 The proper placement for expansion joints can substantially diminish irregular, unsightly, surface cracking. 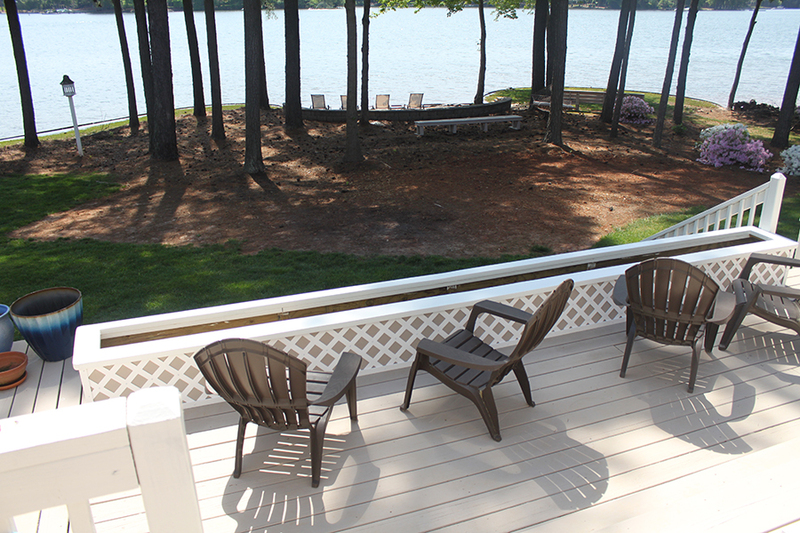 Many homeowners find a wooden deck to be a pleasing and restful addition to their residential properties. 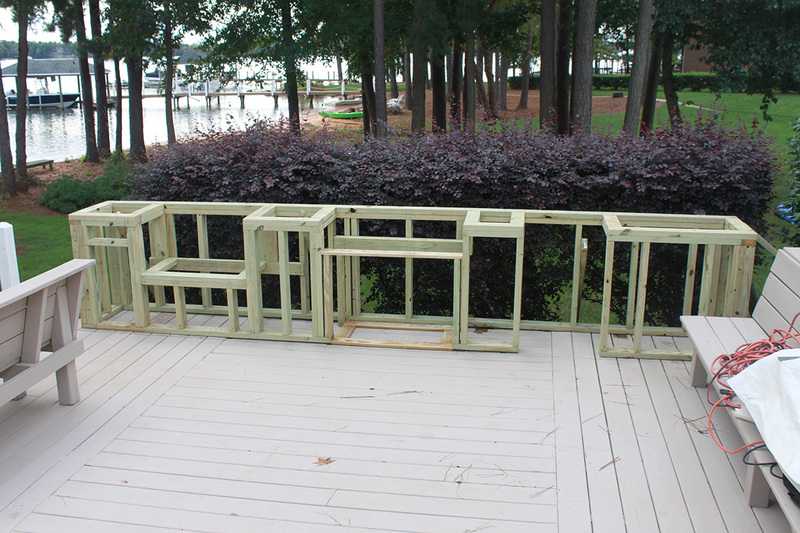 When I bid a wood deck project I include extra time to finish the work in a manner consistent with a safe and enduring structure. 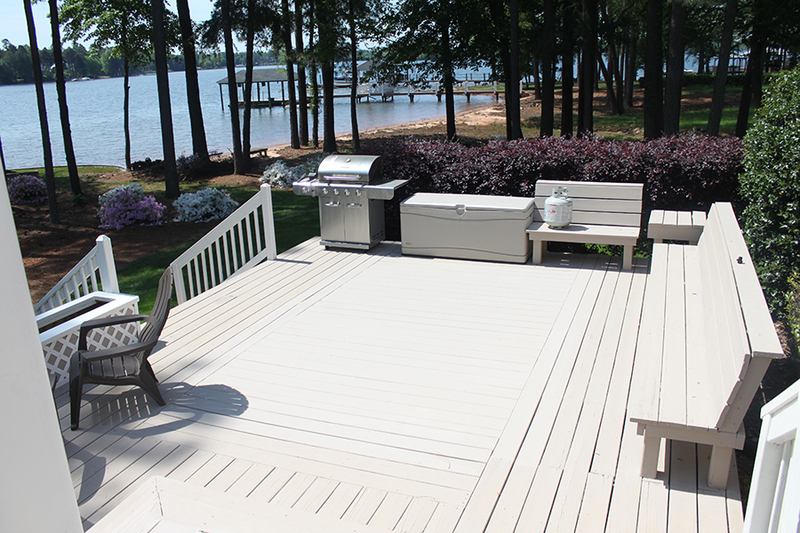 All exposed deck boards and rail boards are rounded, sanded, and coated with environmentally-friendly wood sealer including quality hardware. 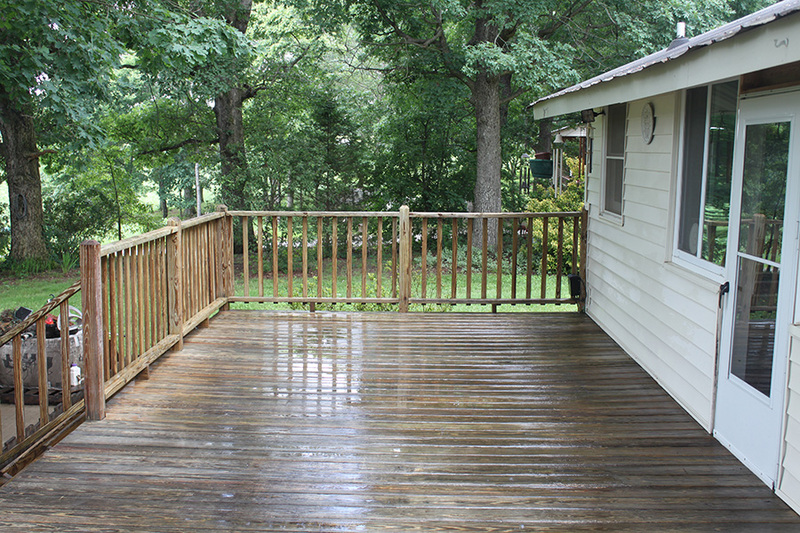 When my wood deck project is completed the work glistens as shown in the requisite image. This home improvement involves the design and construction of an entertainment area in the bakyard of a residential property. This home improvement consists of a custom-built cedar bar with cedar glass rack. The top of the bar was decorated with various seas shells and protected by a thick, poured-in-place, epoxy resin bar top. Designtech Projects offers composite decking. 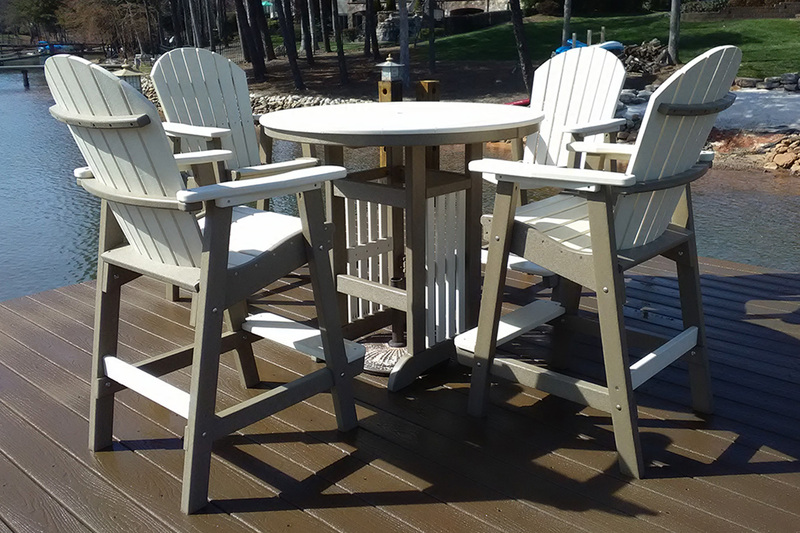 A composite deck has the look and feel of wood but is manufactured with composite materials impervious to seasonal weather. 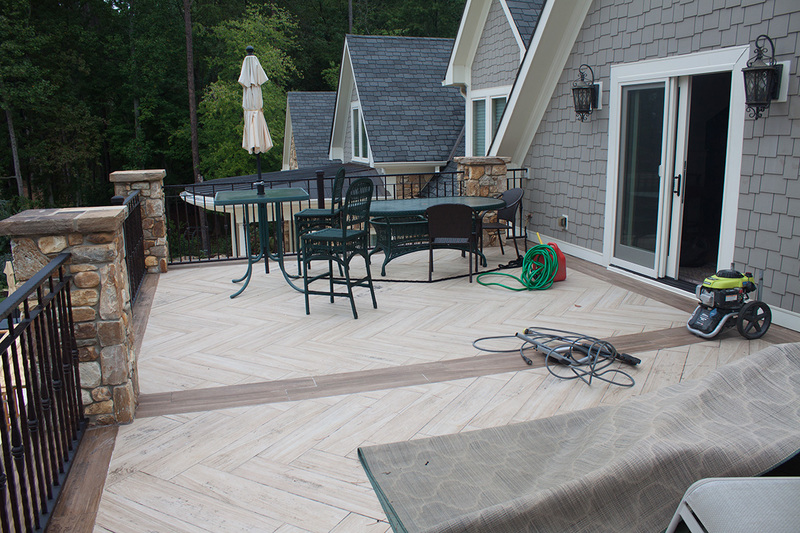 Rain or shine, a composite deck looks wonderful year over year. 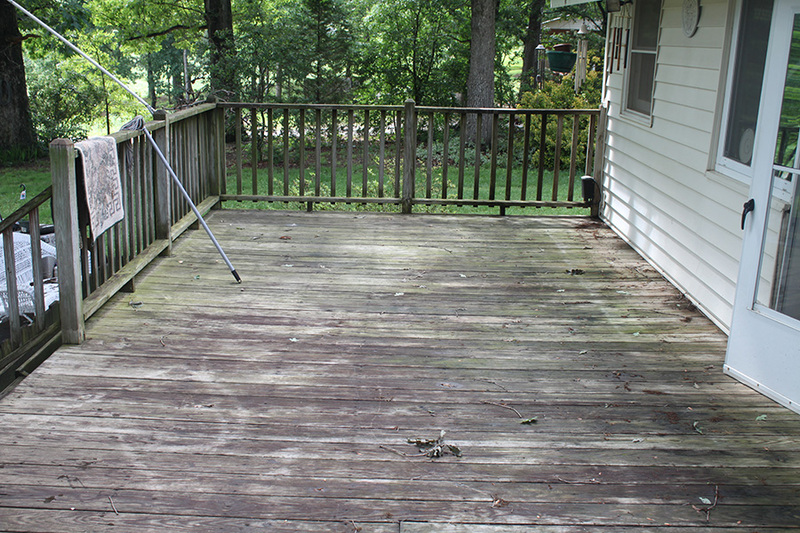 Other than an annual pressure-wash the composite deck stands the test of time and substantially reduces annual maintenance most notable of wood decking outcomes. In this image the entire rear elevation of the home contained a composite deck with all stainless steel hardware and screws no nails. Designtech Projects offers concrete landing to utilize as an overlook and to transition between various property elevations. 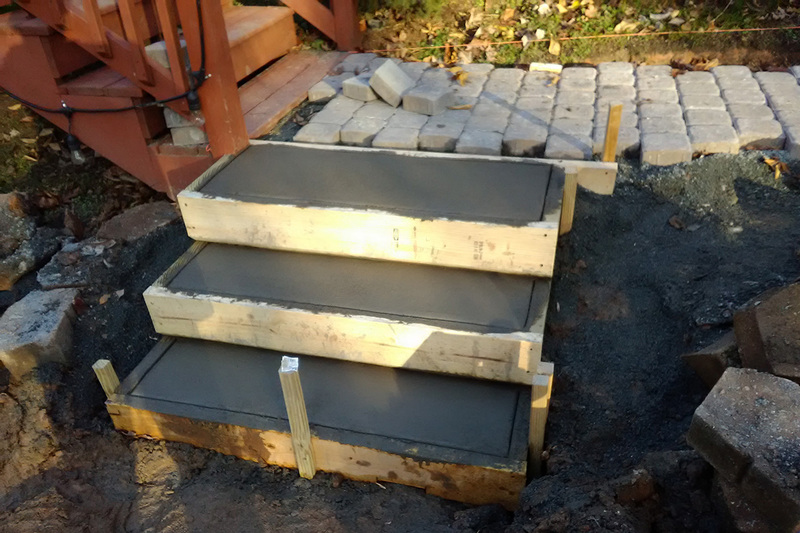 The concrete landing is especially important to construct concrete steps and concrete ramps for use to arrive at the lower-level dock and other entertainment areas within hilly properties. Designtech Projects offers built-in shelving to achieve the outcome intended by interior design changes. In addition, built-in shelving is a popular choice for use in spare bedrooms when re-purposing a spare room for use as a home office and other shelving and storage purposes. Designtech Projects offers drywall repair to change the interior walls to achieve floor plan changes, open-air design modifications, and to implement new and improved functionality between rooms. All drywall work includes hang-n-finish with several finish applications ranging from spray textures, knock-down, and slick finish results. Designtech Projects offers floor tile installation. The variety of flooring choices involves ceramic tile, porcelin tile, stone flooring, and custom designed, polymer-based tile designs utilizing concrete-coatings. All work is performed on-time and within budget. 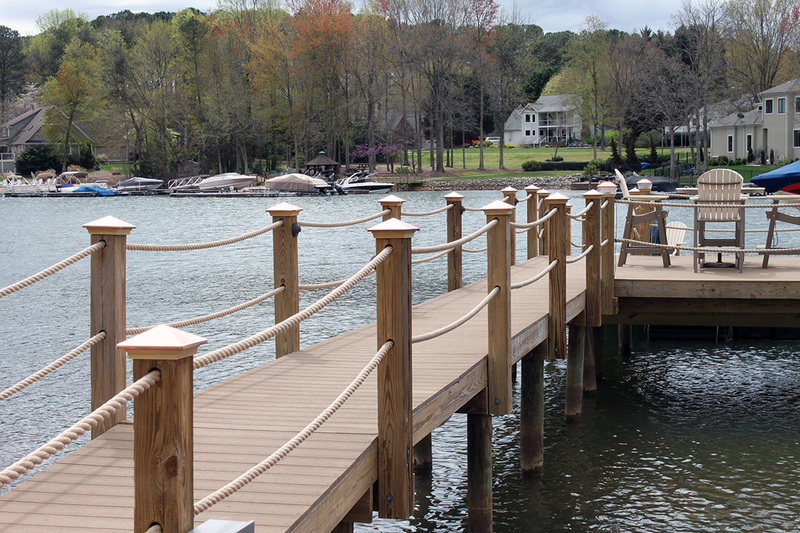 Dock & boathouse projects are built with exceptional quality at affordable price points. No short-cuts! 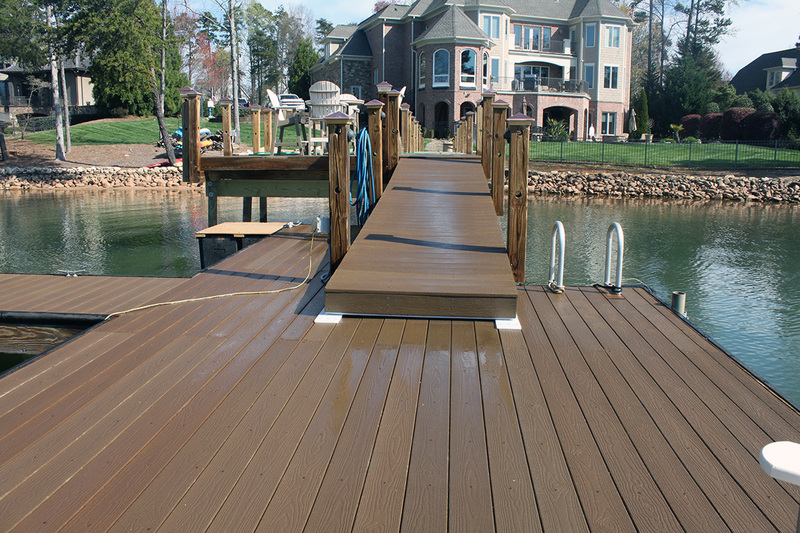 Each deck, dock, and boathouse project is performed in the identical manner I utilize each and every time. The structure is always over-sized, exposed deck boards are rounded by router, sanded, sealed and all work is screwed without any nails anywhere. All screws are countersunk to avoid the dreaded toe tear. 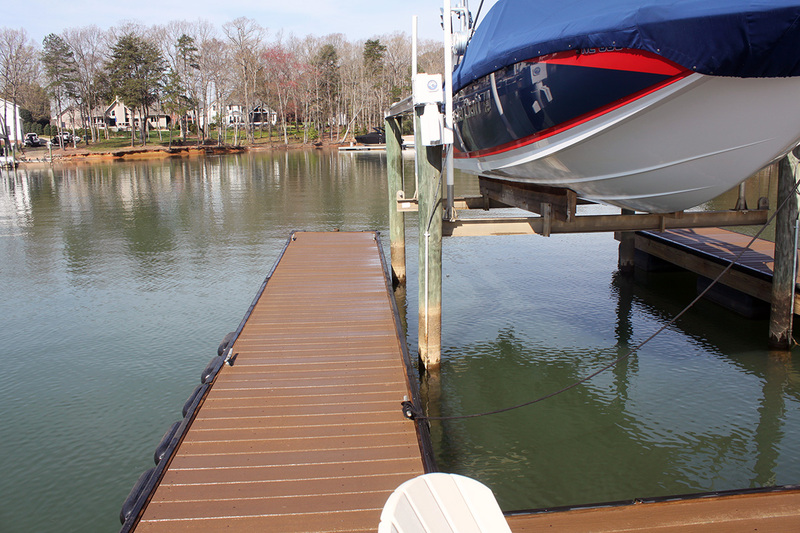 Your deck, dock, or boathouse will glisten and the price will be very cost-effective. 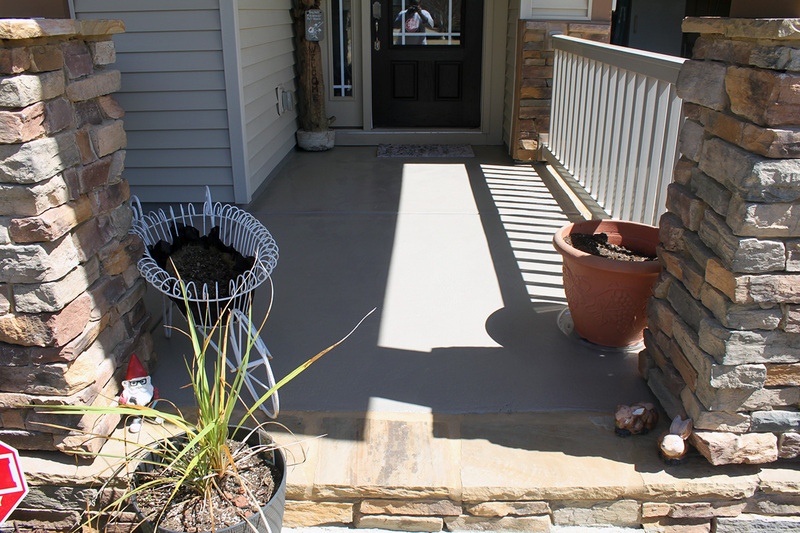 Concrete coatings include a variety of material selections, colors, and designs. You will select your choices prior to commencement. 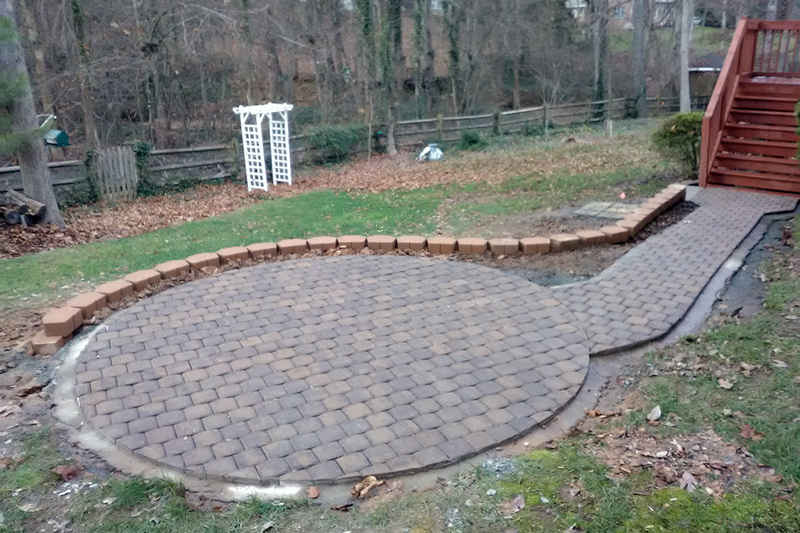 The work can include chattahoochee river rock, polymer coatings, pavers, and stenciled patterns resembling pavers, brick, and stone. As compared to actual brick and actual pavers, this type of decorative concrete coating can save tens of thousands of dollars in material and labor. 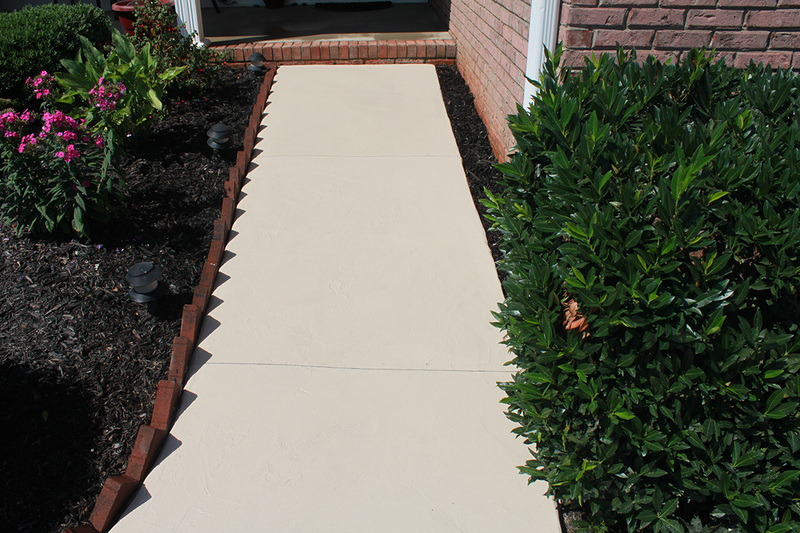 Stamped coatings can create the appearance of stone, brick, and pavers at substantial discount. 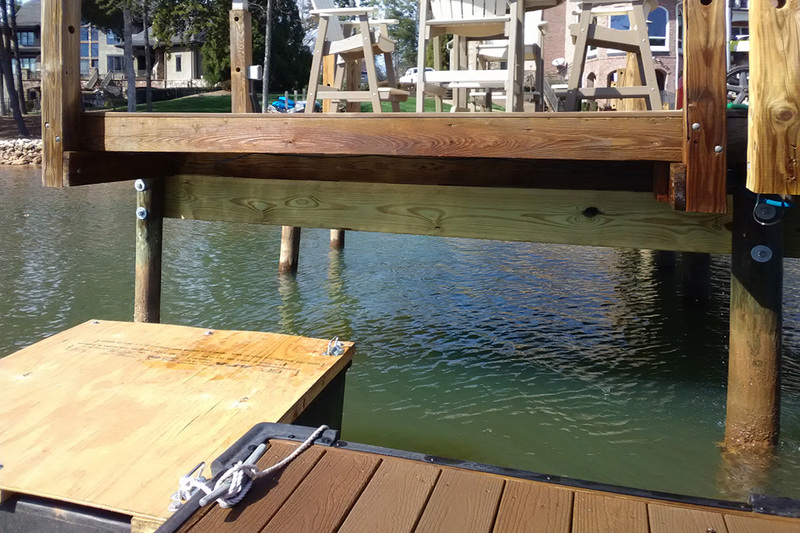 Designtech Projects offers cost-effective dock designs including exceptional carpentry skills, concrete placement and finish, and a myriad of selections for your next concrete coatings project. Depicted here notice the radius dock railing bent around the radius seawall plus privacy balisturs using rock-solid 2×6 pressure treated lumber. I routered all exposed wood and sanded and sealed with several coats of environmentally-safe wood treatments. Designtech Projects offers storage buildings for many uses including business record storage, work shop, home-office, game room, and guest quarters. As shown here, the storage building consisted of block walls, stucco, and roof trusses. I finished that storage building with drywall and paint. The property was sold to a medical group offering a community-based heart and circulatory practice. 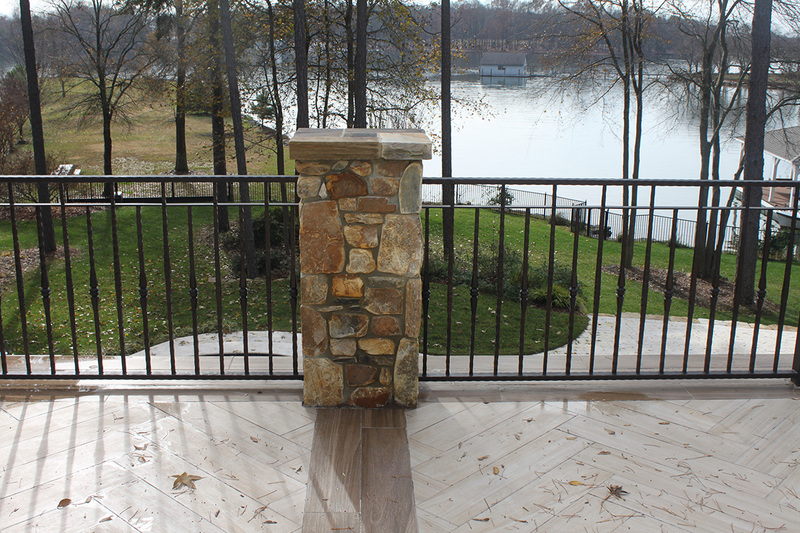 Designtech Projects offers customized retaining wall systems to coordinate with landscape themes. A customized retaining wall can capture the soils along a steep topography to significantly increase the area of a backyard. Rather than a steep backyard, the retaining wall increases the useable lawn area and creates room for entertaining areas as well. 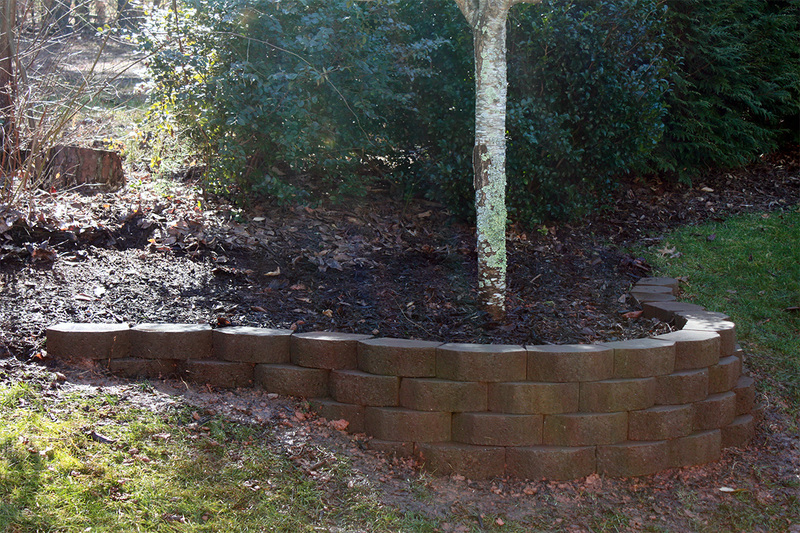 This image depicts a sturdy, wood retaining wall. The customized retaining wall can also be constructed with stack block, solid reinforced concrete, rock walls, boulders, and several types of synthetic building materials. Designtech Projects offers custom tile projects including wall tile, fireplace tile, and custom emblem designs. When precise and accurate results are needed contact Designech Projects.